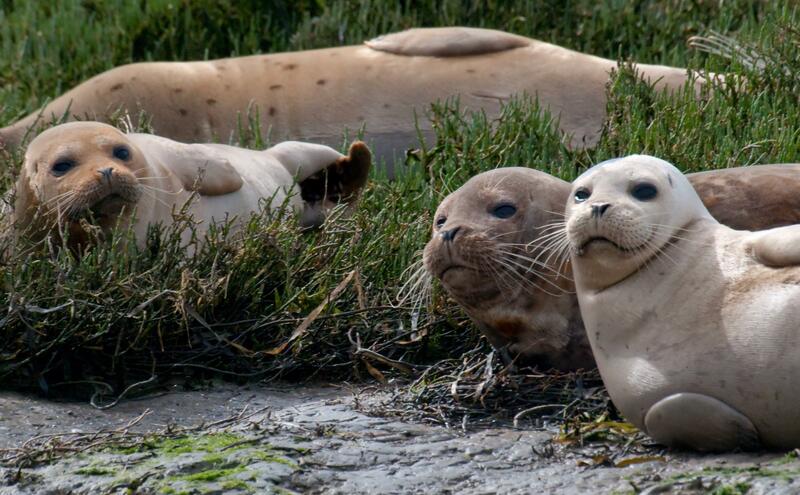 For an unforgettable wildlife experience, I highly recommend the Elkhorn Slough Safari in Moss Landing. 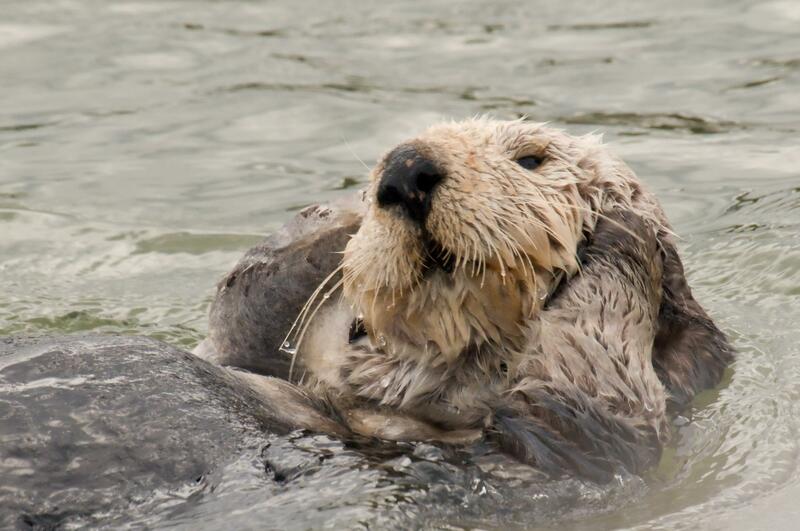 We saw over one hundred sea otters, almost eighty harbor seals and dozens of sea lions very up close and personal. This photo shows a raft of about eighty sea otters. Raft is the official label for a bunch of otters hanging out together, looking like a raft. 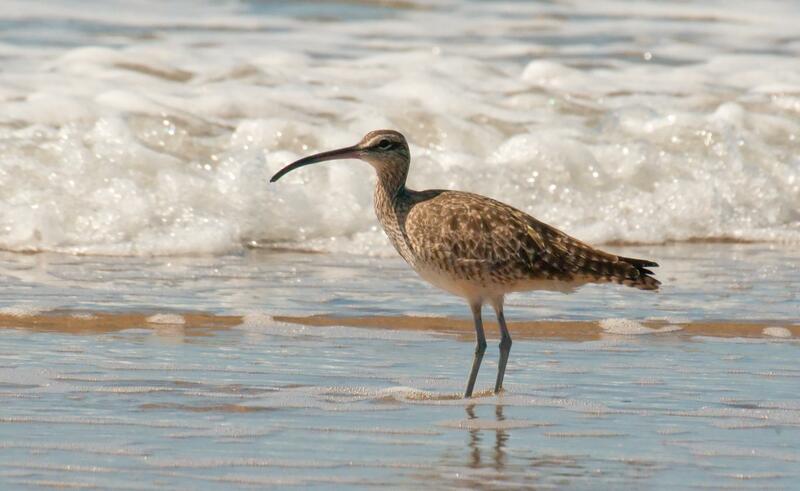 In addition to sea mammals, I also photographed sixteen species of birds. The trip was two hours of wildlife bliss. 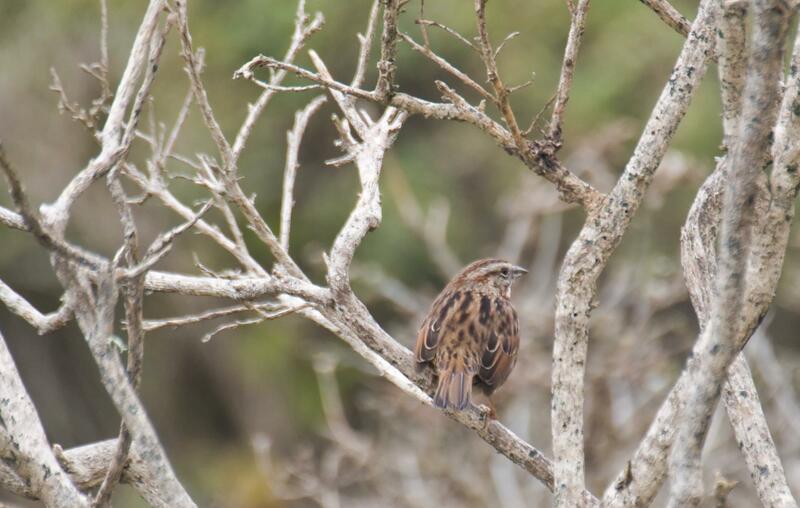 There were a few other bird species I got to see, but they were too distant for me to get a good photo of them. 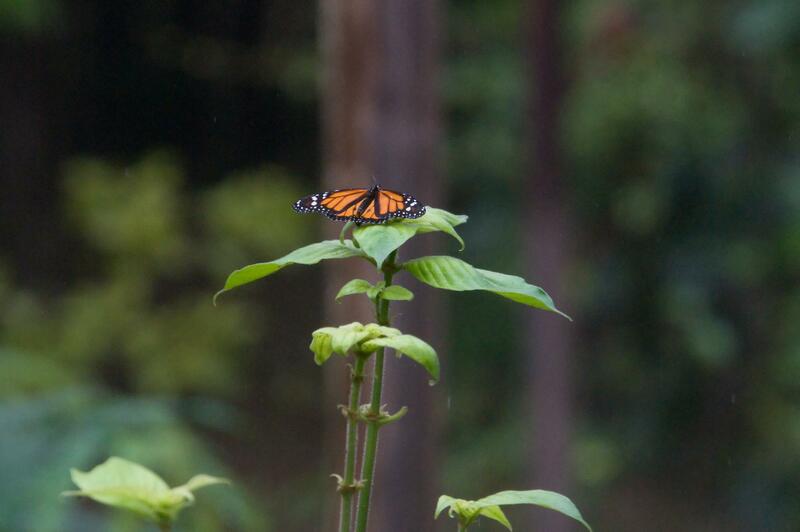 This is a photo of what appears to be a male Monarch butterfly. Male because it has two extra dots on its back wings that produce pheromones. Another obscure fact I learned from Wikipedia. A typical view of the jungle's edge as seen from the boat as we motored past. 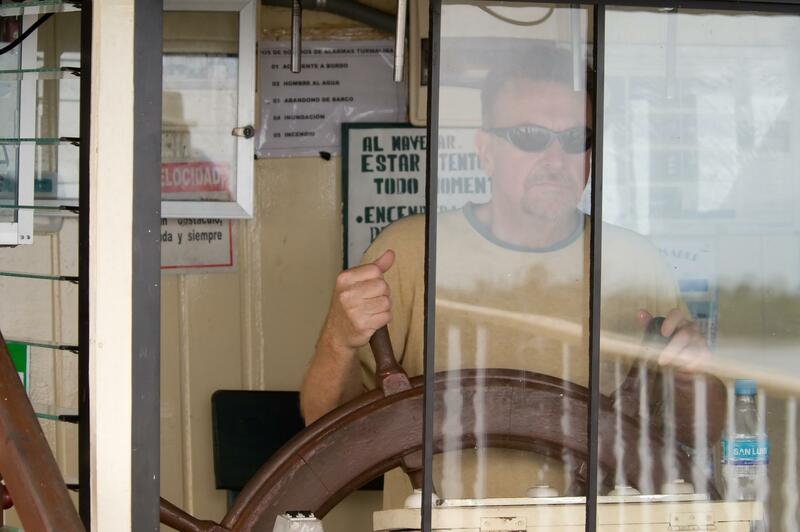 My dashing brother manned the wheel of the Tourmalina. However, he is a man of many talents and helped out in other ways as well. 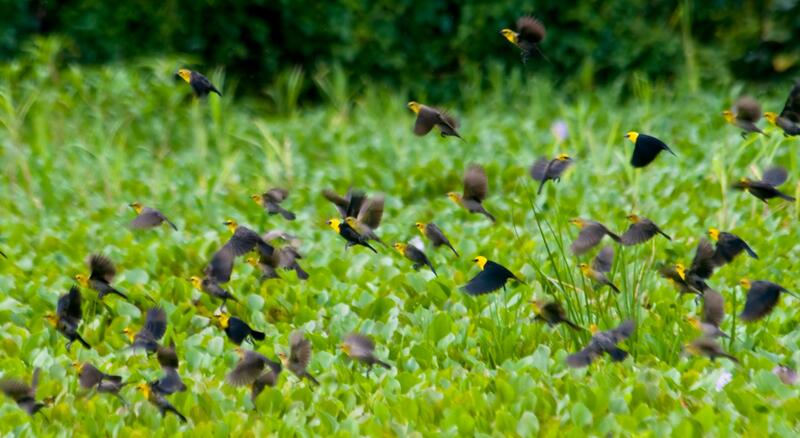 A flock of yellow-hooded blackbirds took off as our skiff came too near. The birds in the photo that are deep black were the males and the brown ones were the females. 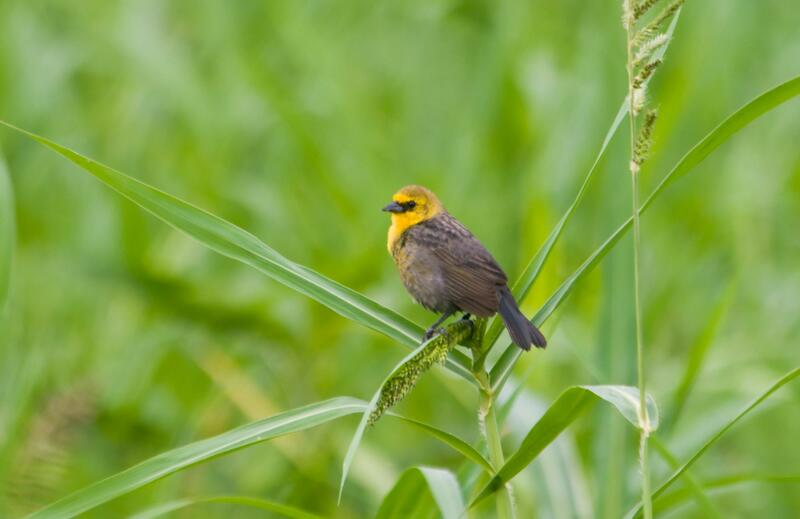 This is a female yellow-hooded blackbird. 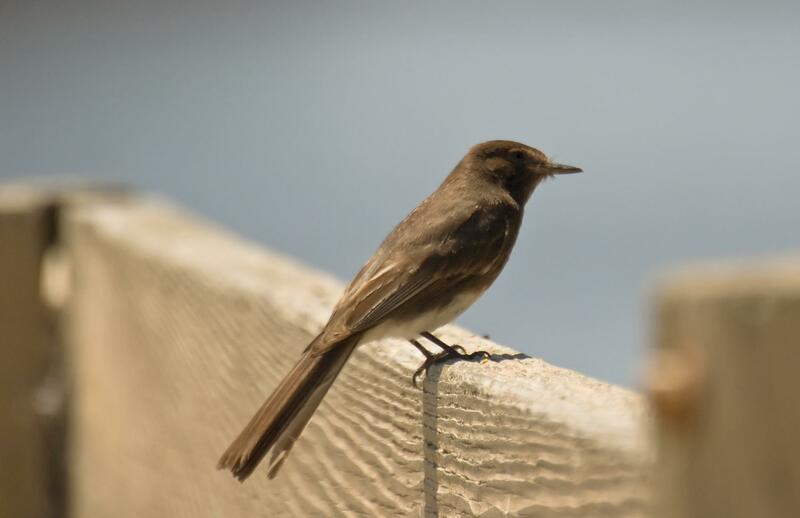 Her body is brown, whereas the male would be glossy black. 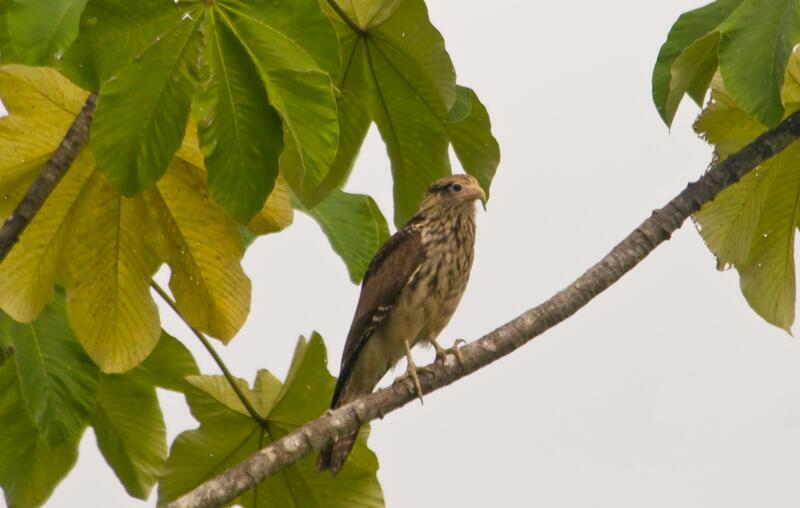 This is a juvenile Yellow-headed Caracara. 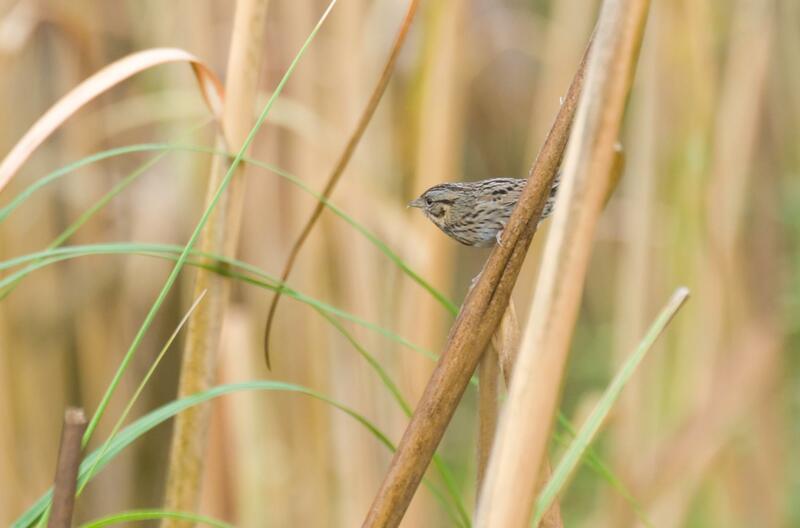 Like most juvenile birds it has lots of streaking to give it more camouflage than the adult. 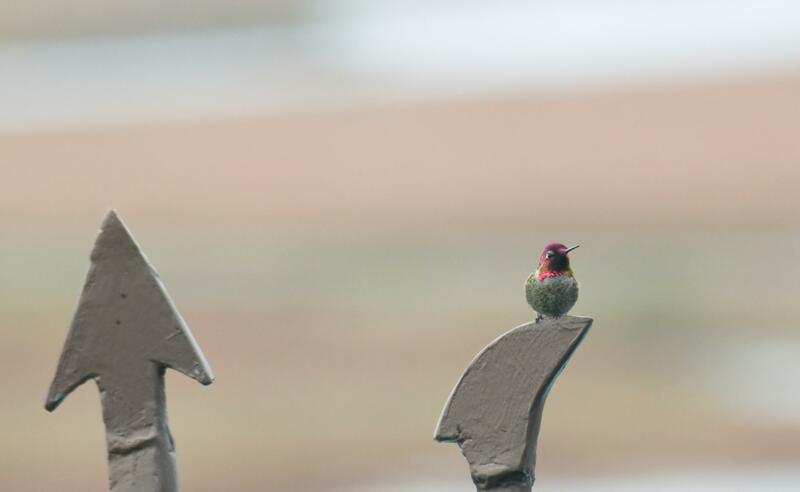 A male Anna's hummingbird perches on Neptunes' trident. 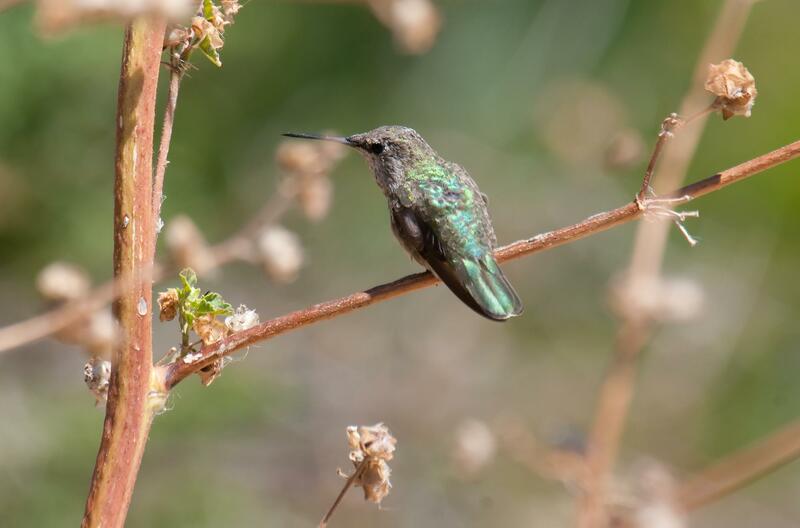 I was surprised to see a hummingbird stay still for so long. A close-up of the hummingbird I posted yesterday. 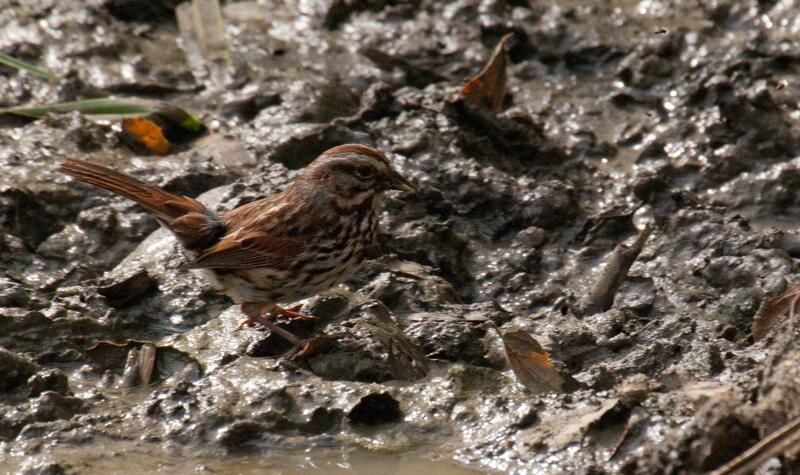 A song sparrow foraging in the wetlands. A tiny, delicate, feathered, everyday miracle. 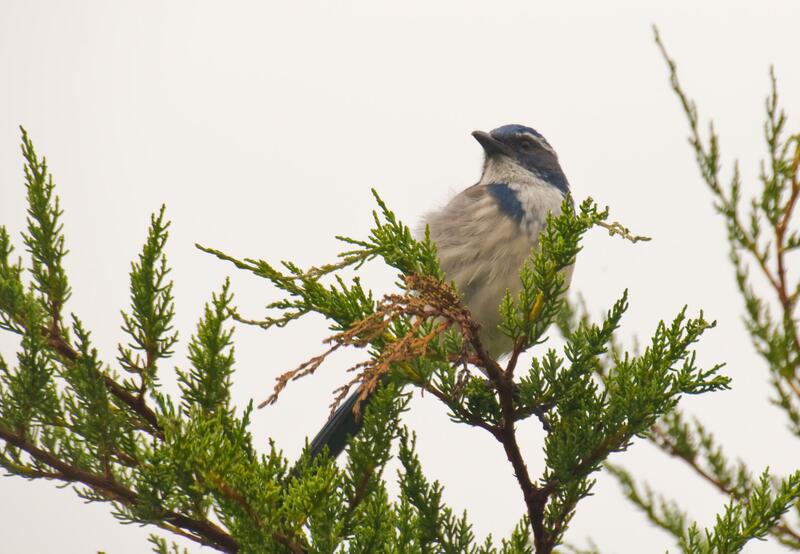 A scrub jay in a tree on a cold overcast day in November. A sparrow on a bare November day. 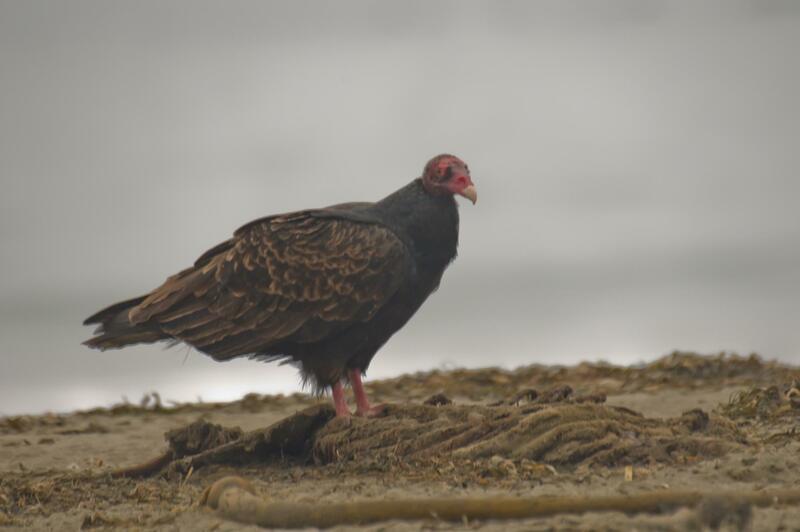 A vulture sits atop the ribcage of a rotting animal carcass on the beach. Offering disgust and fascination in equal measure. Prehistoric looking pelicans sun and preen in the winter sun. 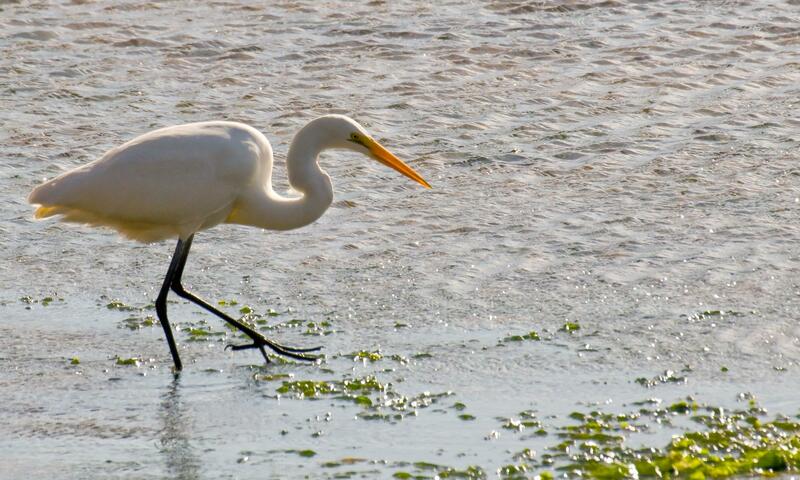 A great egret at the edge of the bay looking for food. It is a very graceful bird whether walking or flying. 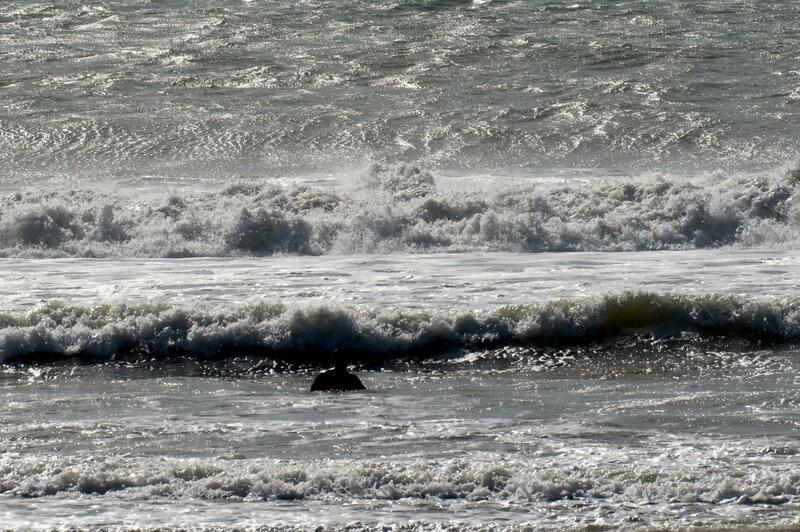 A cold November day didn't keep this foolish man out of the water, but it made a nice photo. 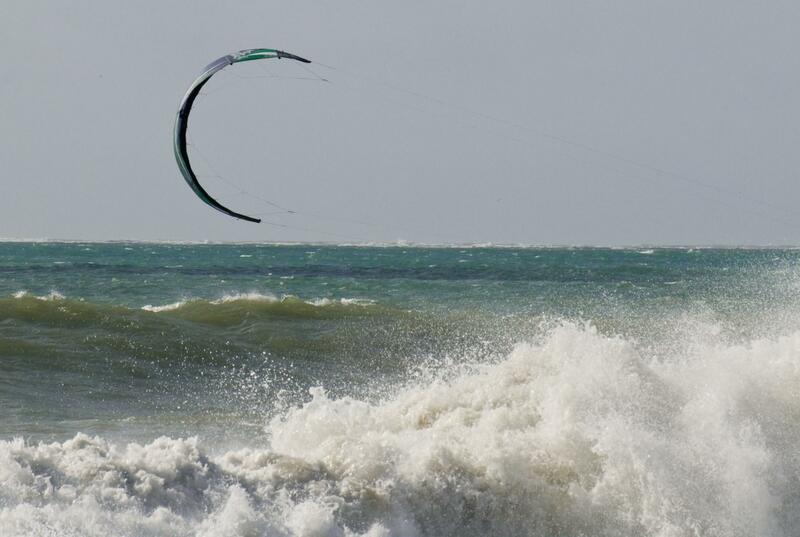 The human animal attached to this kite is on his board offscreen and hanging on for dear life. 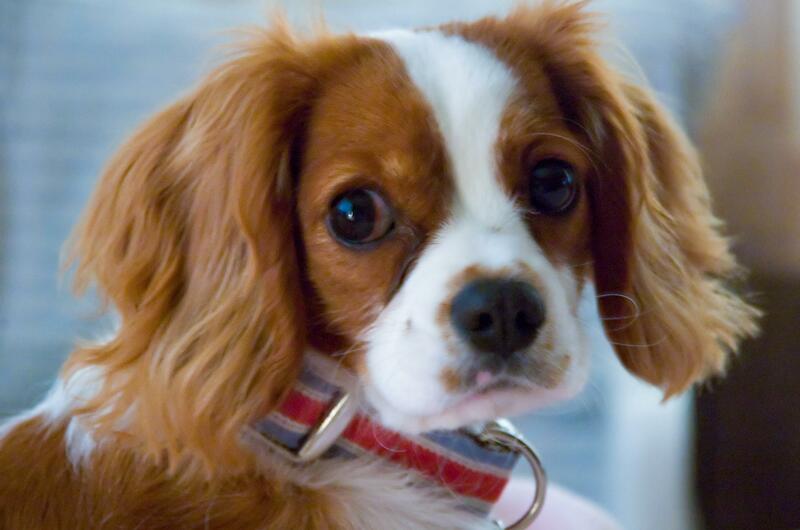 Riley is a Cavalier King Charles Spaniel. A huge name for a wonderful little dog. The King Charles Spaniel (non-Cavalier) is smaller and has a much flatter or more pug-like face. In the '20s the King Charles was bred back to its original size and look and given the Calvalier addition to its name. 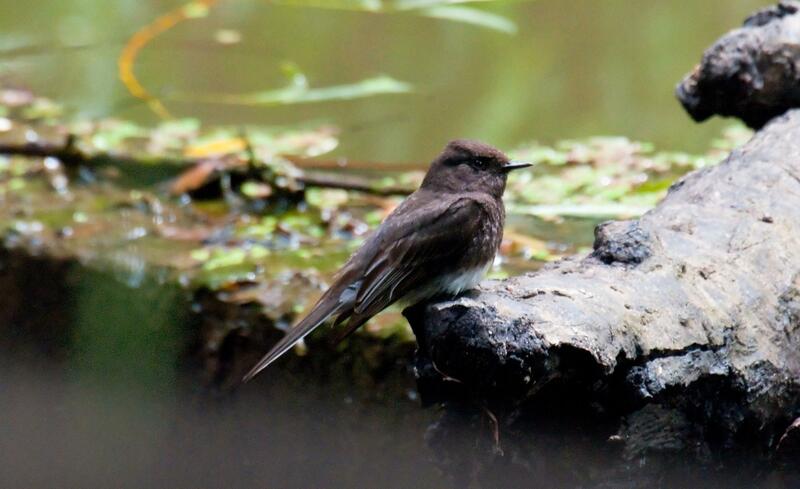 This black phoebe is dark brown and was perched near the Palo Alto duck pond. Phoebes are almost always found near water. 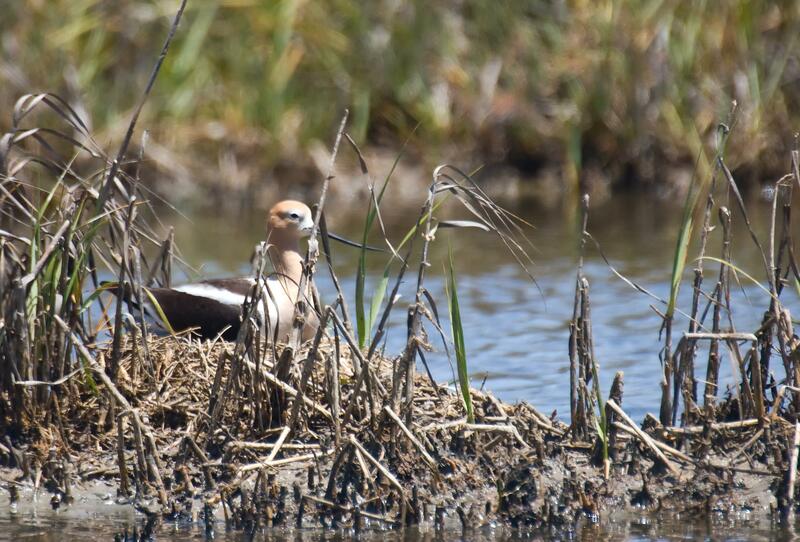 A female avocet sits on her eggs. When the tide comes in this nest will barely be above the water. 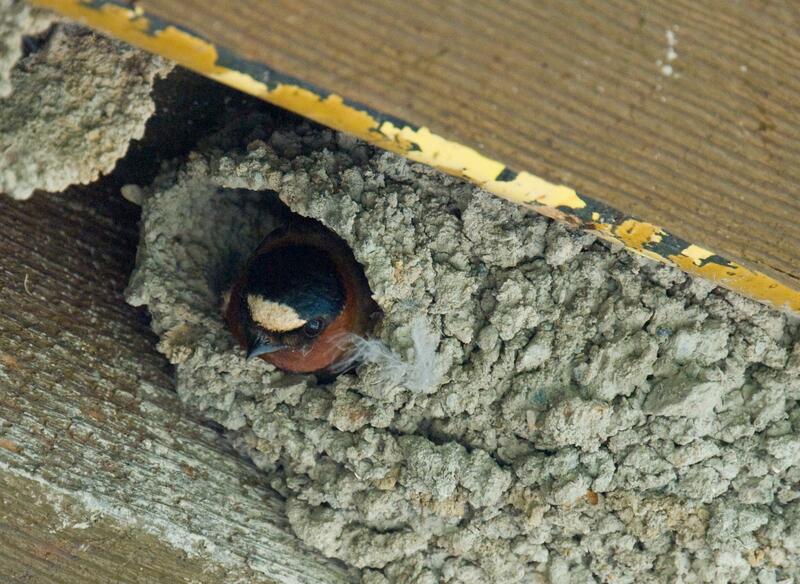 A cliff swallow sits in the opening of its mud nest. Observing me observing him. 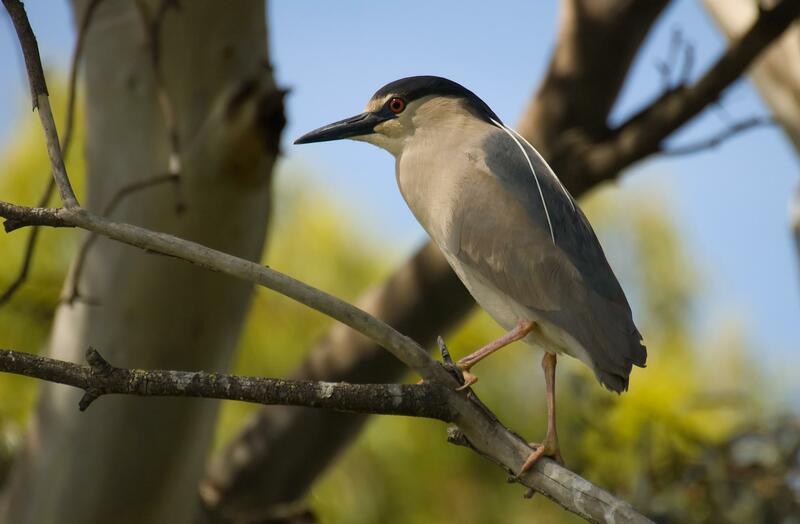 An adult night heron in full breeding plumage showing off its pink legs which are yellow the rest of the year. 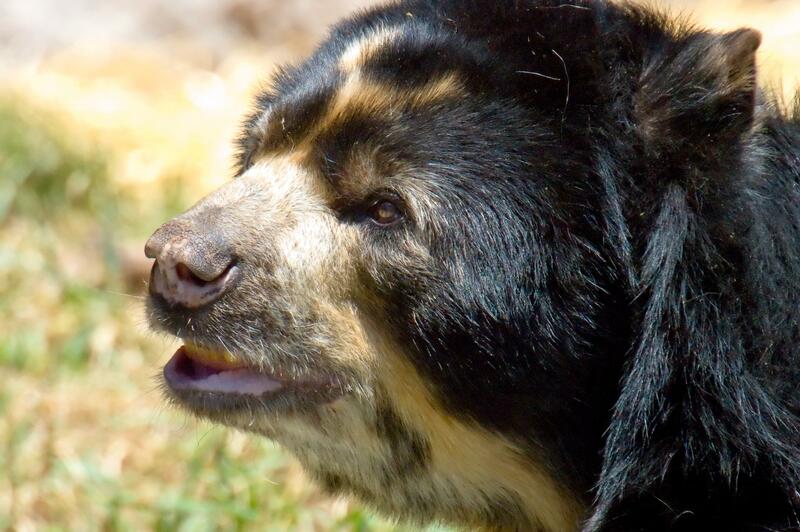 The Spectacled Bear is the only bear that comes from South America. I hope this unique and beautiful endangered bear survives. 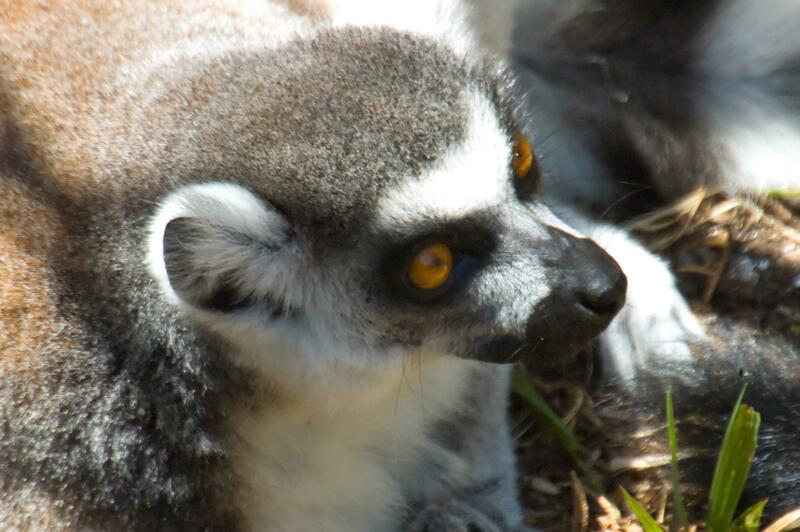 Lemurs are one of my favorite mammals. Every house in heaven should have one. 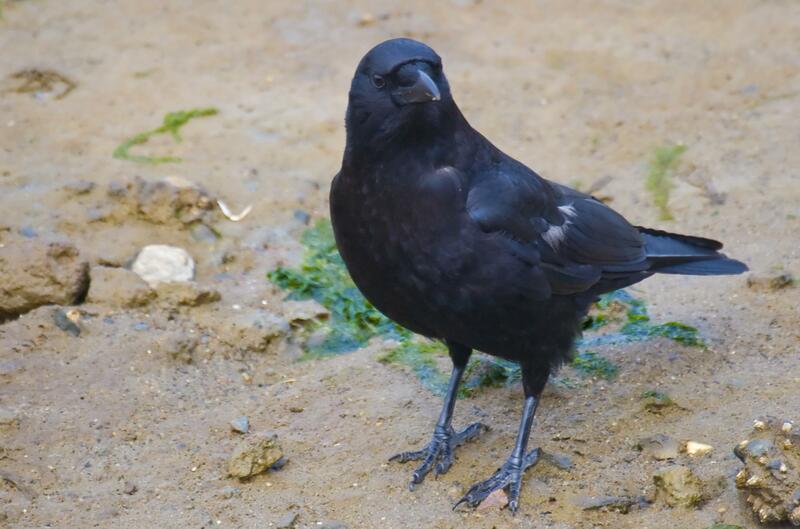 Looking at this crow's feet you can really see the dinosaur common ancestor. I'm grateful most birds are small as I wouldn't want to try to photograph a crow the size of a T-rex. 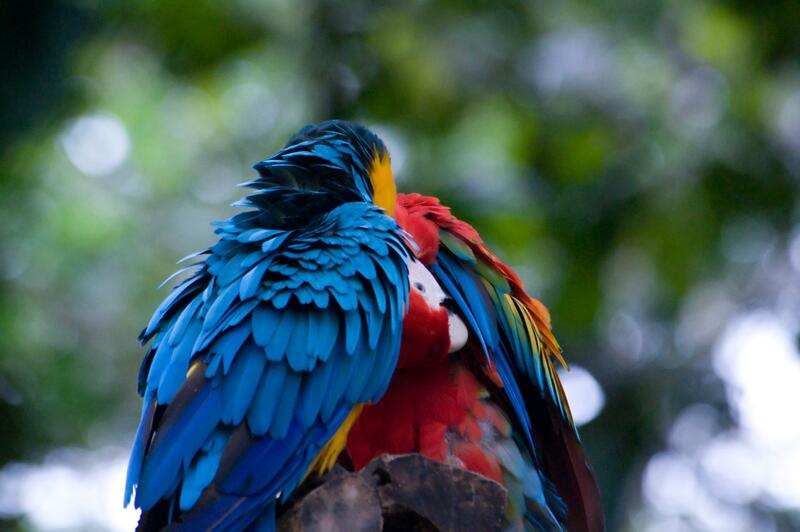 Two Macaws preening one another. A very intimate, gentle moment in a birds' life. 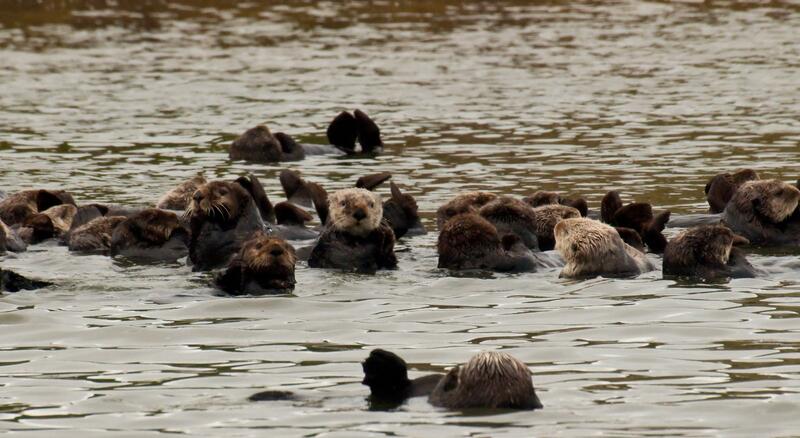 This photo shows just part of a very large raft of otters we saw in the Elkhorn Slough. The older individuals had light faces, and such cute faces they were. 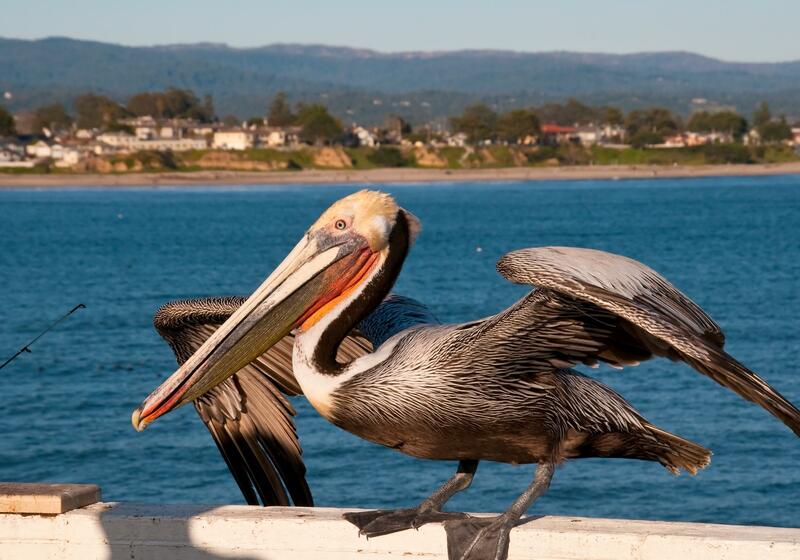 It was beautiful day in Santa Cruz and I had been photographing the sea lions when this pelican landed a few feet away on the pier railing. 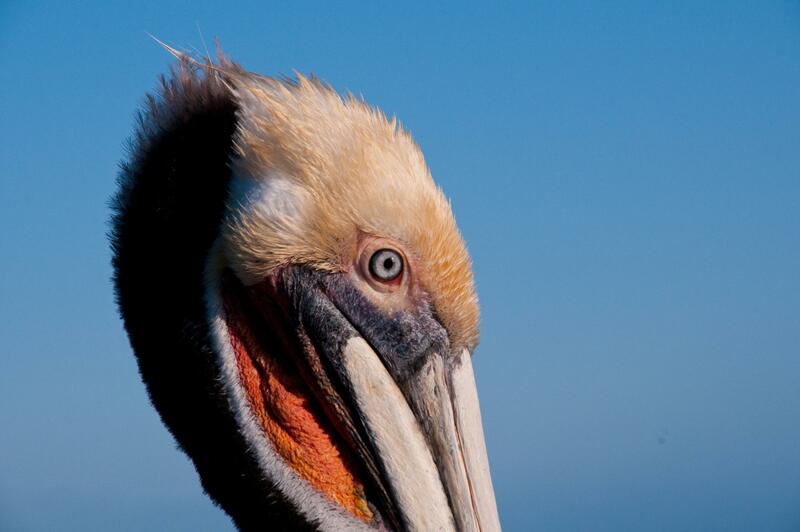 If there was ever a compelling visual argument for birds being the modern descendants of dinosaurs, it's the pelican. I could easily imagine them flying just out of reach above the snapping jaws of some aquatic sea monster. 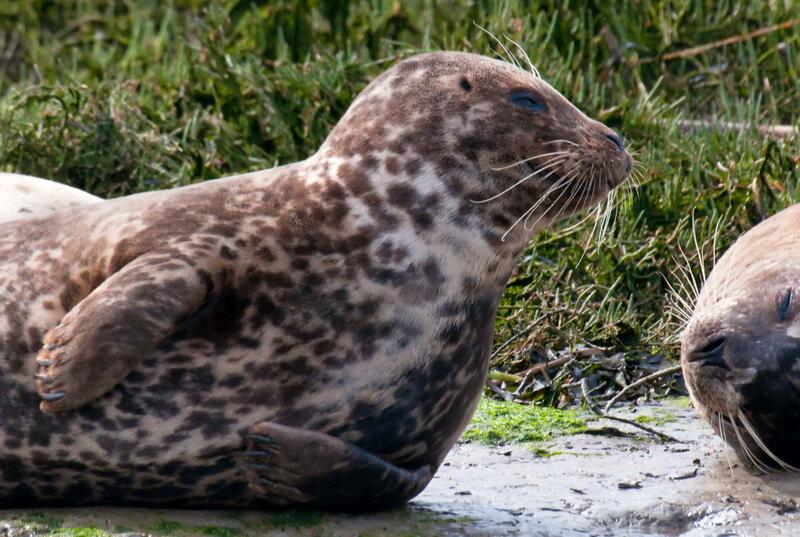 Harbor seals are close to the top of the cute list, right up there next to sea otters. 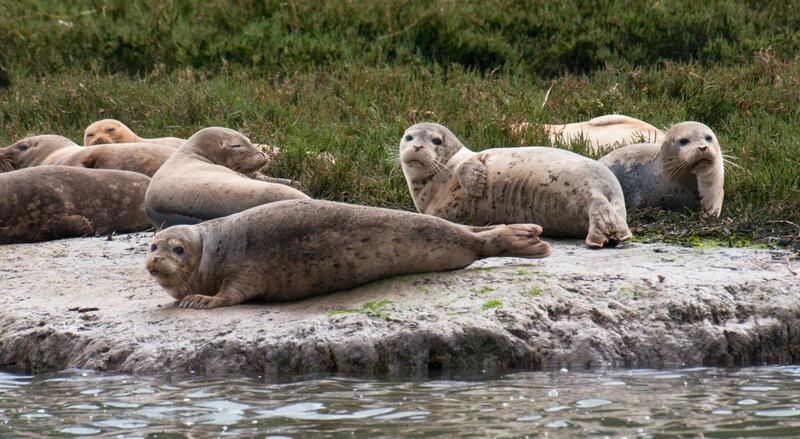 We saw close to eighty harbor seals that day, most of them lying on shore watching us watching them. 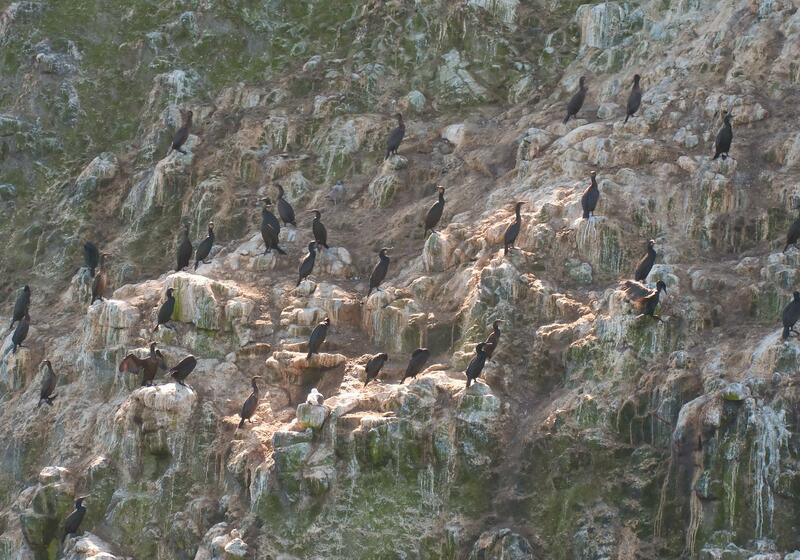 Brandt's cormorants were the most numerous of the three species of cormorants seen that day. 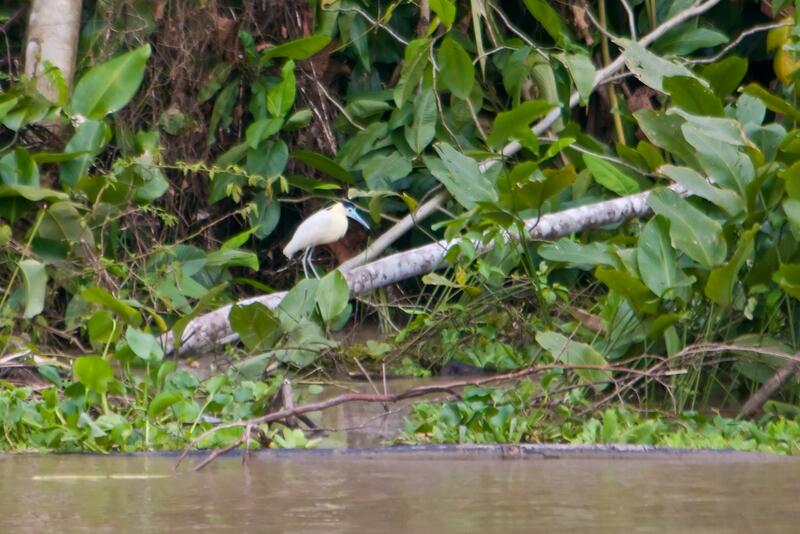 The slender white plumes on its face and the blue patch on its throat only appear during breeding season. 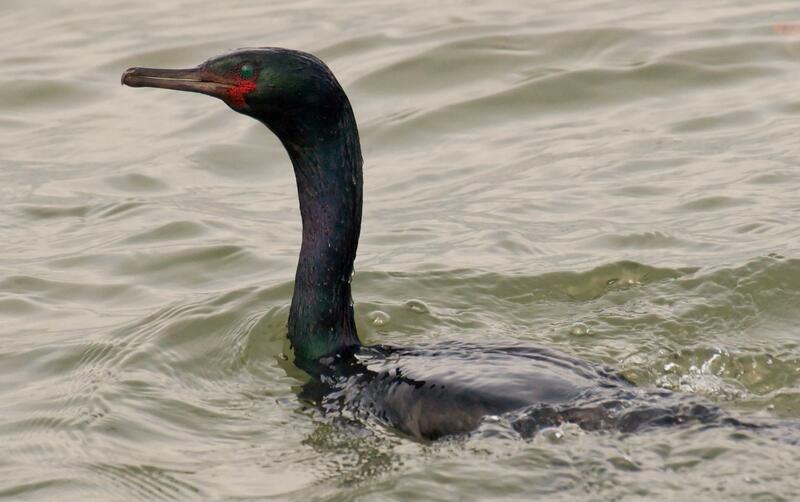 The red color seen in this photo is not part of the cormorant but was from a nearby pelican. Bette Davis eyes? Bedroom eyes? Puppy dog eyes? They've got nothing on harbor seal eyes! 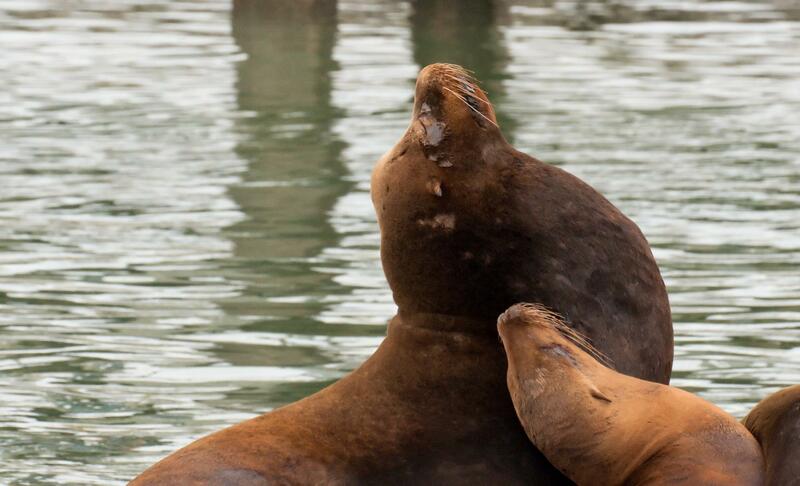 The little slit behind the eye is the ear which is an easy way to distinguish it from a sea lion with its little external ear. A lone individual popped up out of the water after a dive for food. We suspected he has a clam grasped in his paws. 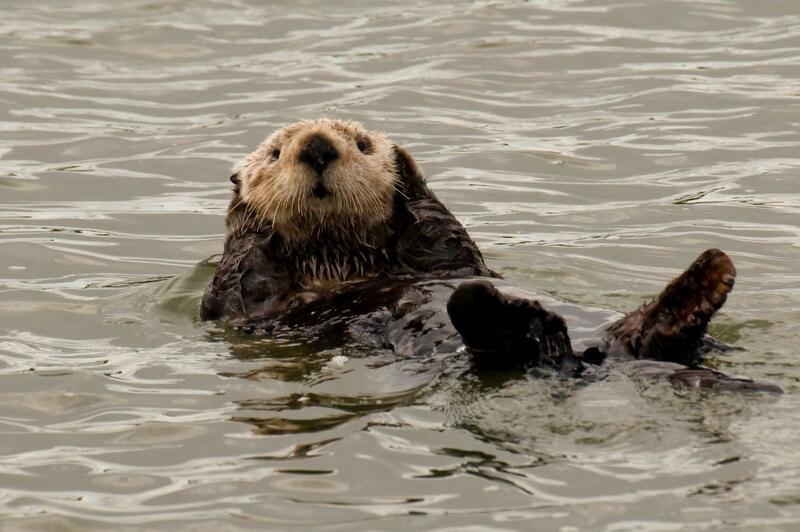 Otters love shellfish. 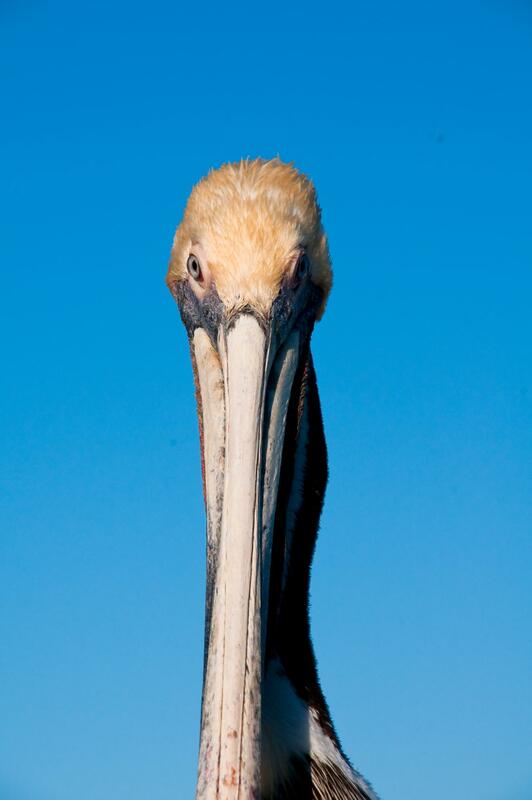 Here is a view of a pelican you don't usually see. A head on view of its enormous bill. 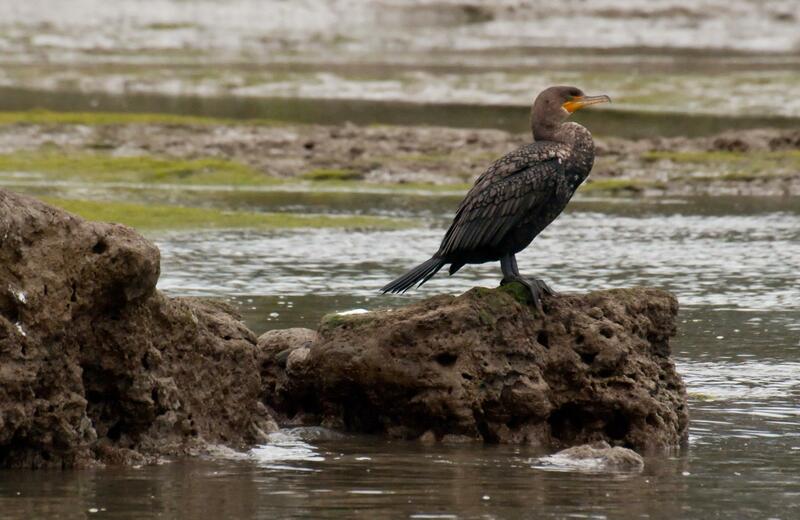 A handsome Double-crested Cormorant posed on a mossy rock for the photographer. 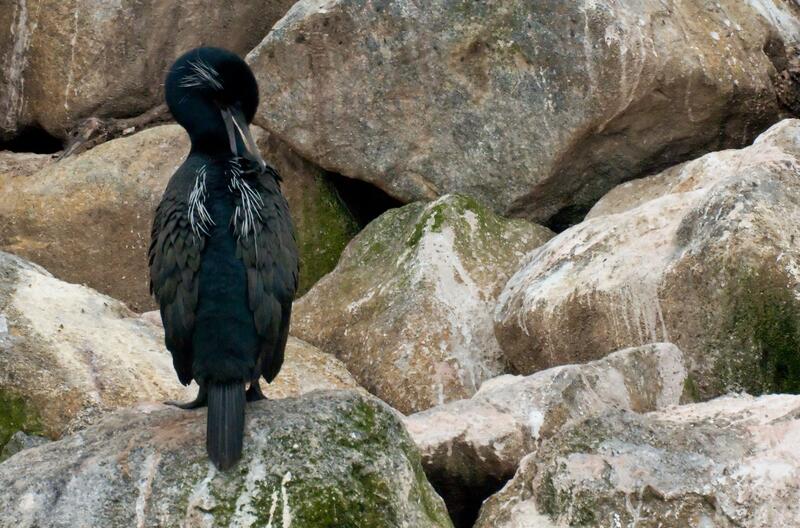 After a dive this Pelagic Cormorant surfaced much too close to the boat and immediately swam away. This photo captured its startled look. 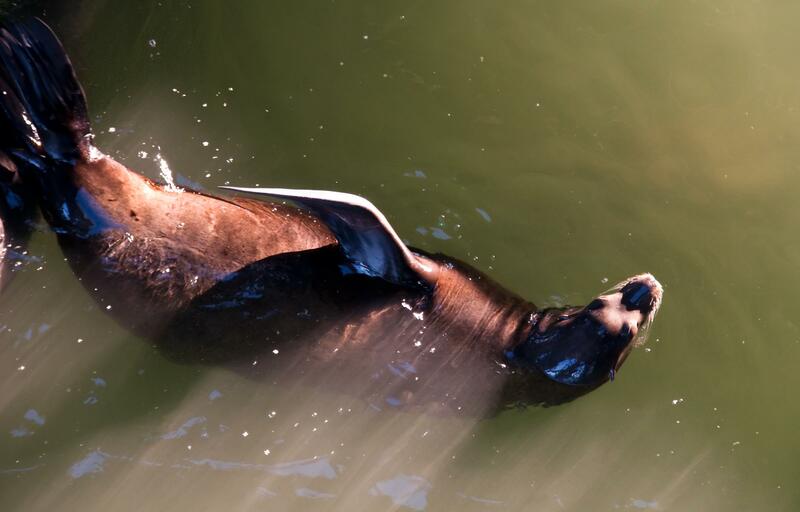 This photo shows a sea lion swimming in the late afternoon sunlight beneath the wharf in Santa Cruz. 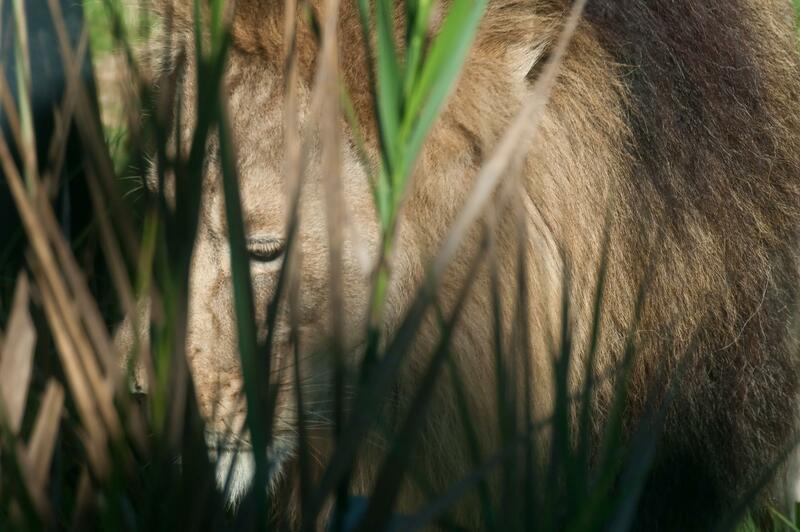 Lovely light on a lovely animal. 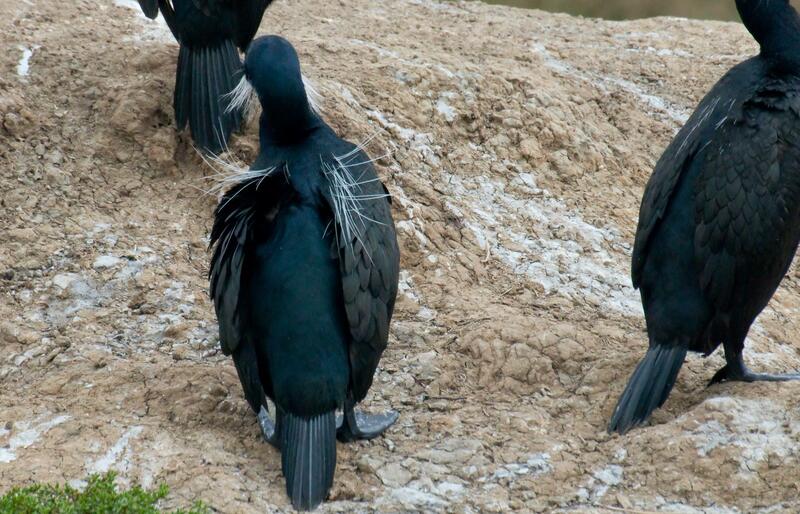 The white plumes that appear during the breeding season are easily seen in this photo of the Brandt's cormorant. 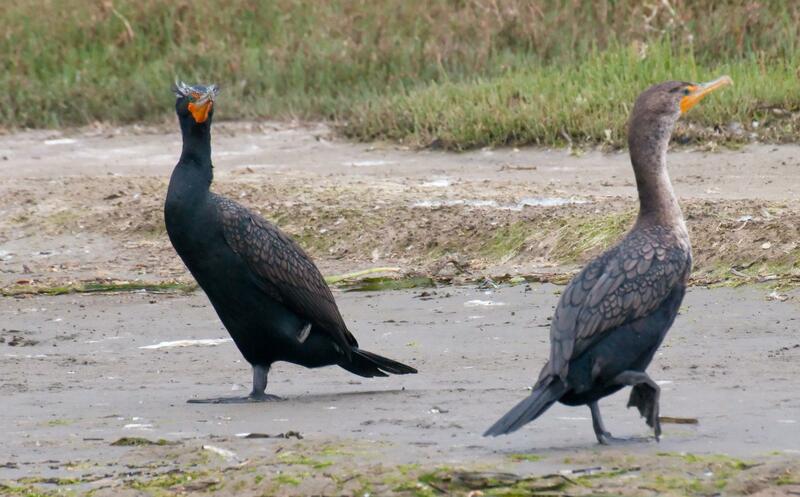 In this photo you can easily see the differences between the adult and the juvenile cormorant. 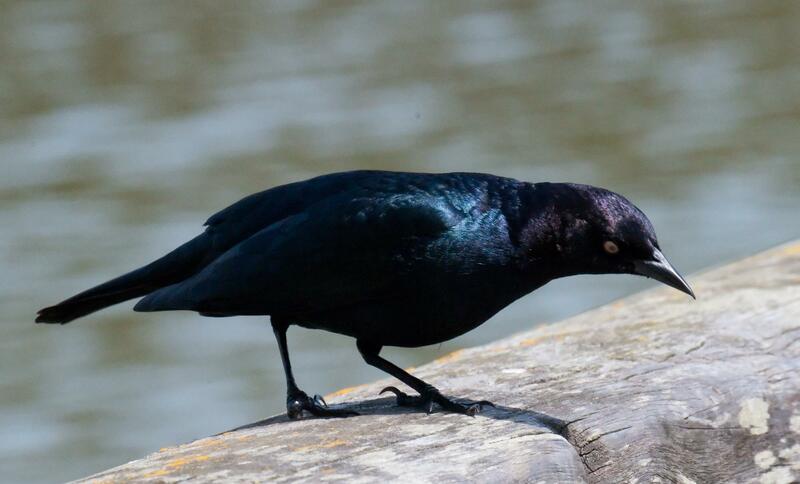 The glossy black bird with prominent "eyebrows" is an adult in breeding plumage. This is one otter trying to persuade another otter to share its meal. It wasn't very successful. 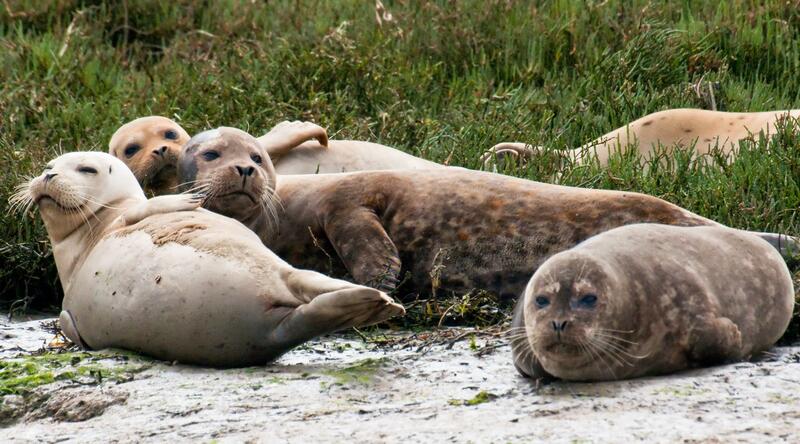 This group shot of harbor seals illustrates their cuteness and wide variations in colors. 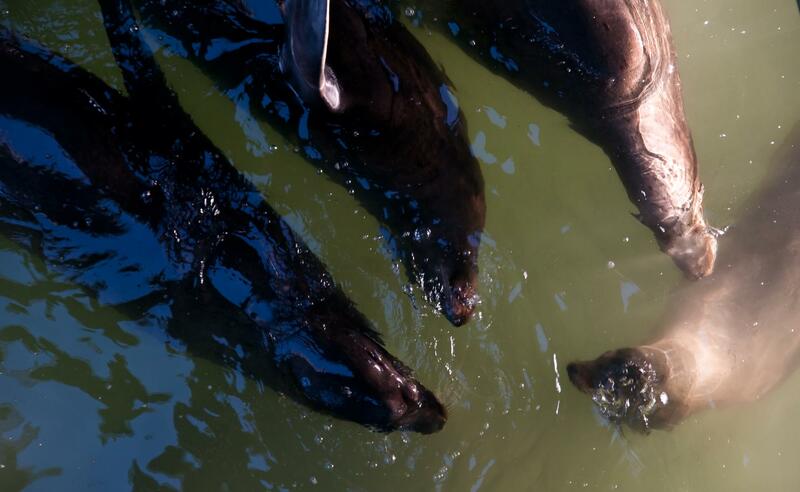 Sea Lions swam in and out of sunlight and shade beneath the wharf in Santa Cruz. 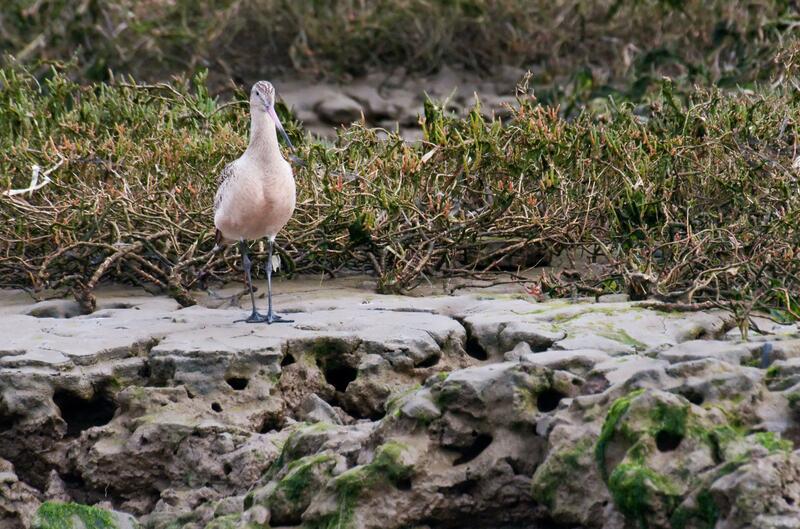 Having escaped from a collection somewhere this Flamingo showed up in Elkhorn Slough in January. It was tagged but no-one has claimed it yet. 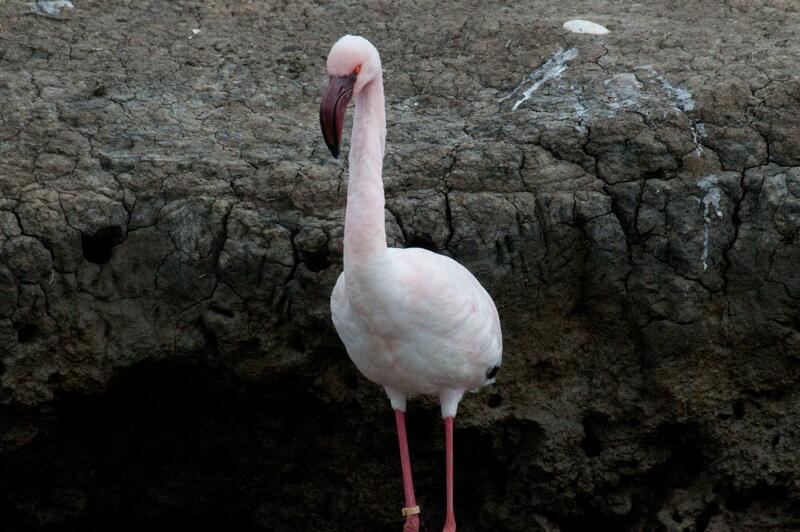 I had previously seen this type of Flamingo in zoos but this was the first time "in the wild". 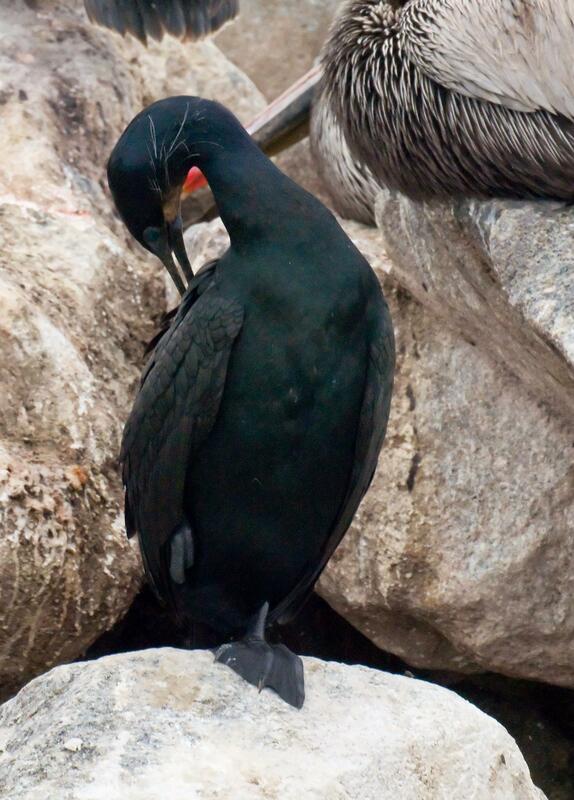 This photo of a Brandt's Cormorant preening shows the decorative white plumes they acquire during the breeding season. 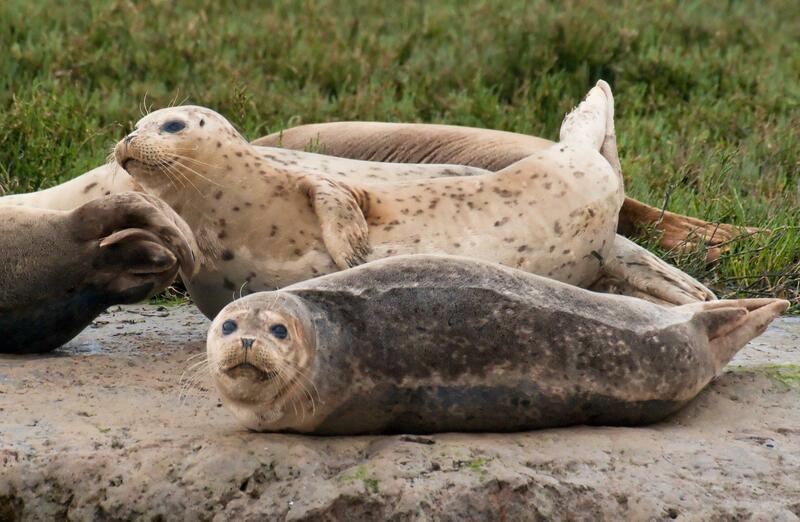 Two Harbor Seal were of quite different fur colors but all the whiskers were blonde. 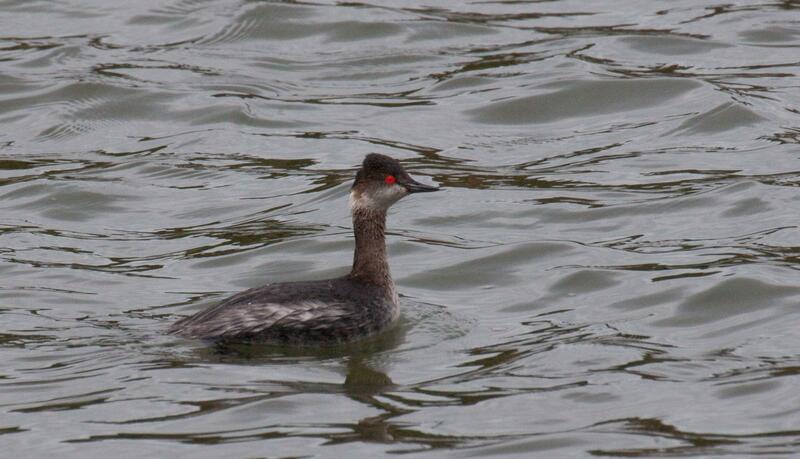 The Eared Grebe is a very small bird compared to the Western and Clark's Grebes. Only 13 inches long compared to the other bird's 25 inches. I hope to photograph one in breeding plumage someday because that look is quite different from their winter look seen here. 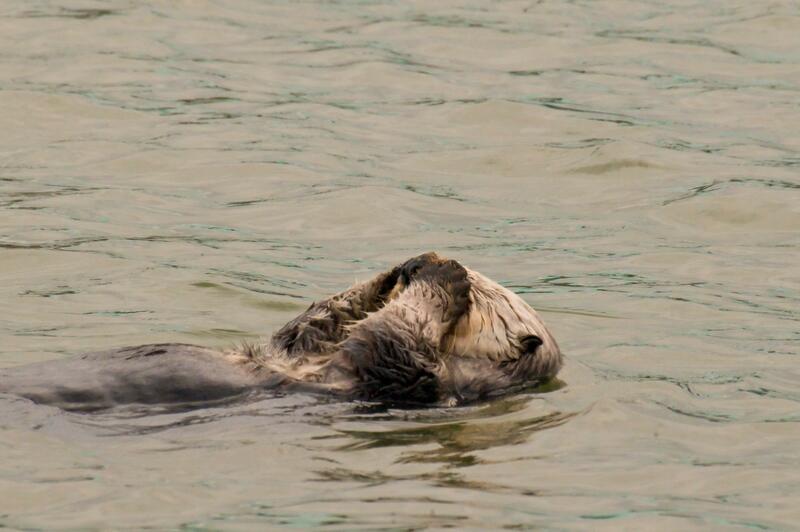 Sea Otters appeared to spend a great deal of their time grooming themselves. They use their bodies as tables, so have to keep food scraps washed off. While they clean, they also push and sometimes blow air bubbles into their fur. 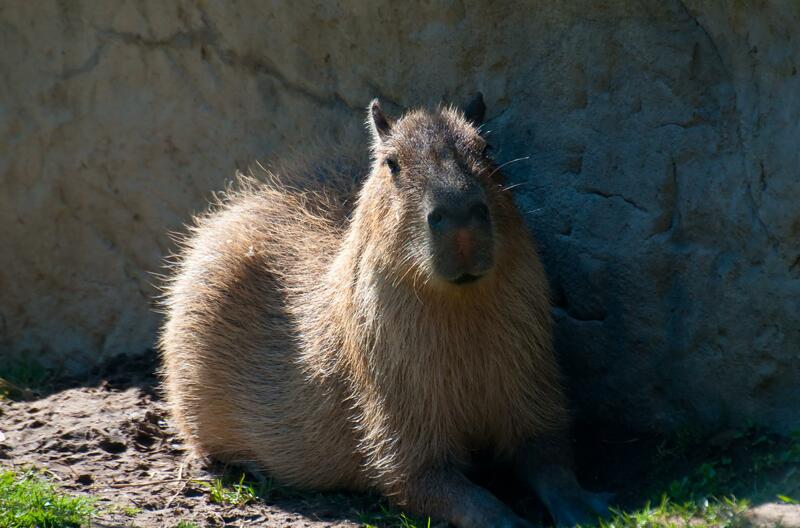 The extra air trapped in their fur contributes to their buoyancy and increases insulation. 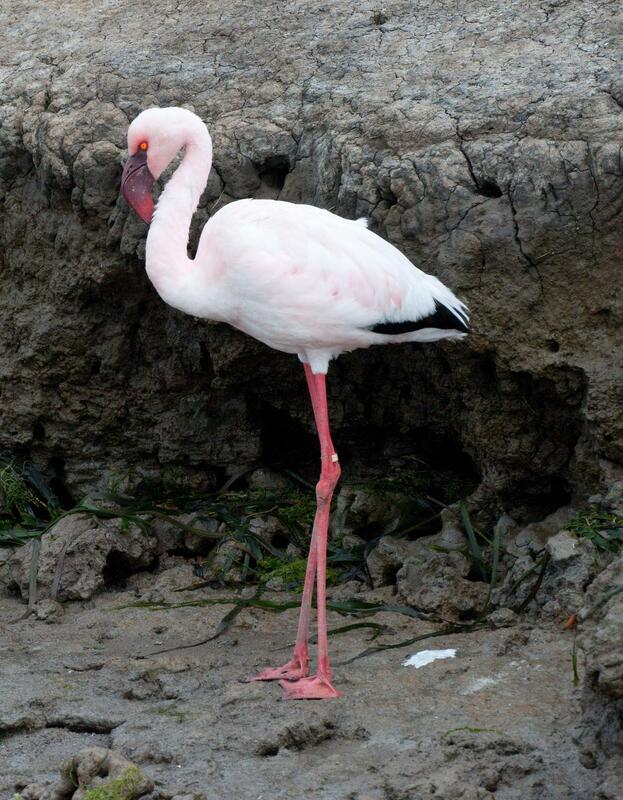 Here is the escaped flamingo of Elkhorn Slough. 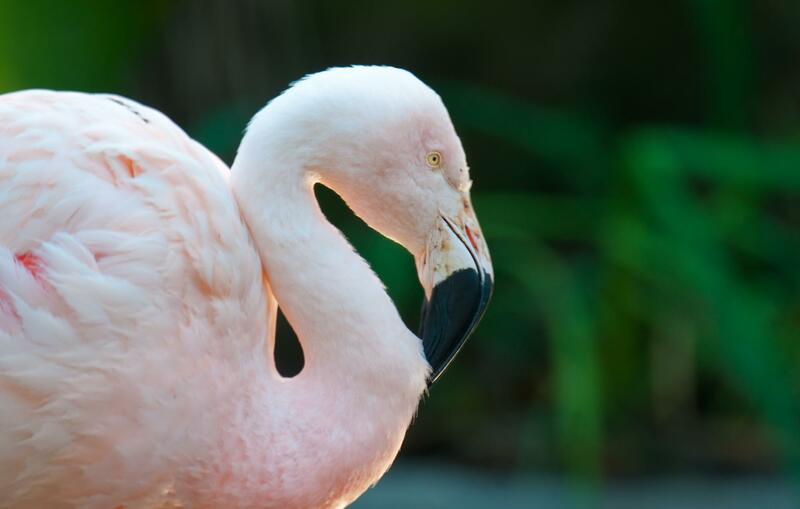 I realize it's the look of this species of flamingo, but doesn't this guy appear as if he's totally fed up with his job and can't take it anymore? To our left as we exited the harbor and entered the slough, we saw an old pier covered with sea lions. We slowly motored past them. It was quite satisfying to be at their level and so close to them. I feel like I ended up with a family portrait instead of a wildlife photo. 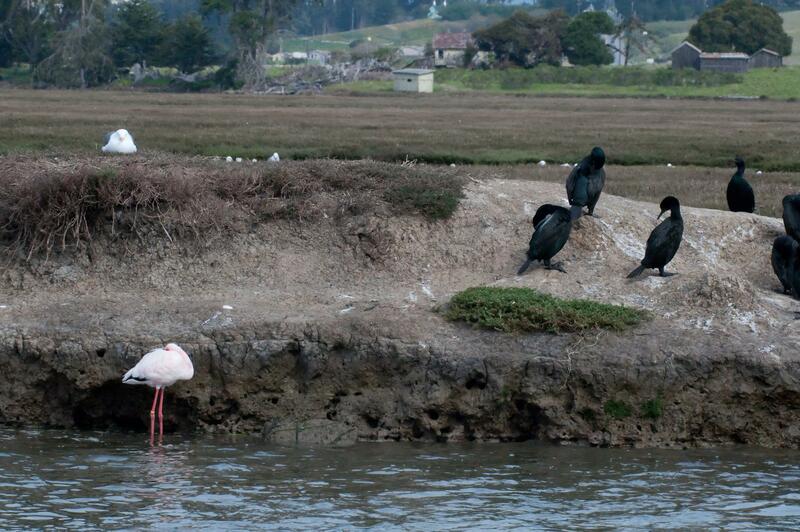 Here is the lesser flamingo which hung out near the cormorants in the Elkhorn Slough. I hope the flamingo is still there and thriving. 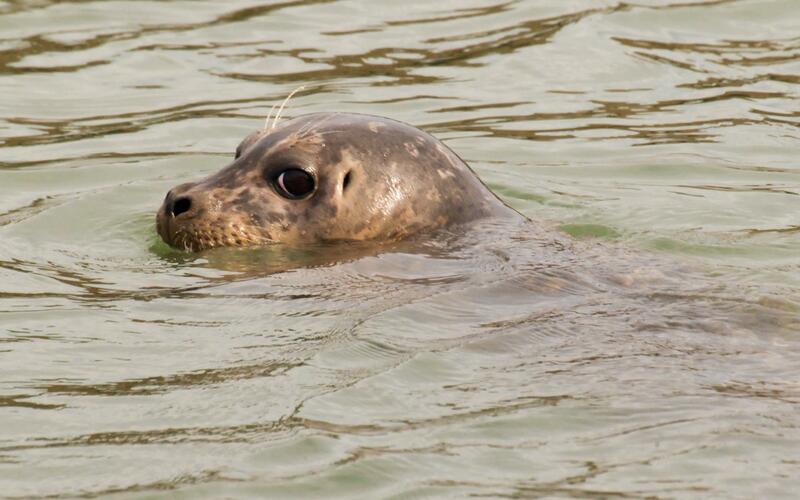 The Harbor Seal was very curious about us as we motored past, but not curious enough to actually move. We saw many of these Marbled Godwits that day on the slough. This one is just about to take flight. 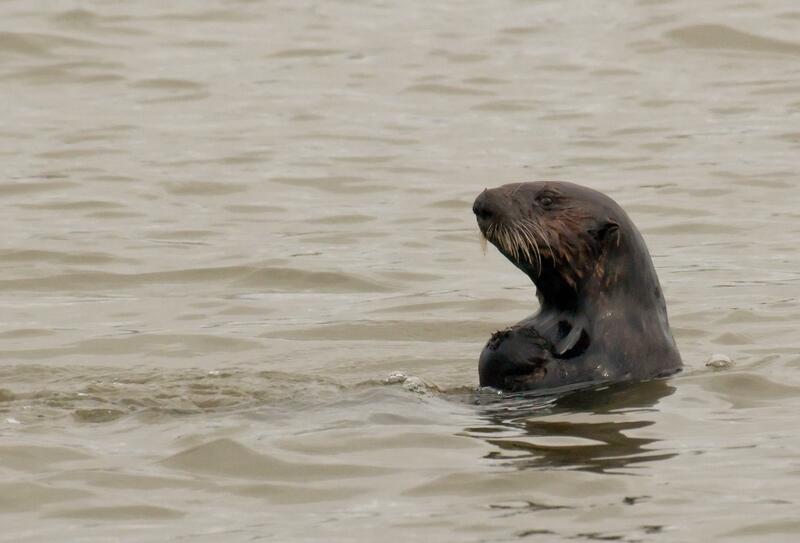 Here is another otter grooming or maybe he is thinking "oh, not another boatload of paparazzi!" 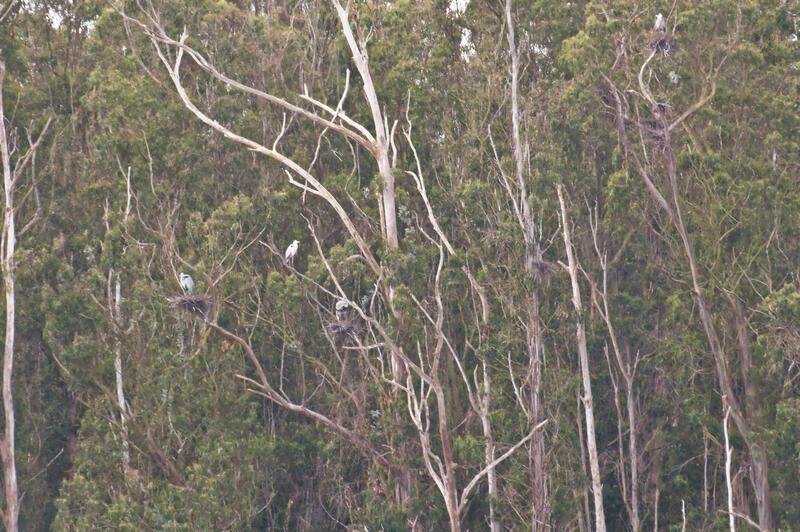 Across the slough and in the tops of a grove of distant trees was a colony of nesting Great Blue Herons. Four adult herons and many more nests were visible. 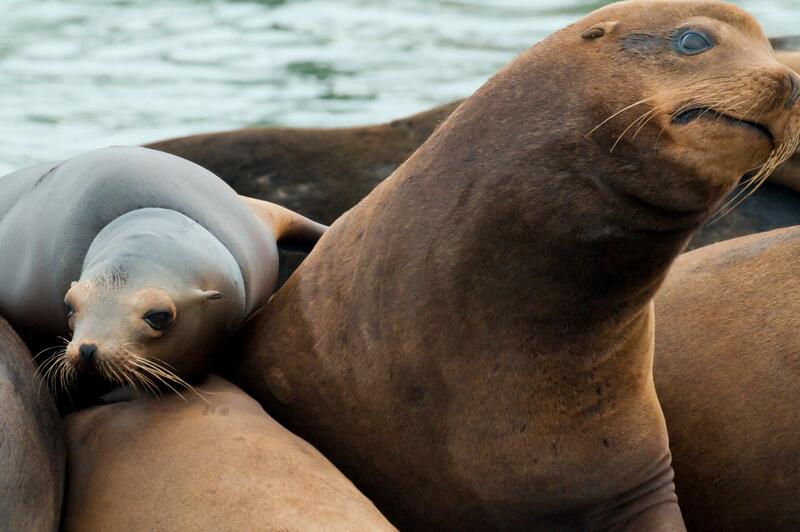 A very large male sea lion with a much smaller female. 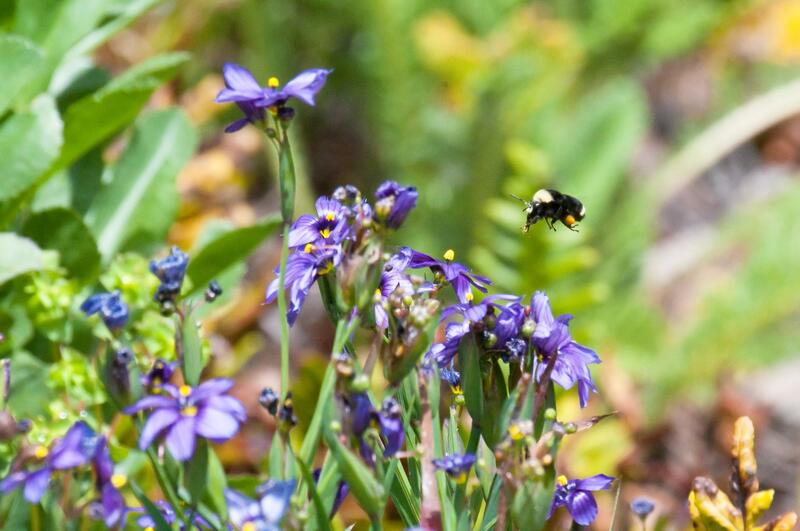 I have always wanted to photograph a bumblebee with flowers and this was my lucky day. My camera and lens together weighed about five pounds and I had been out for a couple of hours before I came across this bee. I followed him for a while and then finally grabbed the opportunity to get this photo. Nature composed this shot perfectly, I just cropped a little off the right side. The amazing thing to me is that it is in focus! 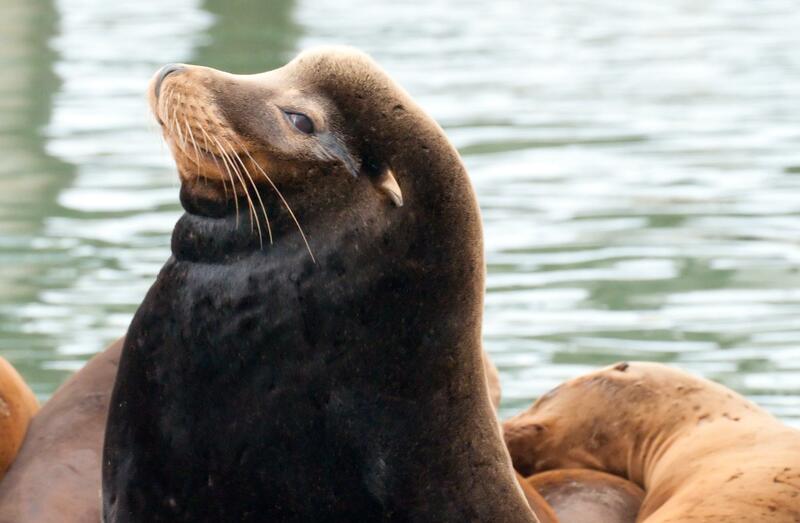 Close up of a male sea lion. 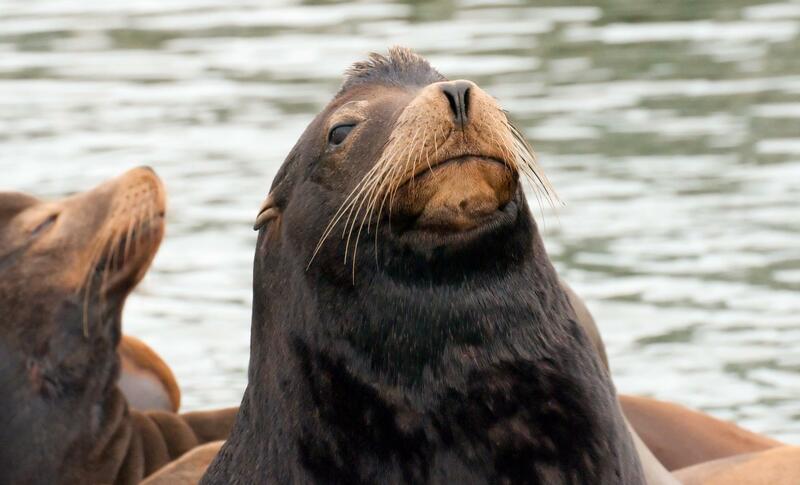 According to Wiki, "Zalophus californianus" means "Californian big-head" because a male grows a crest of bone on top of his head that causes a bulging forehead. 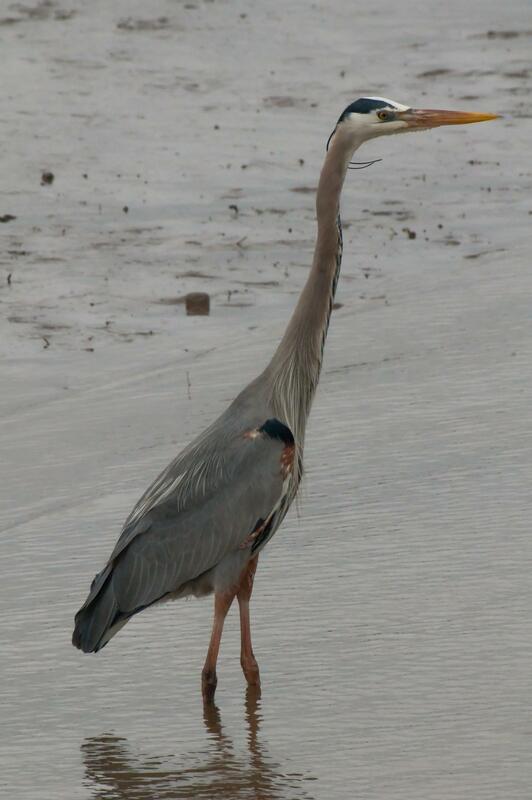 After the boat trip on Elkhorn Slough, we stopped by nearby Moss Landing State Beach and saw this marvelous Great Blue Heron. It may have been a member of the breeding colony we saw from the earlier boat trip. 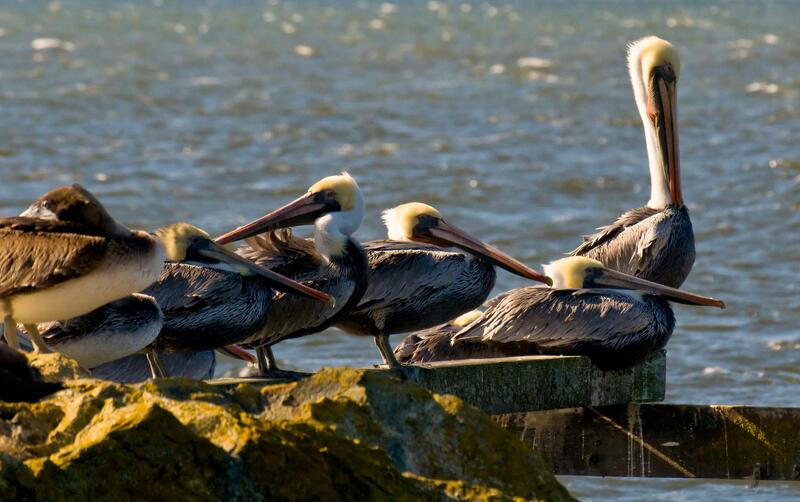 These two pelicans were one pair of dozens loitering around the marina, all waiting for a fishy opportunity. The one on the left was an immature bird which had not grown into its adult plumage. 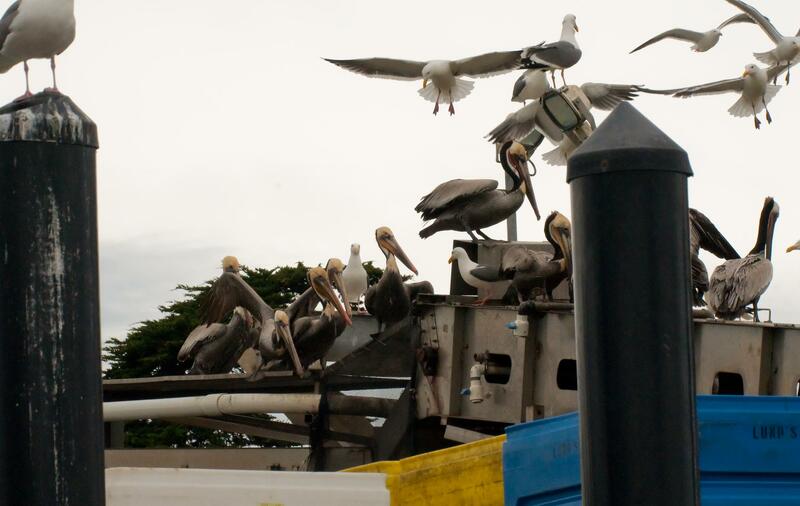 A large group of pelicans were perched on the fish processing equipment. 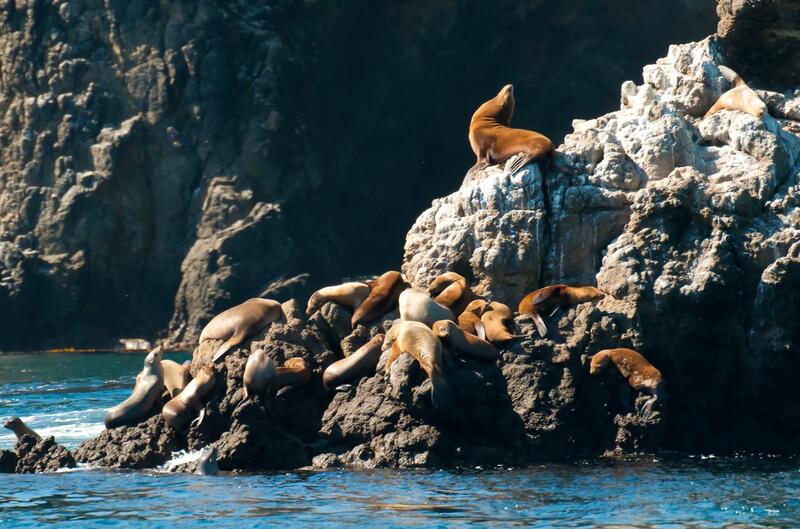 Portrait of a large male sea lion sleepily surveying his domain. 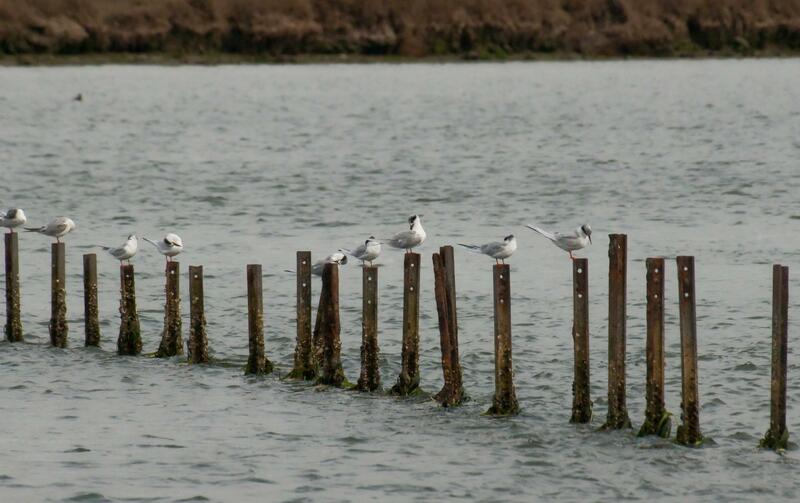 A row of Forster Terns perched on the partial remains of a sunken ship. 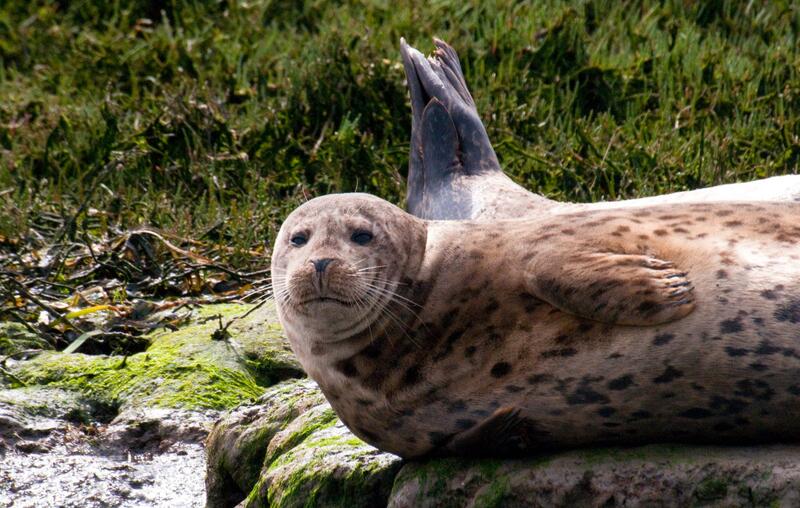 I love the pattern of this seal's fur, but I would never entertain the idea of taking it away from her to use for myself. 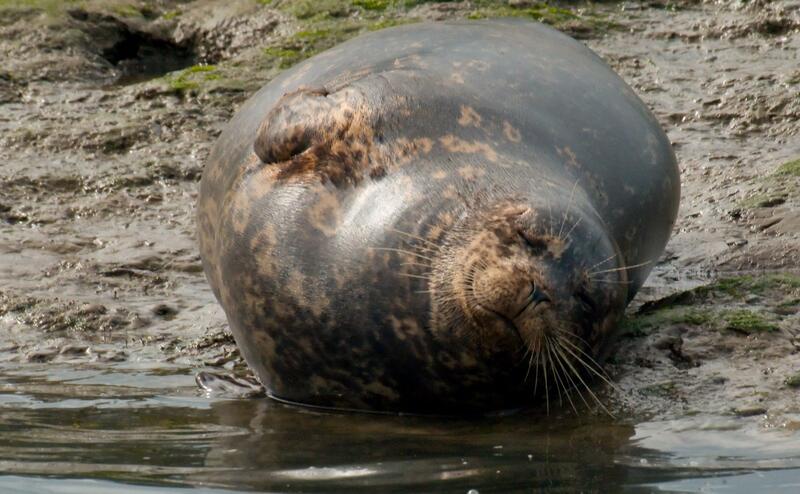 A very pregnant Harbor Seal looking quite pleased with herself. 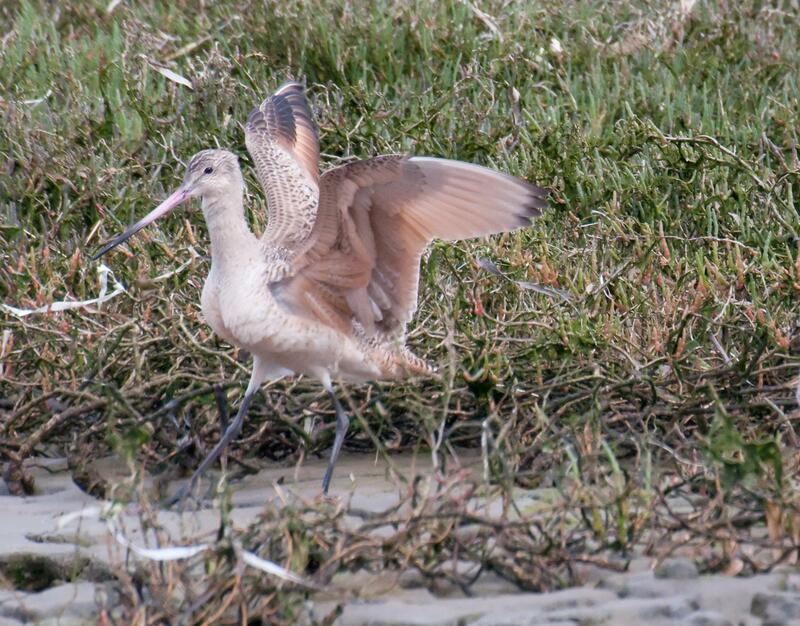 A Marbled Godwit stood on the shore of the slough and displayed its classy black legs. 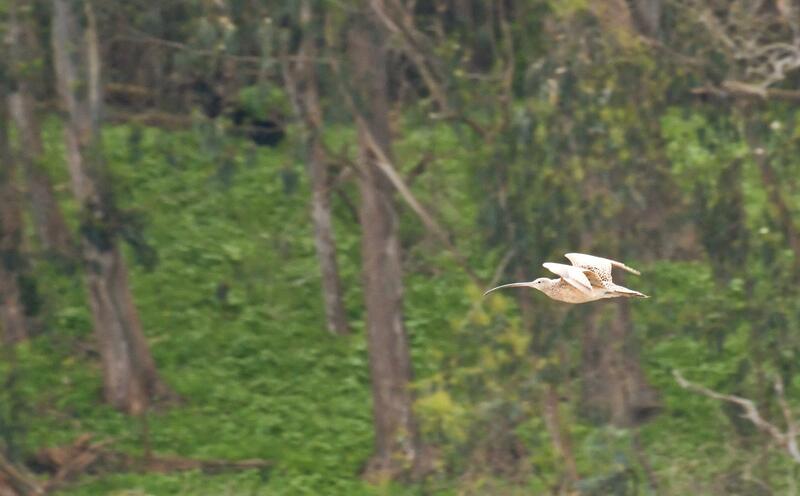 This photo of a Whimbrel flying illustrates the unique shape of its bill. 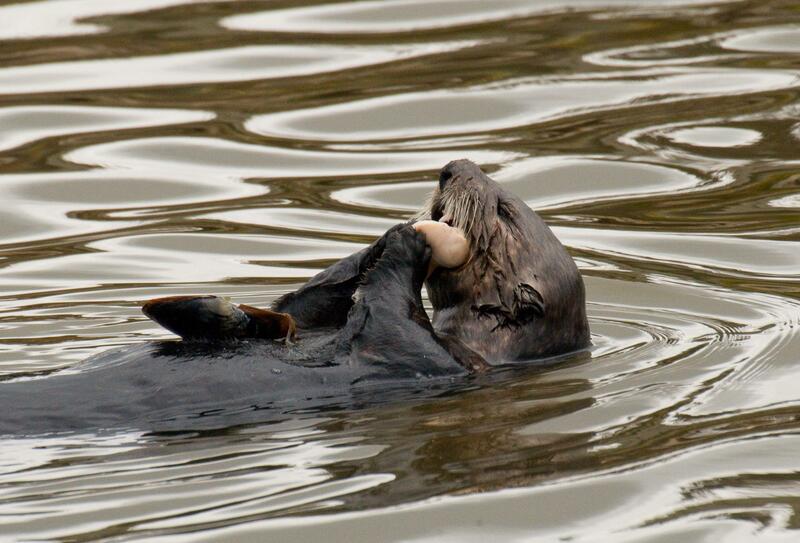 The otter balanced his "plate" on his stomach while enjoying that last little morsel. 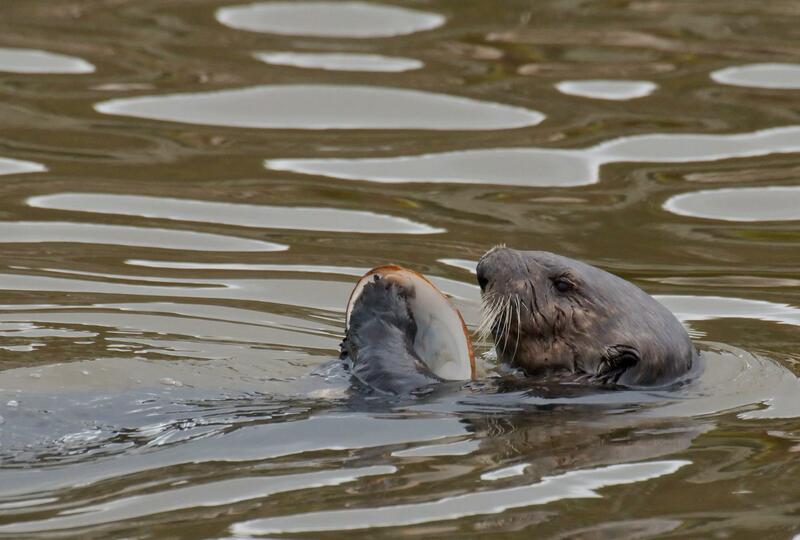 A shell was almost the size of the otter's head, but was no match for its appetite. 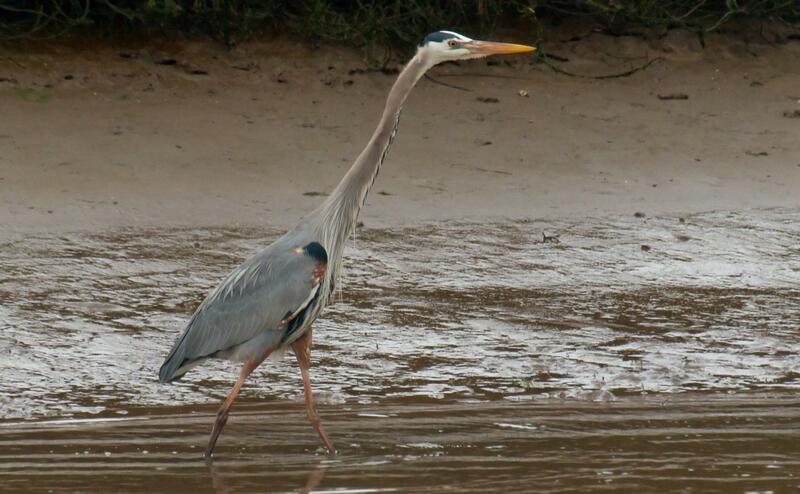 A Great Blue Heron waded in shallow water in search of food. I know they are wild animals with big teeth and claws but jeez, don't they look cuddly?! 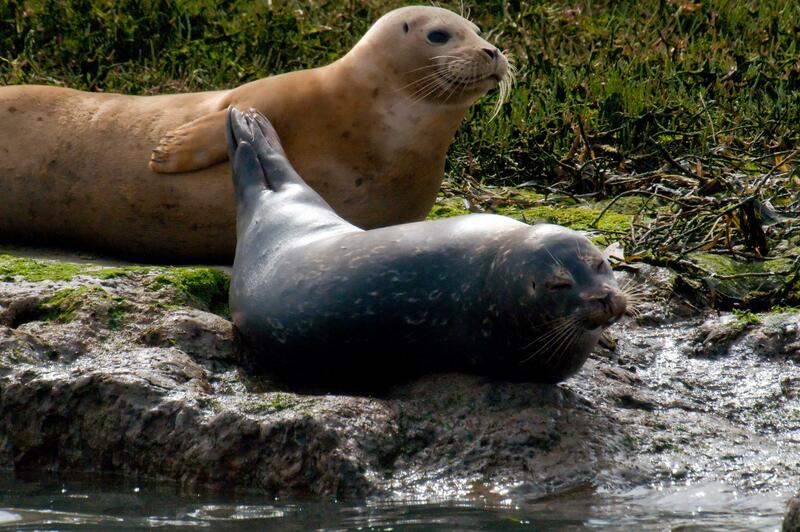 I was able to get nice close-ups of the harbor seals because I used a telephoto lens. If the boat had come this close they would have been disturbed and swum away. 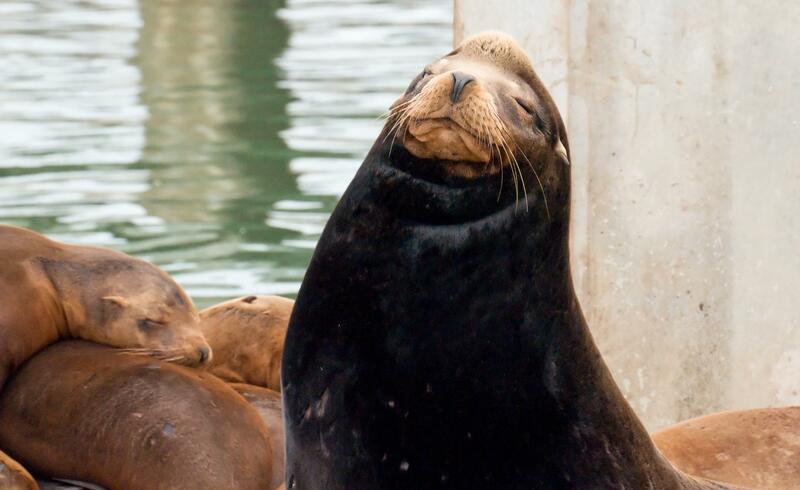 More of the endless variation of facial expressions you can always find in sea lions. King of the mountain and he knows it. 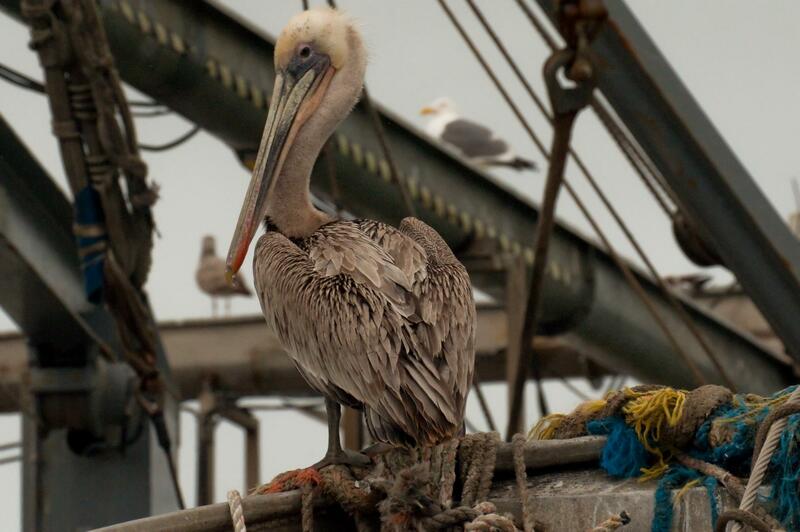 Pelican posed aboard an old fishing boat. 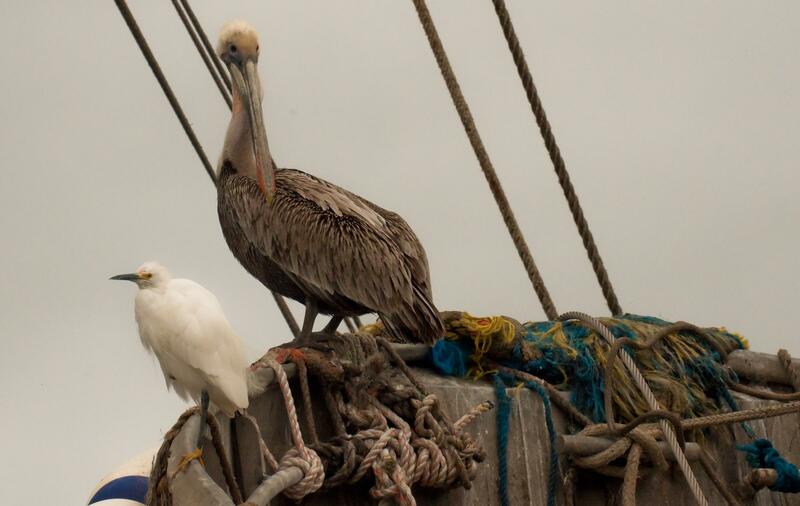 A Pelican and Snowy Egret perched on the edge of an old vessel. The frayed ropes added a colorful touch. It was satisfying to get a close-up of this wonderful diving bird. 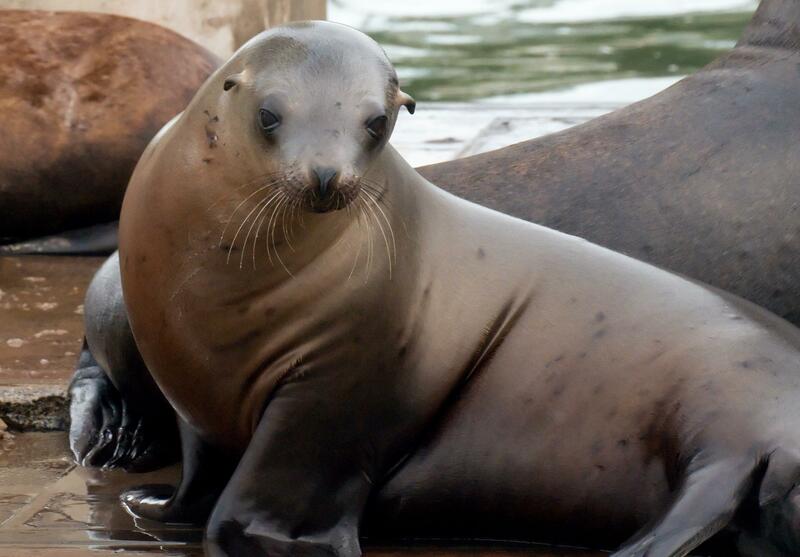 A female sea lion tried to appear very demure. 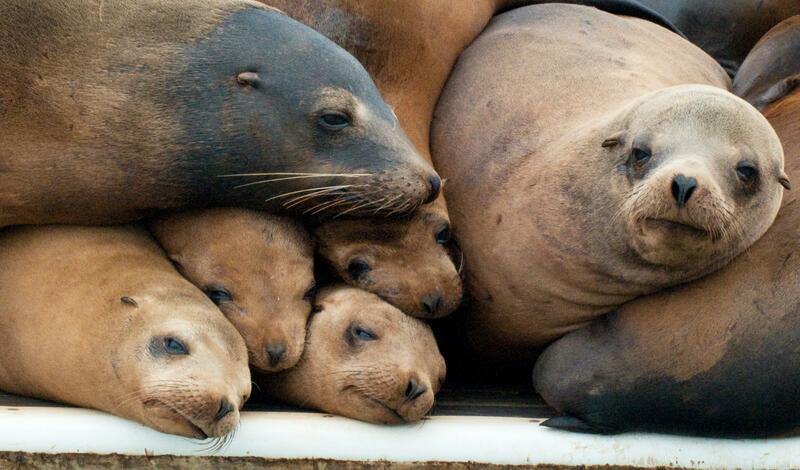 A very young sea lion was sleepily curious about his observers. 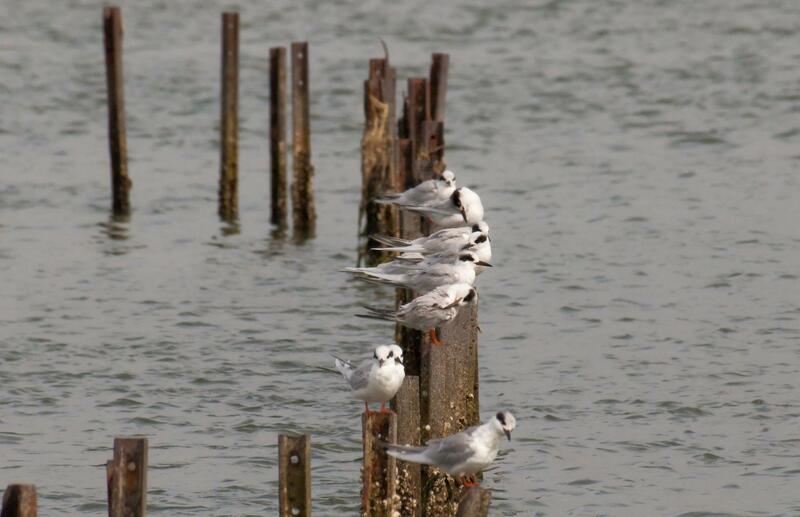 Skeletal ship ribs now supported a row of windswept terns. 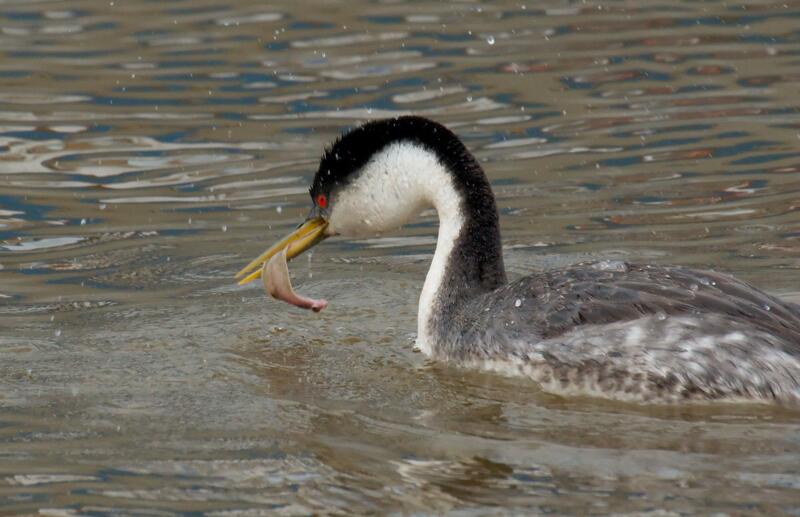 A Western Grebe after its dive for fish. 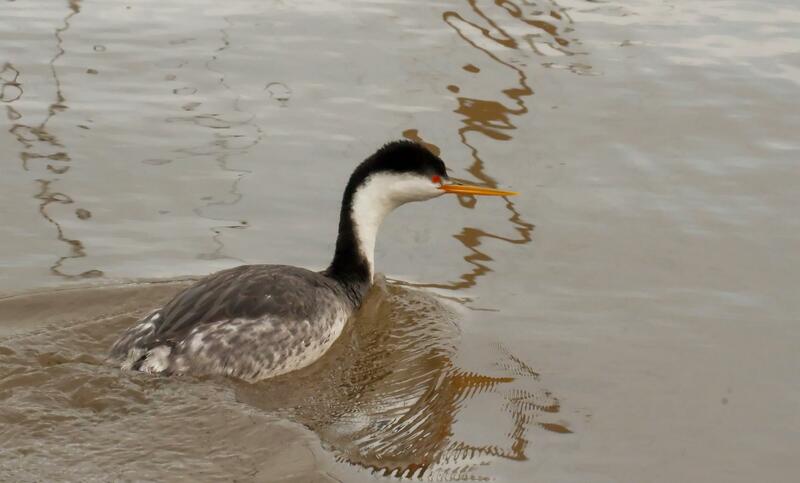 Here is a Western Grebe ready to dive for fish. 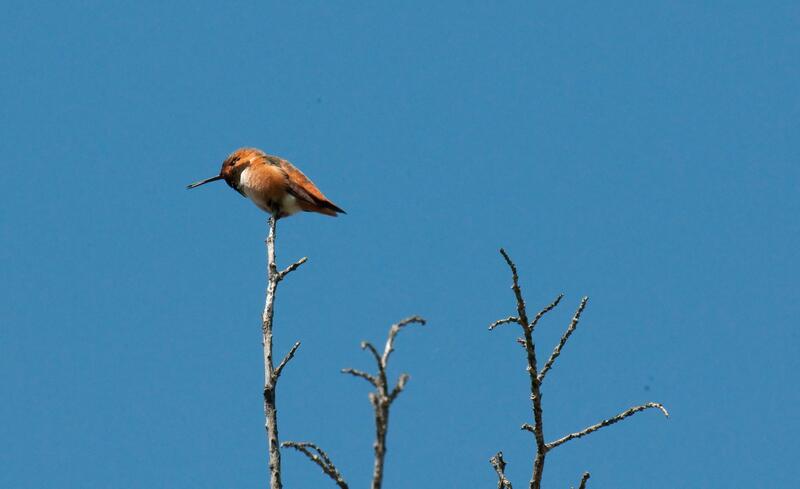 A tiny bronze hummingbird stopped to pose on the tip of a branch and I thanked him. The loons that day seemed to stay well away from our boat. I was only able to get close enough for this one photo. 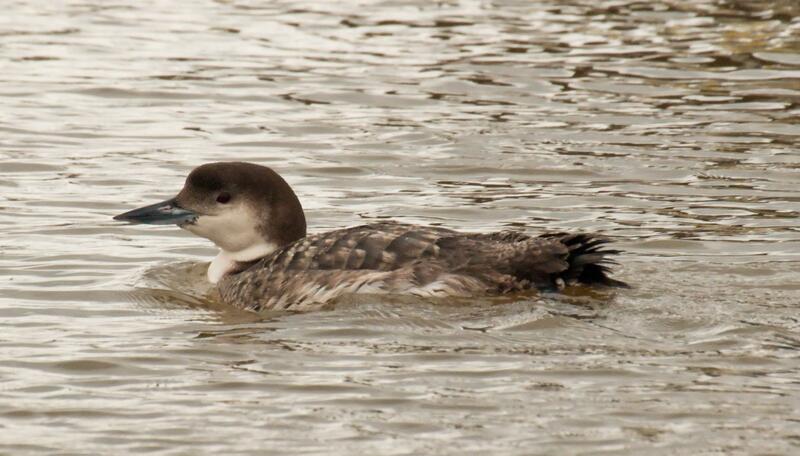 This is a Common Loon in winter plumage. 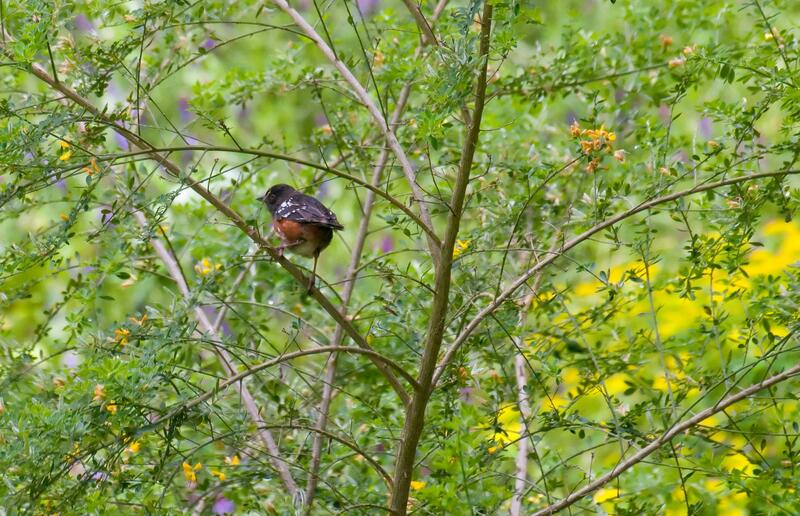 Towhees are the robin-sized birds that scoot away under shrubbery before you can get a close look at them. Unless you are a bird stalker (I mean photographer) with much patience. 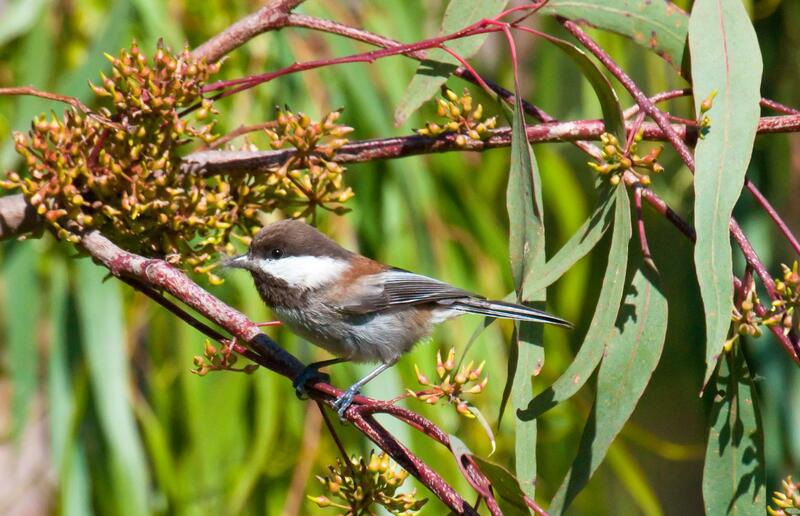 This photo shows a chickadee that had gathered some fuzzy material for its nest. Chickadees are quite active birds who don't usually pose as nicely as this one did for me. It actually held still for more than three seconds. 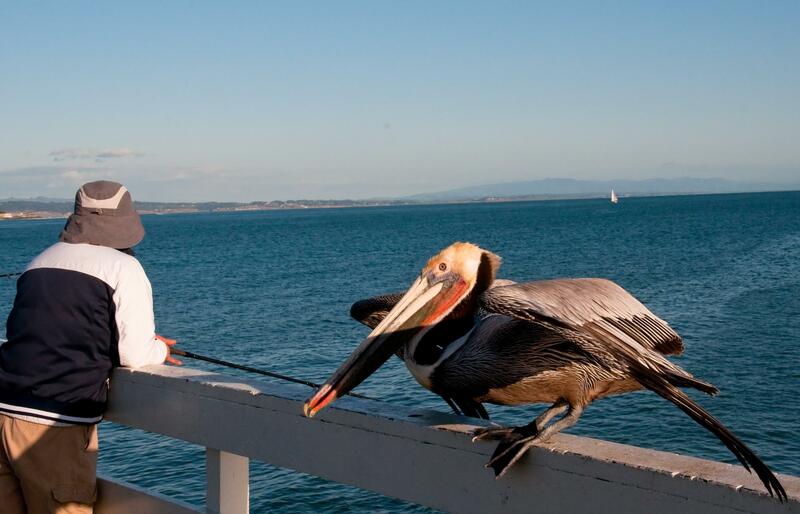 The fisherman hadn't noticed that a pelican had just landed next to him on the pier. Bewick is pronounced Buick, like the car. 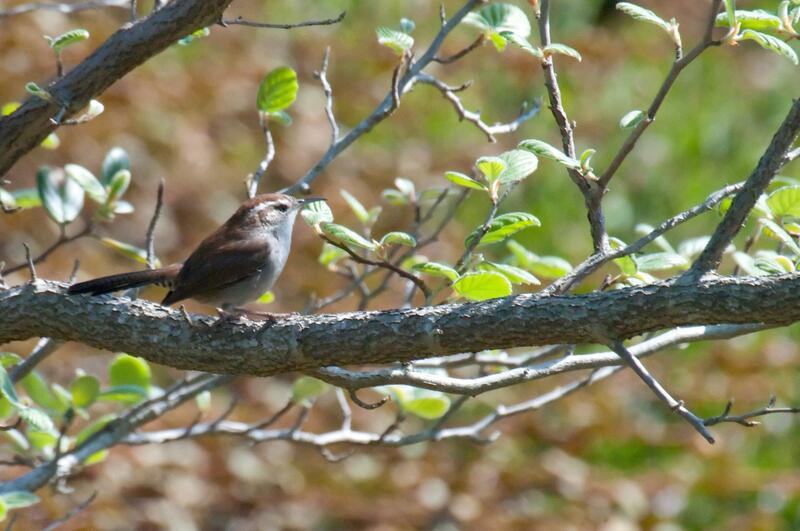 This wren is thriving in the nation's parklands and adds its voice to nature's concert. 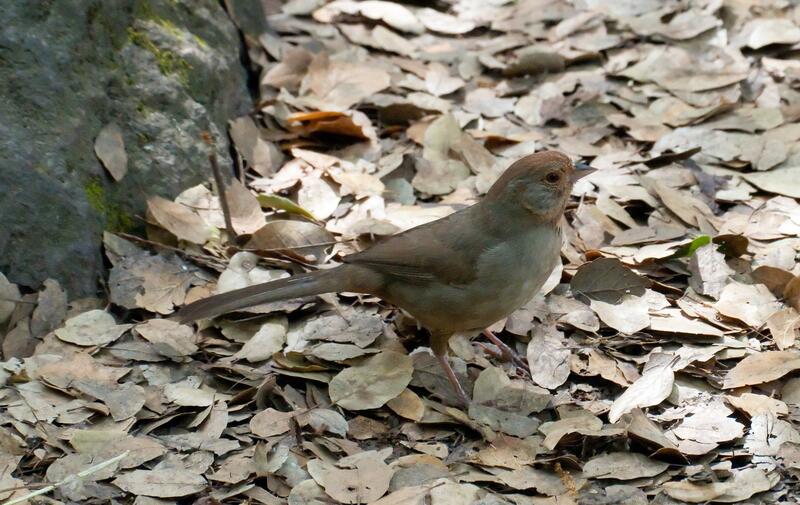 Towhees are not often seen in trees, because they love to forage in leaf litter under bushes and at the edges of paths. 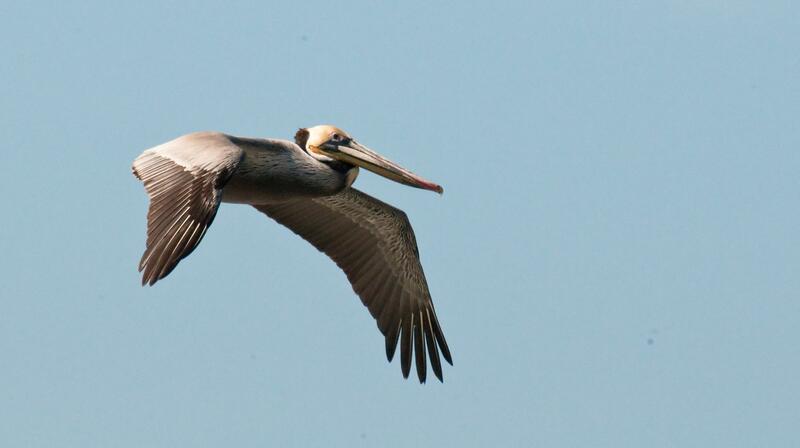 It surprises me that a big bird like a Pelican can fly so effortlessly. Natural Bridges Park was sunny and bright that day, which brought out the colors of the birds and water. In contrast, he following day was overcast with afternoon rain. 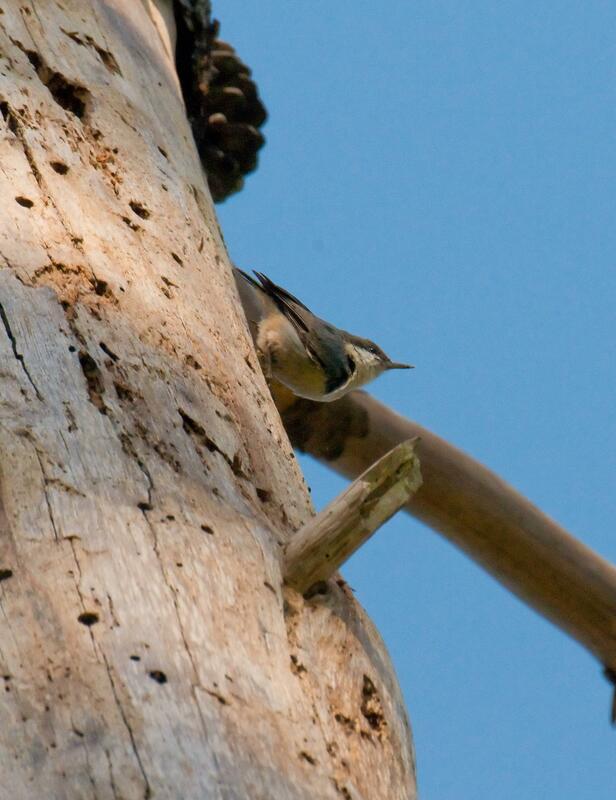 This tiny bird was poking around the holes in a dead tree. It was far away but I did manage to get a couple of shots. 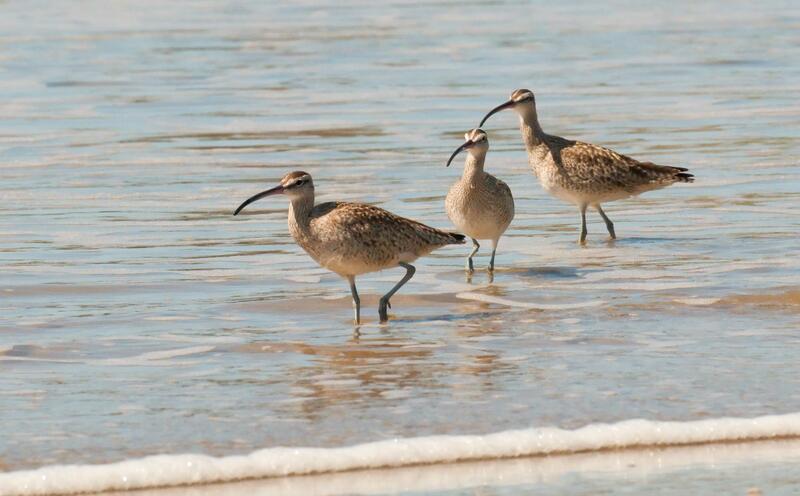 This photo of whimbrels shows their head markings quite well. This was the second killdeer nest I'd found. The first one was on gravel and this one on flowerbed mulch. 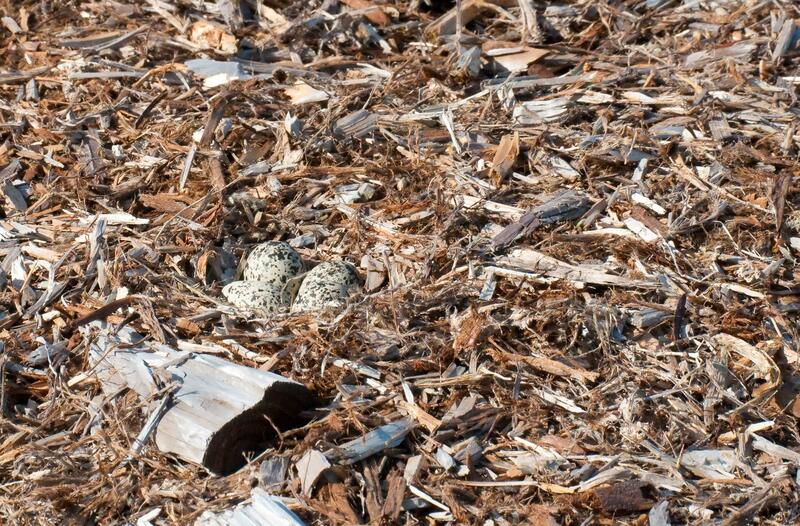 Both times the nests were easily overlooked and the eggs hard to spot. 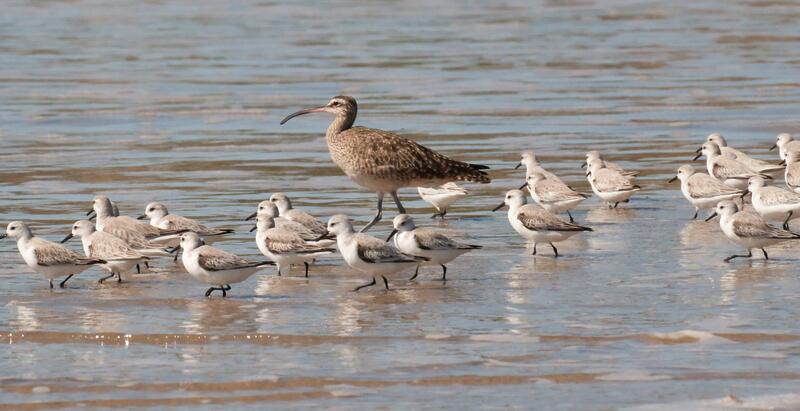 The sandpipers illustrate the adage that "birds of a feather flock together" and the whimbrel shows that, yes, we all can just get along. This killdeer tried to lure me away from her nest and eggs fluttering her wings as if injured. 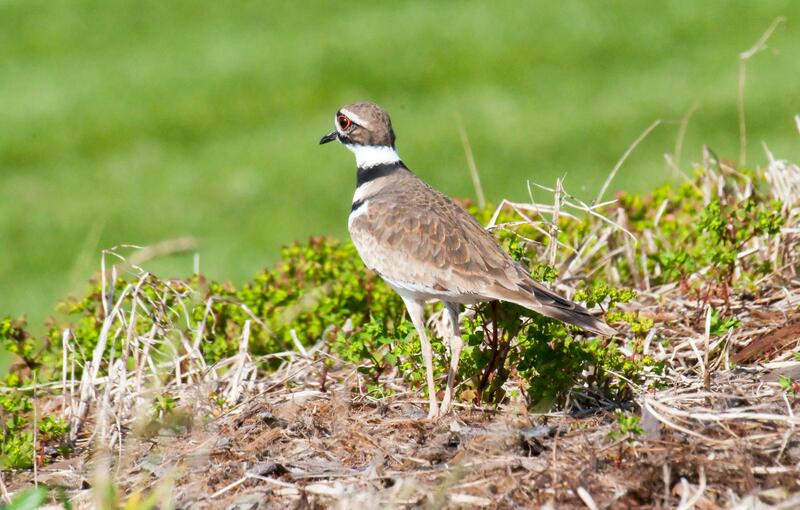 Ironically, the only reason I knew her nest was nearby was because of the mother killdeer's behavior. She faked being hurt and then looked back to see if I was buying it. 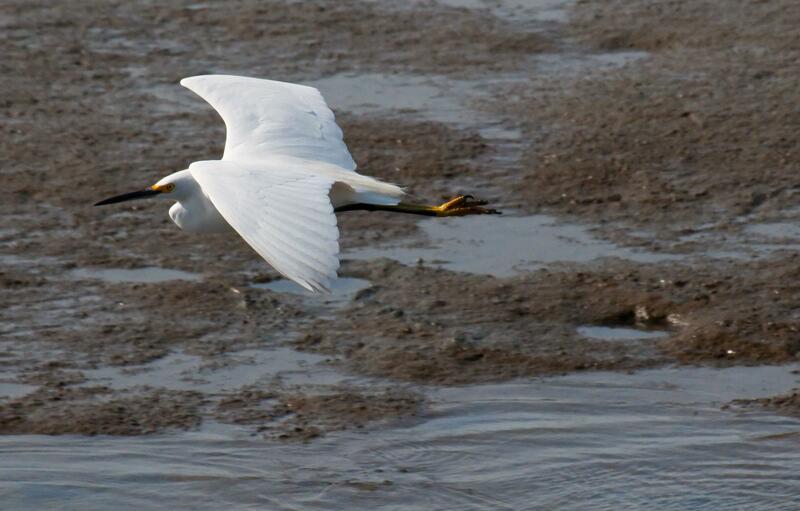 A snowy egret in flight is the poetry of nature. 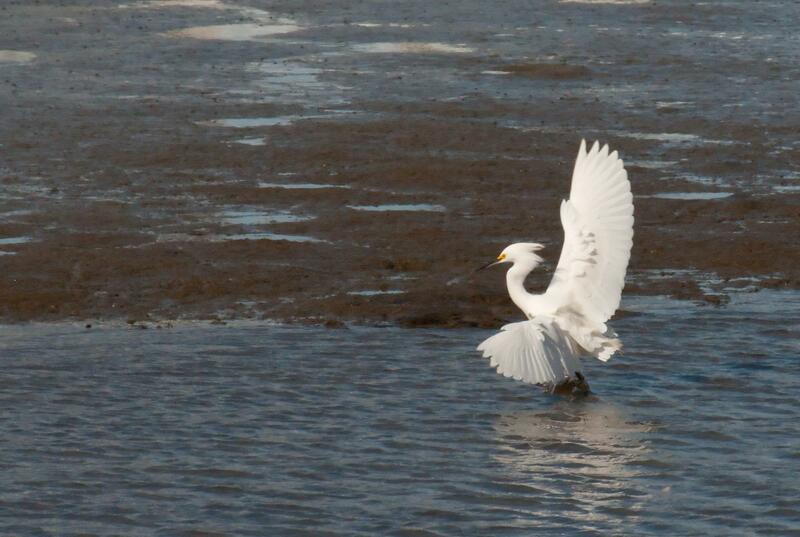 A snowy egret mid landing appeared to dance. 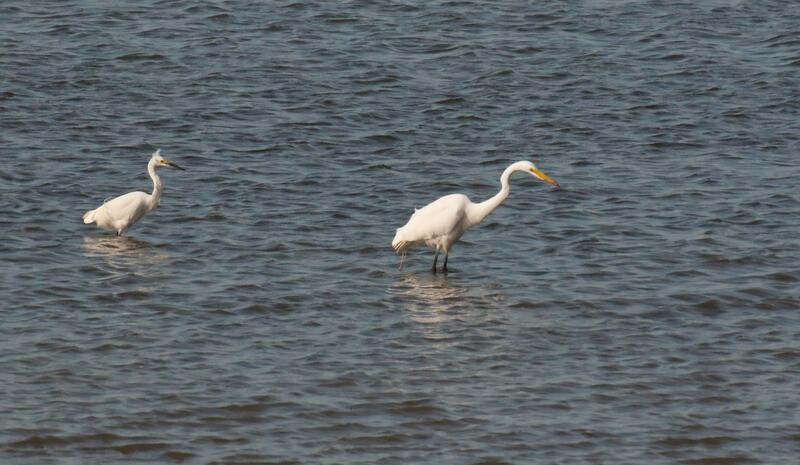 The larger Great Egret was stalked by the smaller Snowy Egret. These conjoined damselflies are a mated pair and stay connected like this until the eggs are laid. 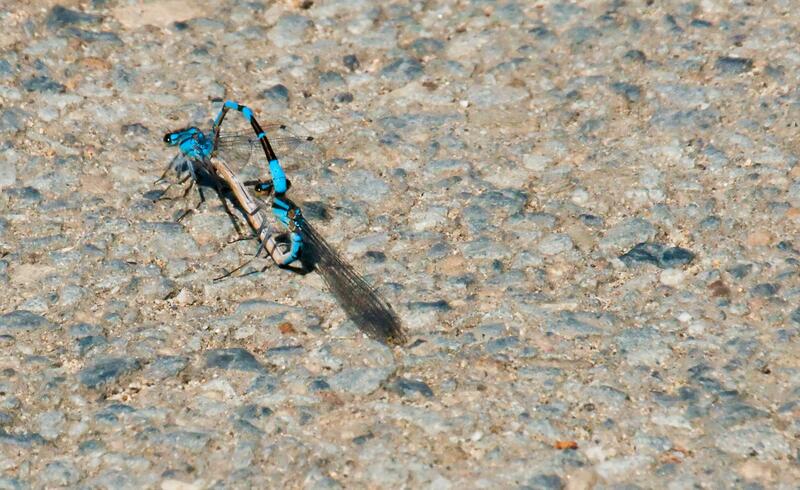 Both damselflies seen here are bright blue so this may be a "gay" pairing as documented in National Geographic. 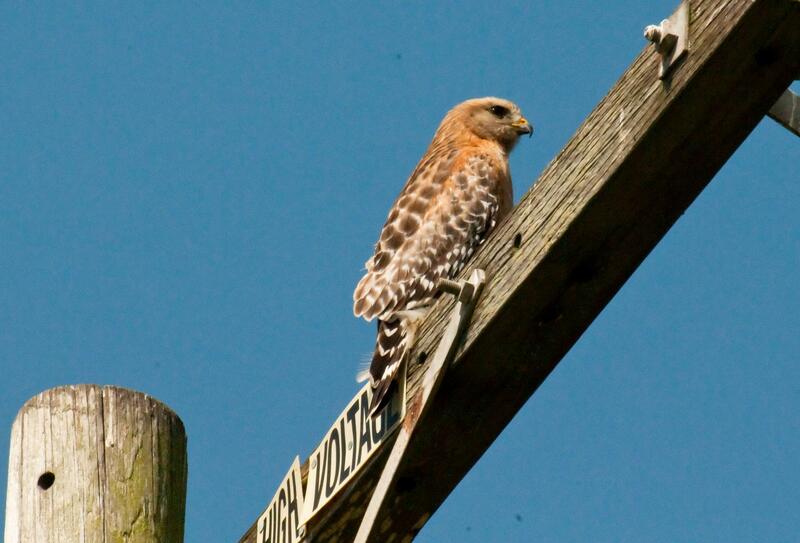 A Red-shouldered Hawk showed off his very red shoulders while atop a high voltage power pole. Phoebes are one of my favorite birds because they seem so positive about life. I know I embue them with that attitude, but it's what I see. 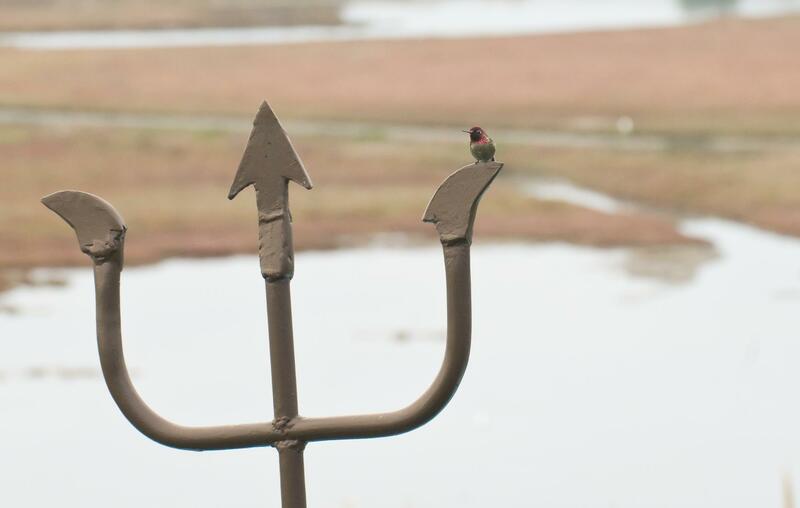 Shown here is a Phoebe perched on a gate. I just love it when a bird comes close enough and holds still enough to get a good shot like this! 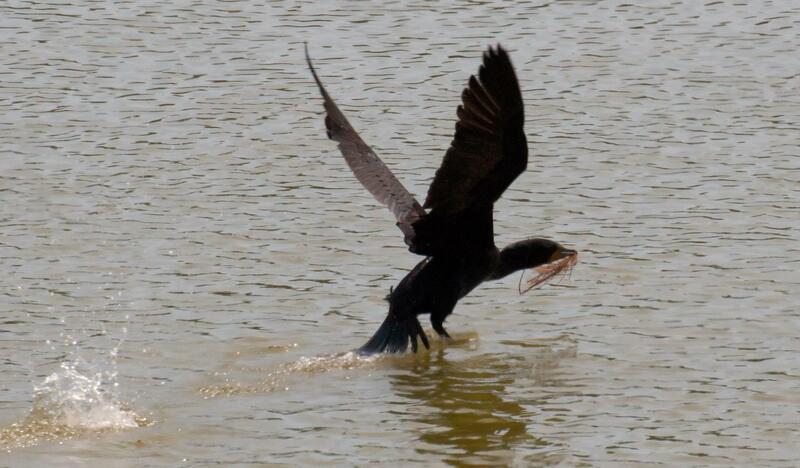 This cormorant scooped up a beakful of water plants to build its nest and then flew off. 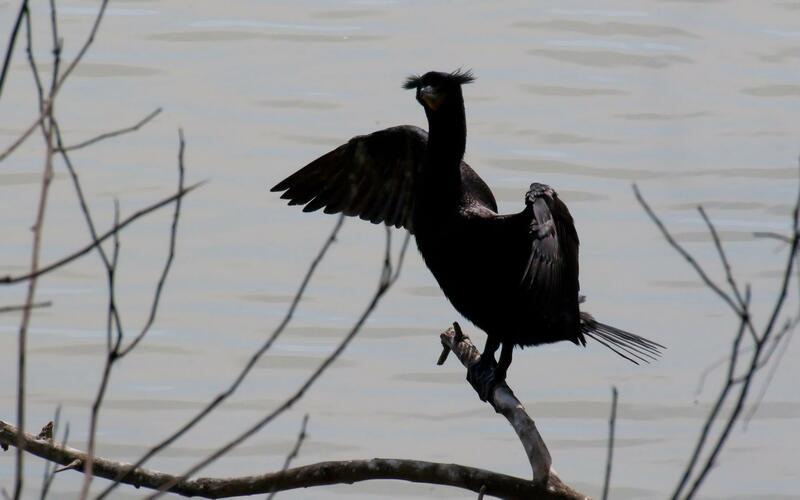 This silhouette clearly shows the double crests that gave this cormorant its name. 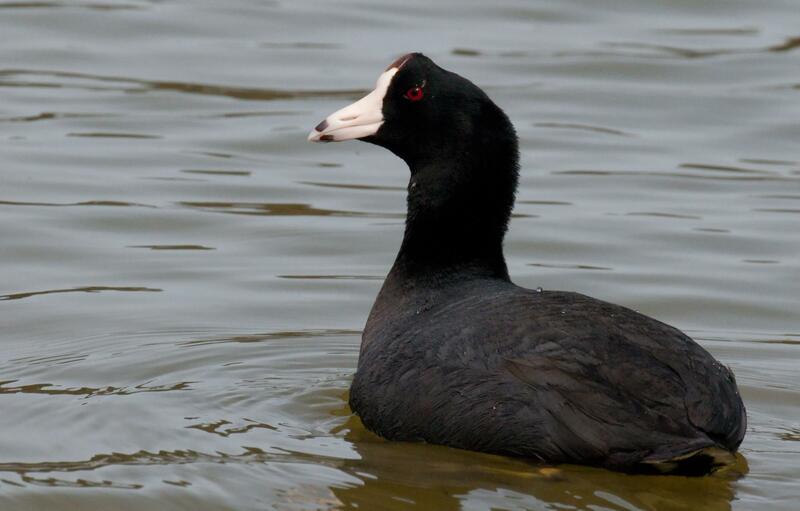 A close-up of the lovely coot. 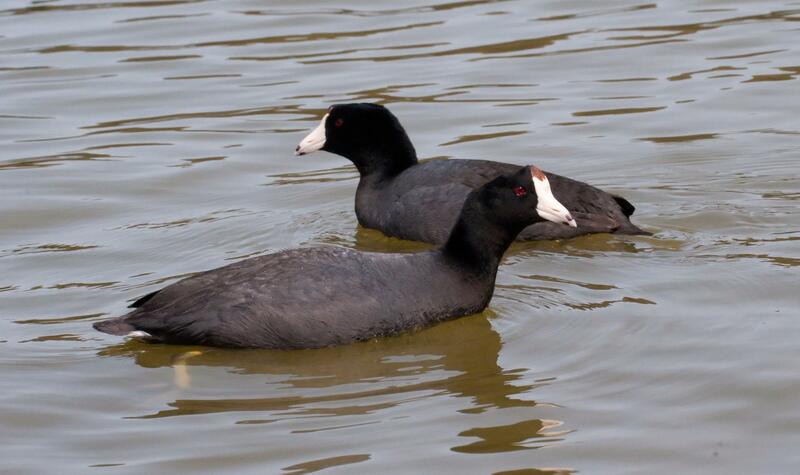 The coot is a common bird found just about everywhere there is fresh water. The coot is not a duck but a rail. 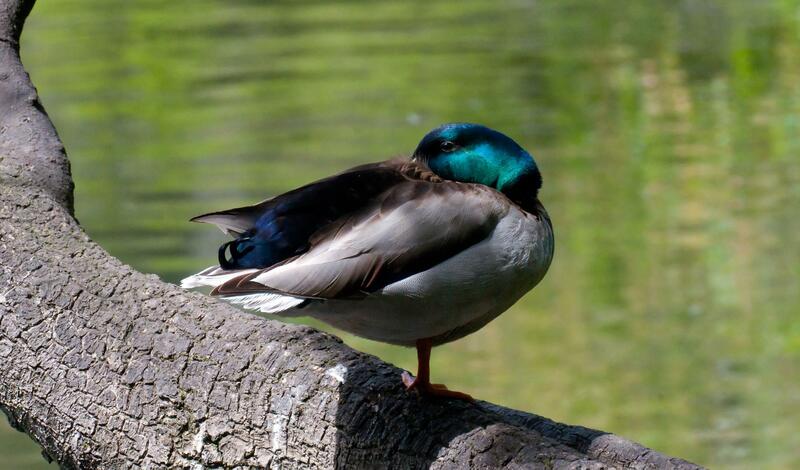 It doesn't have the typical flat bill of a duck and its feet are quite different, not webbed but lobed. 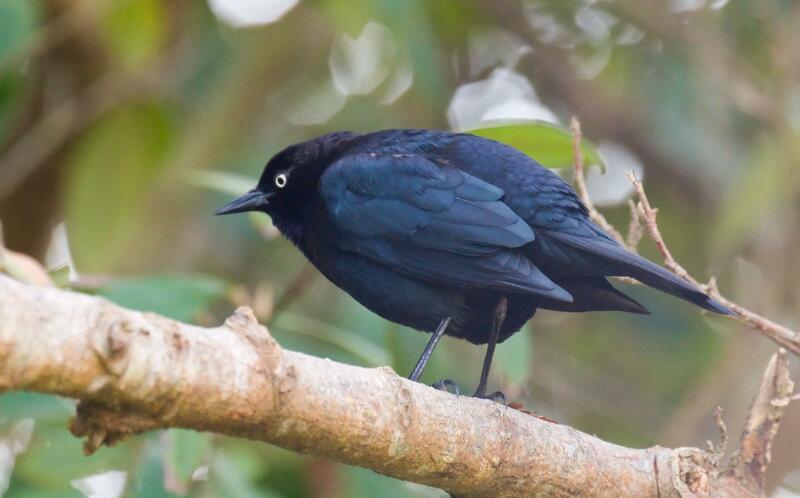 A male Brewer's blackbird was showing off its glorious purple sheen. A handsome male blackbird perched on a branch. 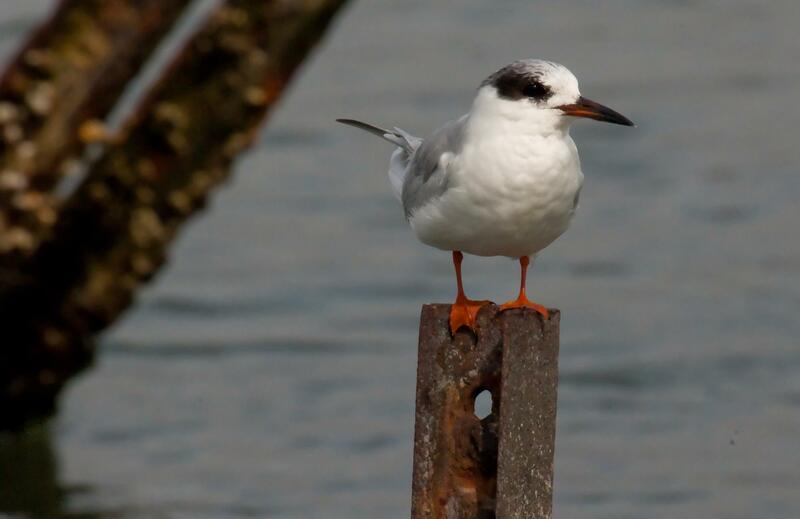 A very common bird but one I've rarely photographed. 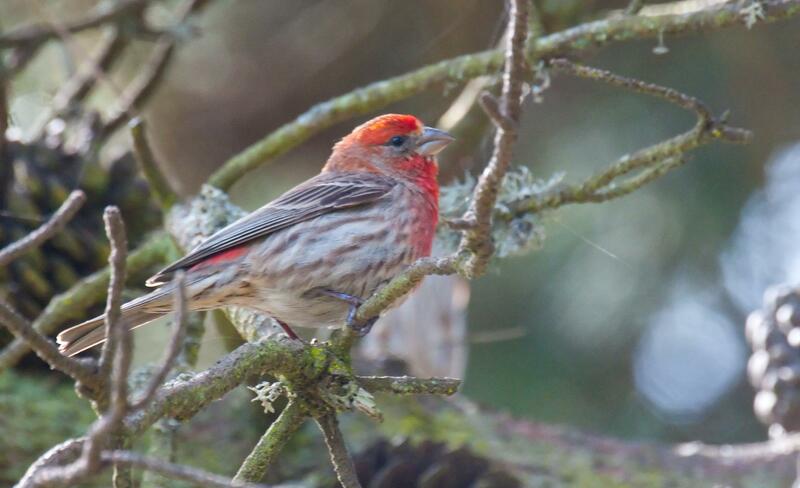 The red color of this house finch indicated he was male. The female, by contrast, is quite plain with no coloration. Pretty, noisy and never stays still for long. That's the chickadee. 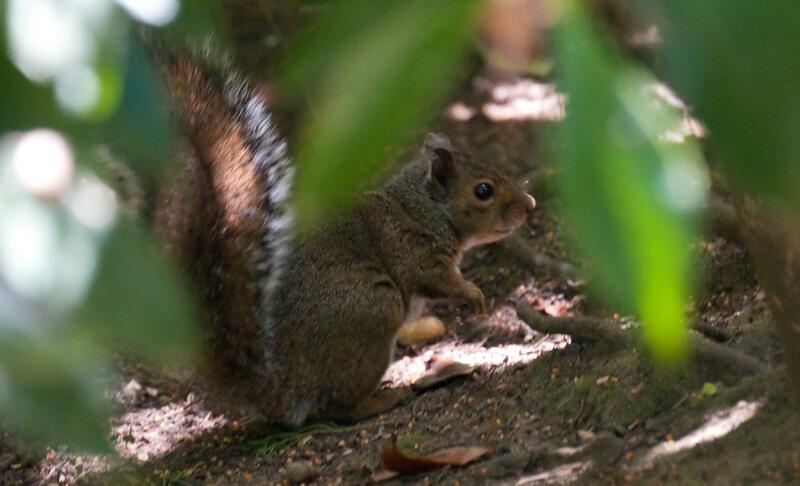 Gray Squirrels seem to be thriving in the Arboretum. We saw about a dozen that afternoon. 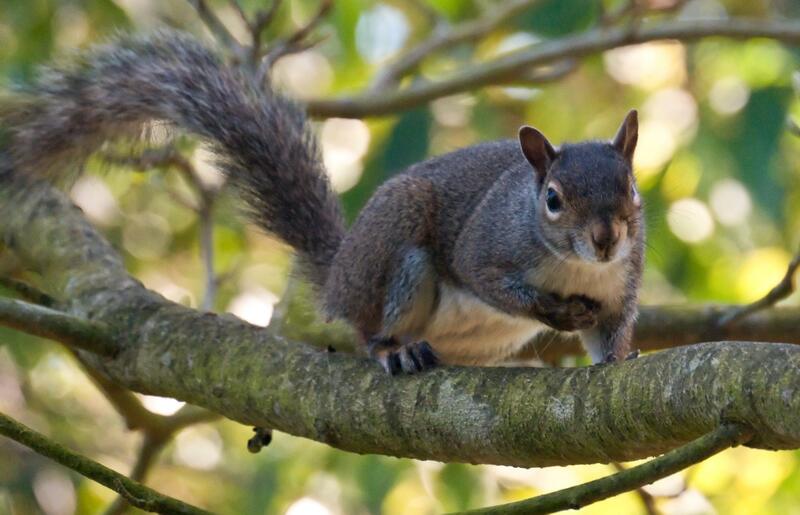 A Western Squirrel scavenging on the ground, glimpsed through the foliage. A nice sun-dappled look. 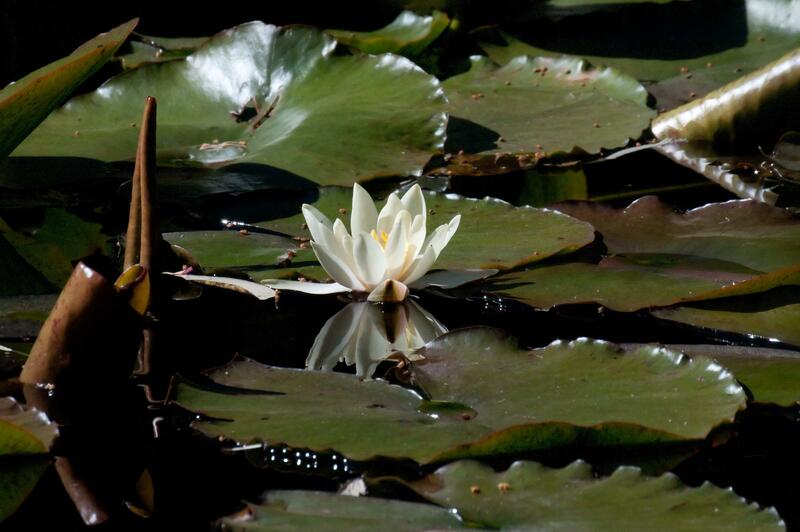 As we left that day we passed a nice pond with water lilies. A gorgeous flower but without the iconic frog. A tiny charmer with a beakful of lunch. This was neither a talon nor a mutated squid tentacle. 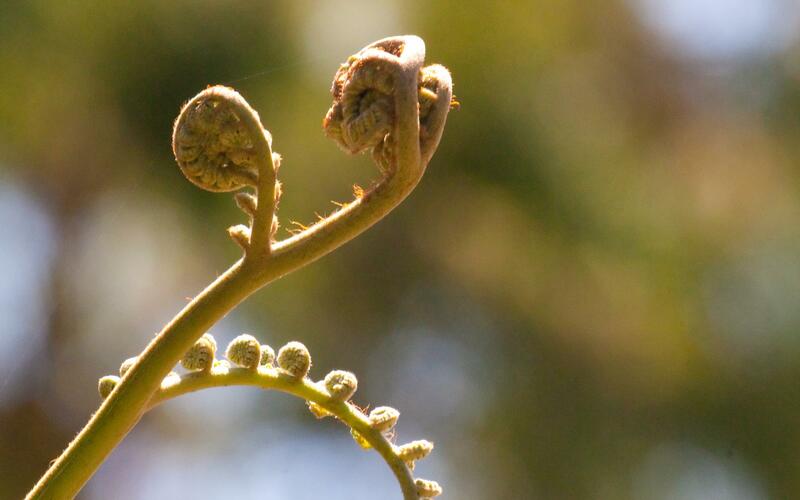 It was the just the frond of a fern about to unroll. The actual plant was at least seven feet tall. The arboretum gardeners really knew what they were doing. 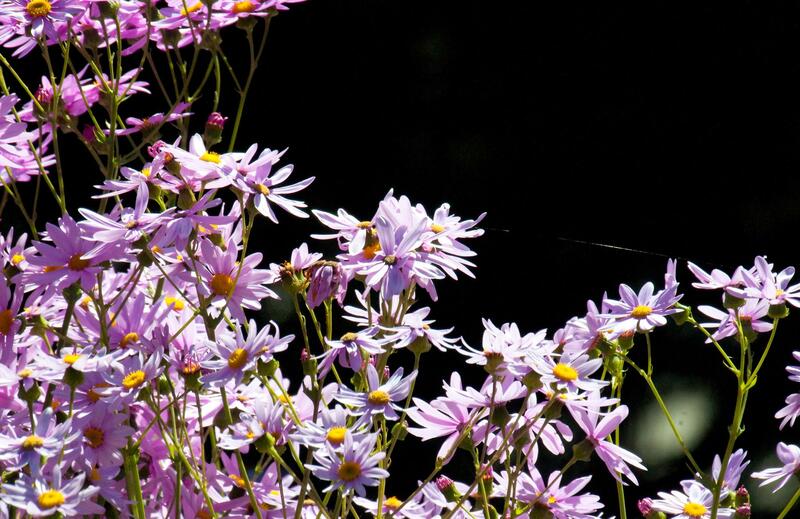 These Swan River Daisies were bloomed in wild profusion. 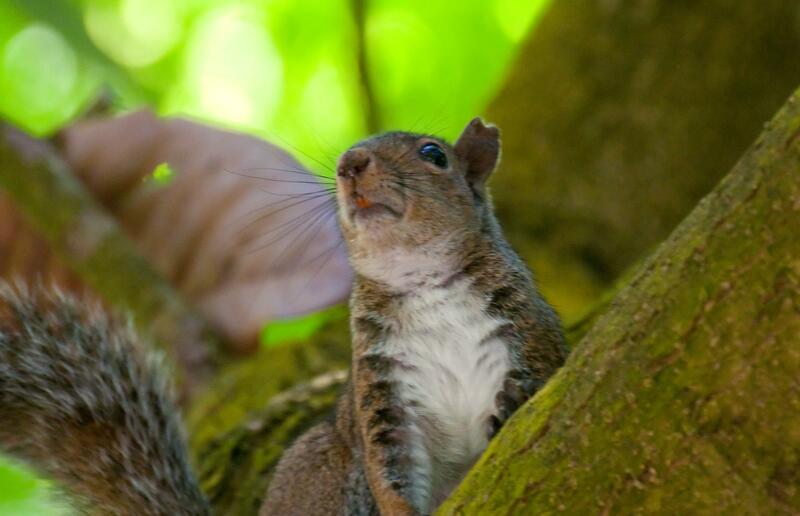 I believe we San Franciscans should campaign for better dental care for Our squirrels. Maybe we can get it on the next ballot. 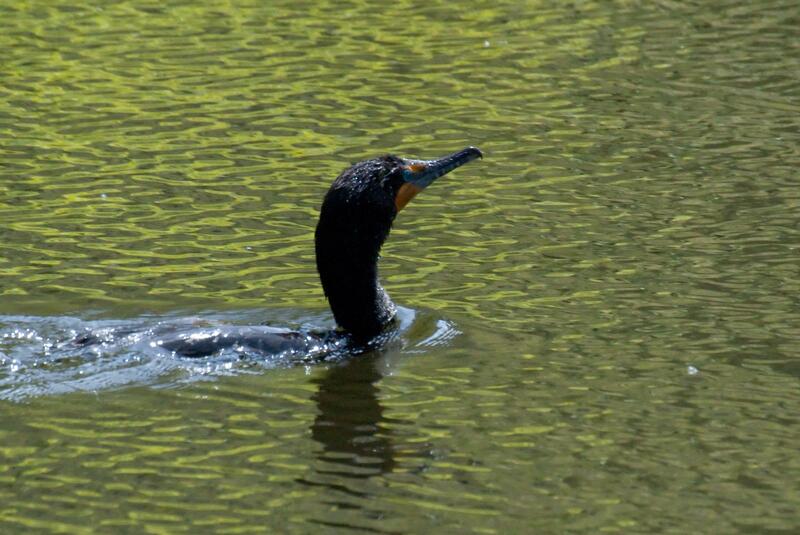 This cormorant appeared to swim in green water but the green was actually a reflection of trees. 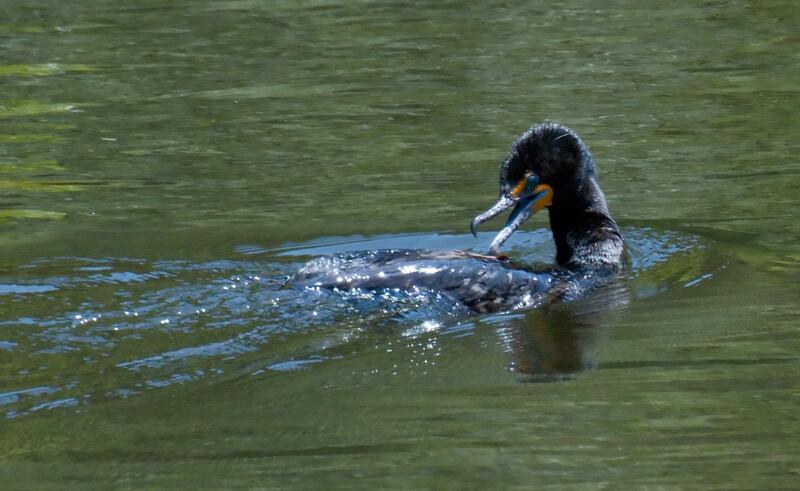 A cormorant was about to remove a leaf that had fallen onto its back. 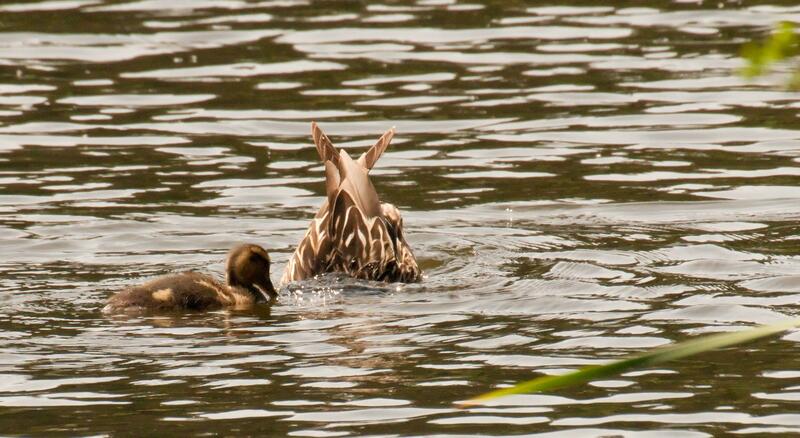 A mallard duckling observes Mom's dabbling technique. 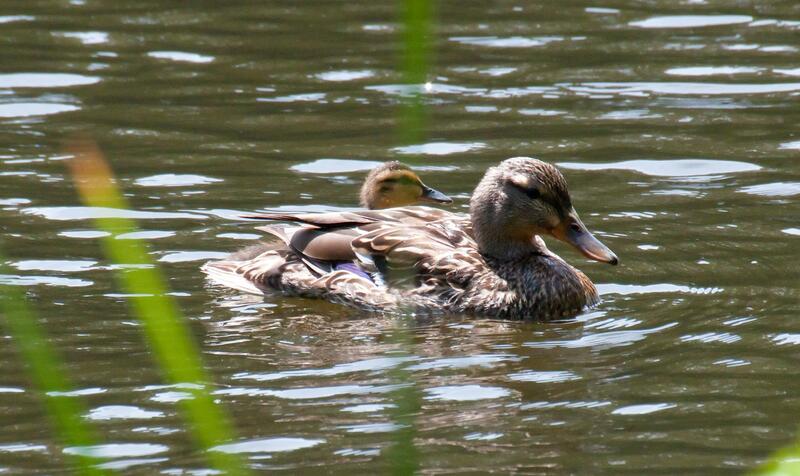 Here is a mallard hen with her one chick. I grew up to know this bird as the Oregon Junco with it's rufous flanks and black hood. Then I later learned it is really a Dark-eyed Junco and the Oregon Junco is a subspecies. 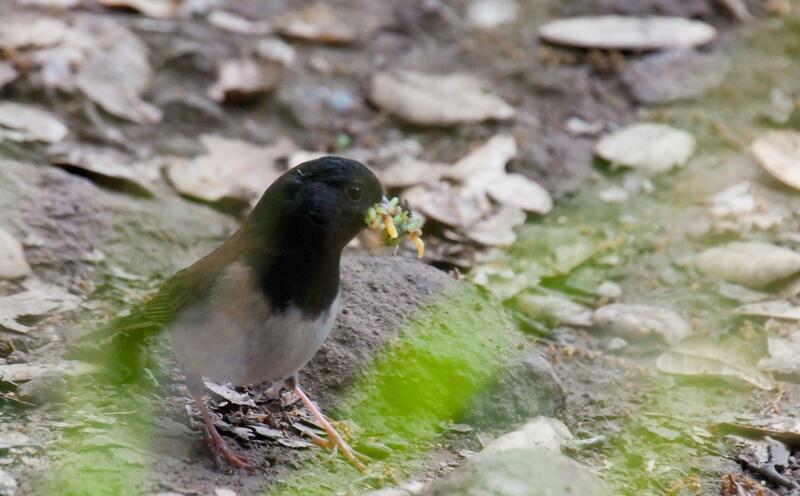 This species of Juncos is too large a group to be a subspecies so debate still goes on, but to me they will always be Oregon Juncos. 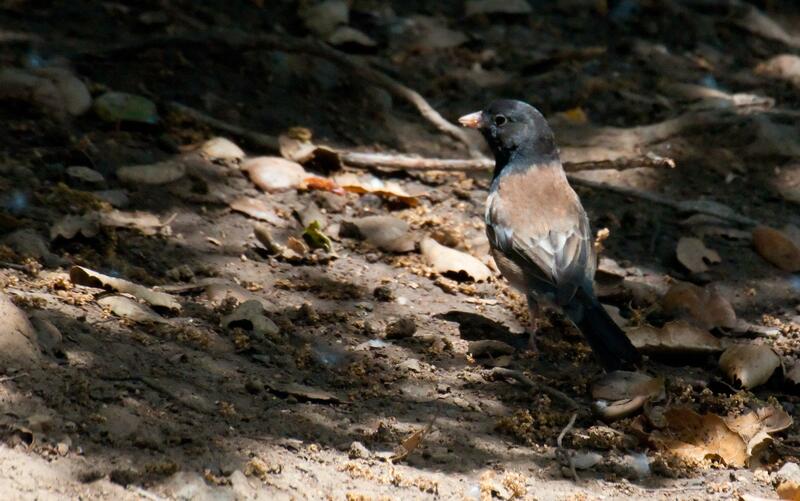 Here is a little guy foraging in the typical junco fashion, giving me a pretty sun-dappled photo. A bird with young to feed has a full time job and in this case a very full beak. A male mallard posed on a large tree limb that extended out over the water. The sunlight made his iridescent colors show well. 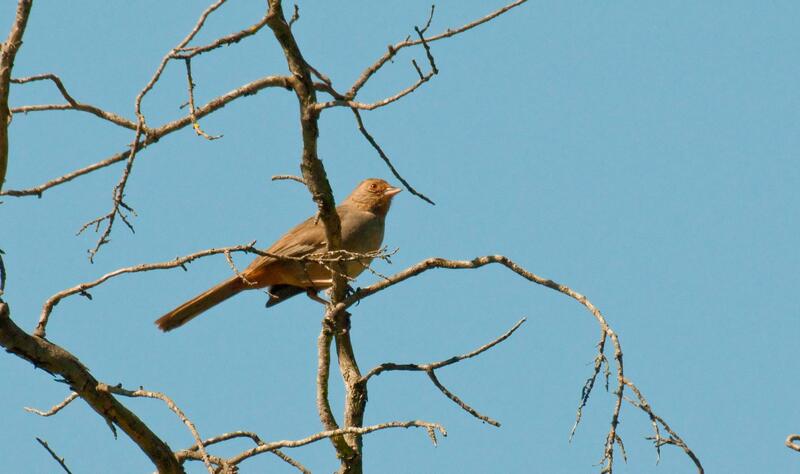 The typical Towhee is very shy and will scuttle away as soon as anyone approaches. 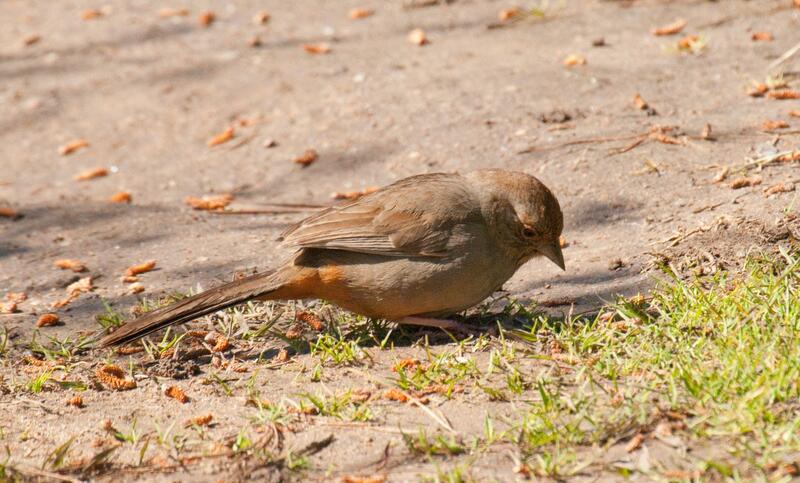 This Towhee however, allowed me to get quite close and seemed unpreturbed by me or other visitors to the park. 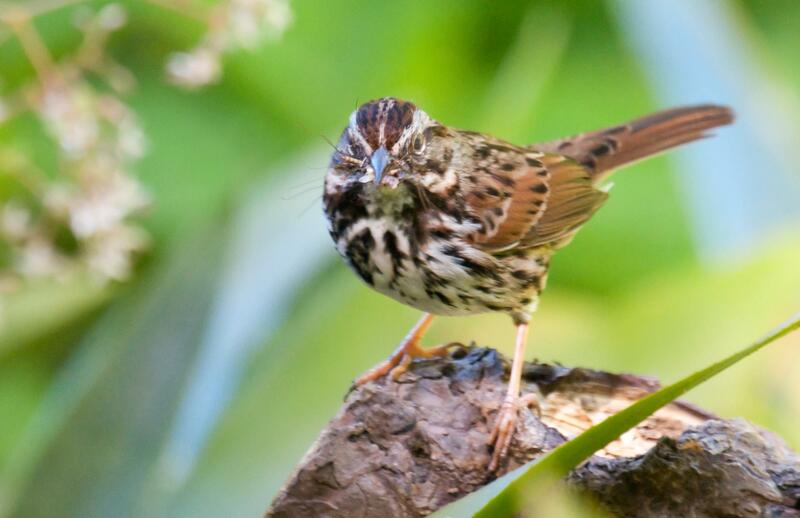 A song sparrow found a place to drink. I almost didn't see this well camouflaged and slow moving slug. He and I are both happy I didn't step on him. 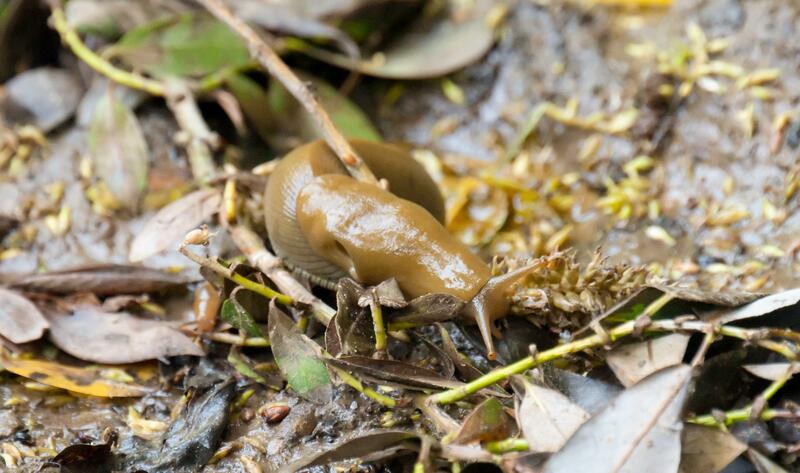 The Banana Slug is also famous for its role in sports. It is the official mascot of University of California at Santa Cruz. 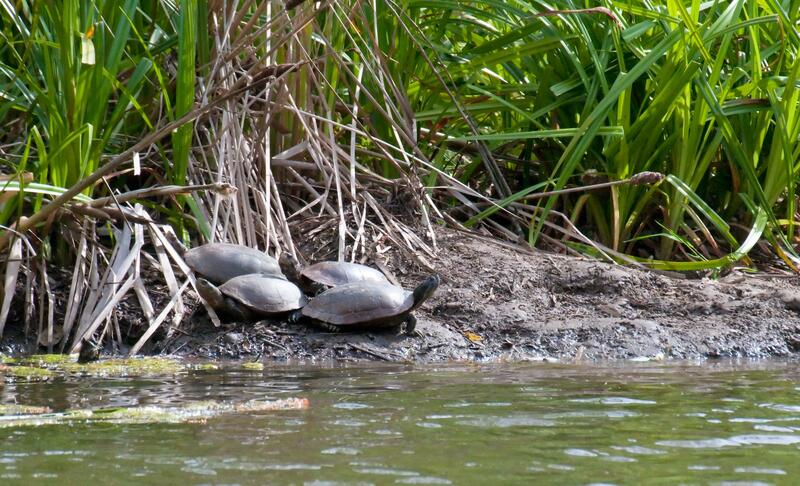 Four turtles sunned themselves just across the pond in the weak afternoon sunshine. 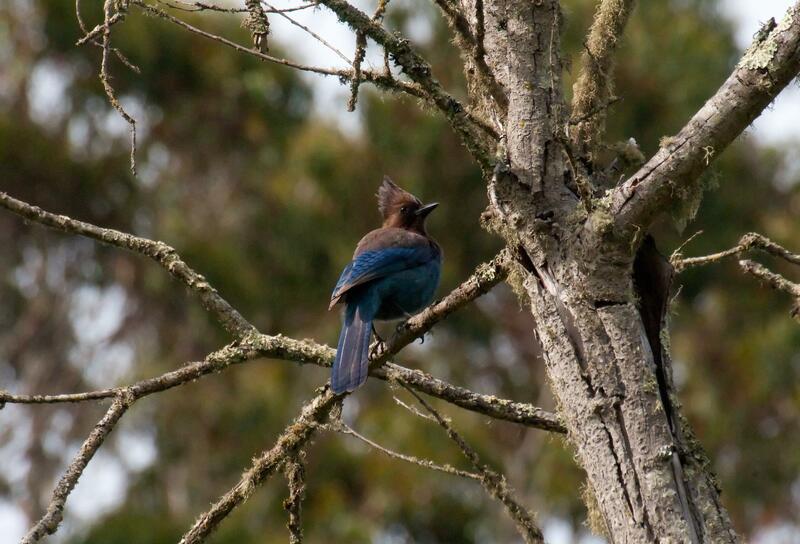 As we left Jewel Lake we were escorted out by a loud scolding Stellar's Jay. He was quite insistent that we had overstayed our welcome. 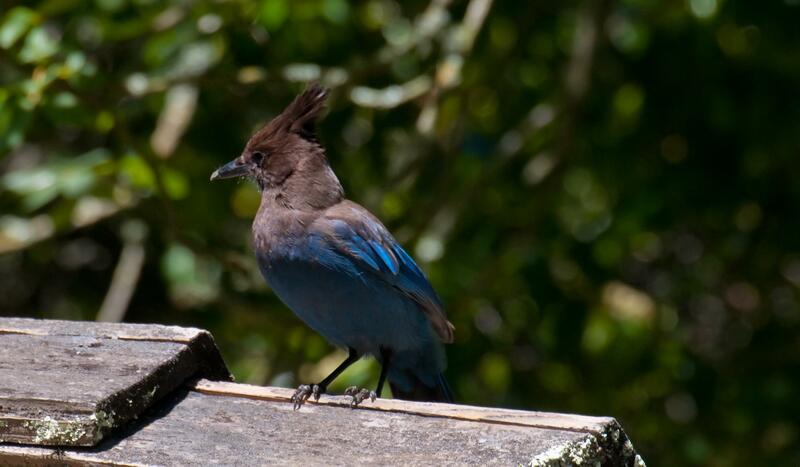 After "evicting" us from its part of the park, the jay watched and made sure we were actually leaving. 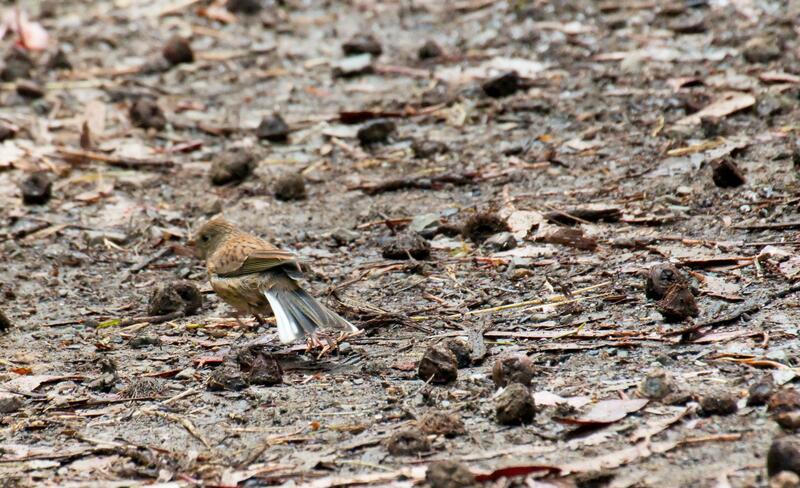 Two Phoebes were very active near Jewel Lake's shore. 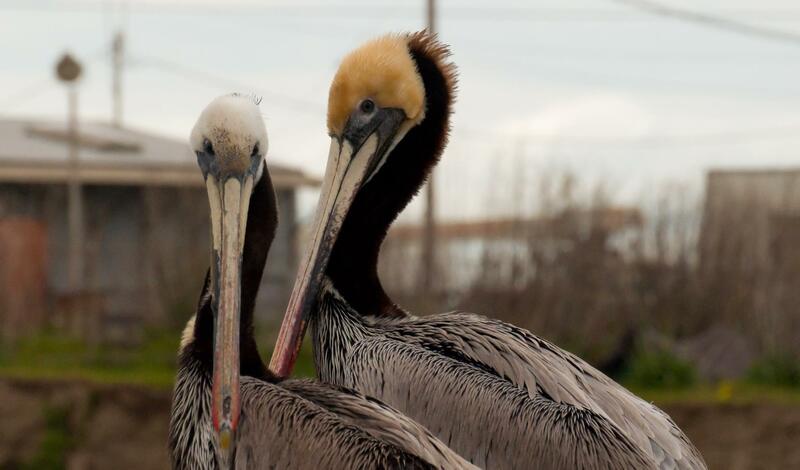 This nesting pair would each catch insects, pose on the spillway and then fly to feed their nesting young. Wilson's Warblers are numerous in California, yet this was the first one I had ever seen. Of course, since seeing my first, I now suddenly seem to find them on every outing. 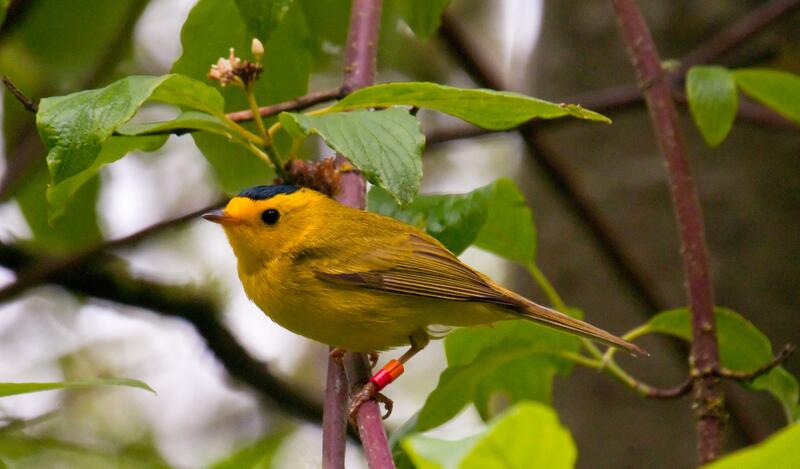 The Wilson's Warbler from yesterdays posting, viewed from a different angle, showed that it had been banded. The silver band was numbered and was issued by US Fish & Wildlife, the colored bands had letters and were issued by research groups. 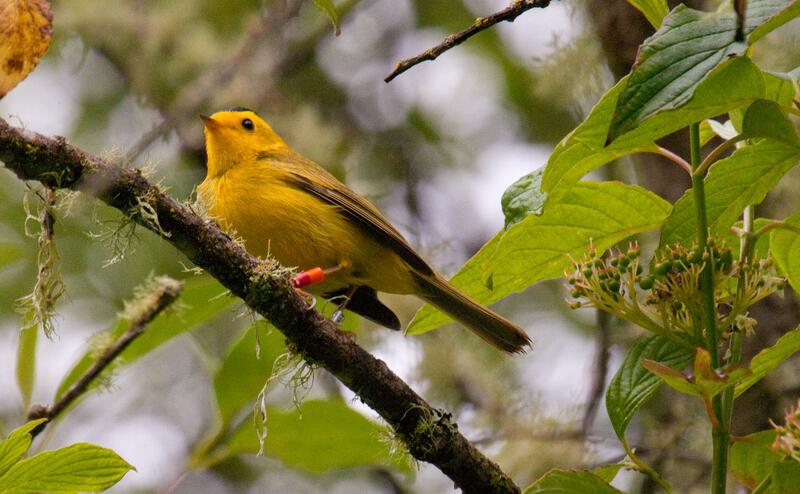 Each number and color could be used to access a database for info about that specific bird. 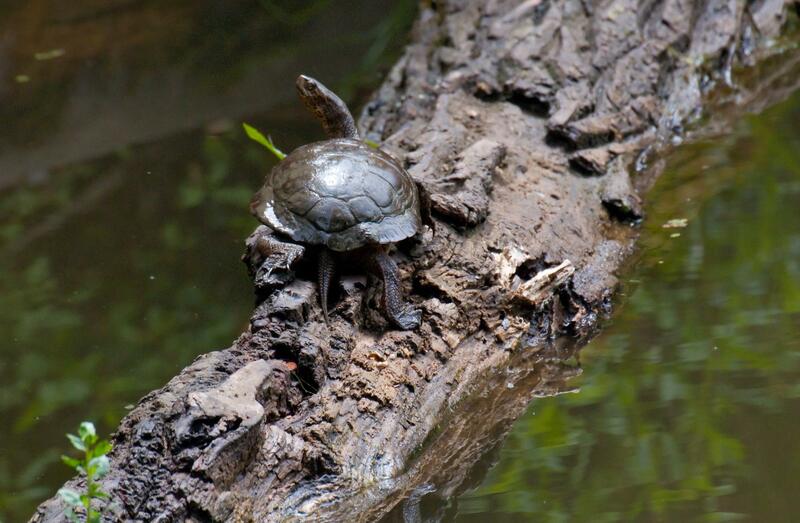 A solitary pond turtle suns itself on a log. Western Pond Turtles sunned themselves on a log in Jewel Lake. 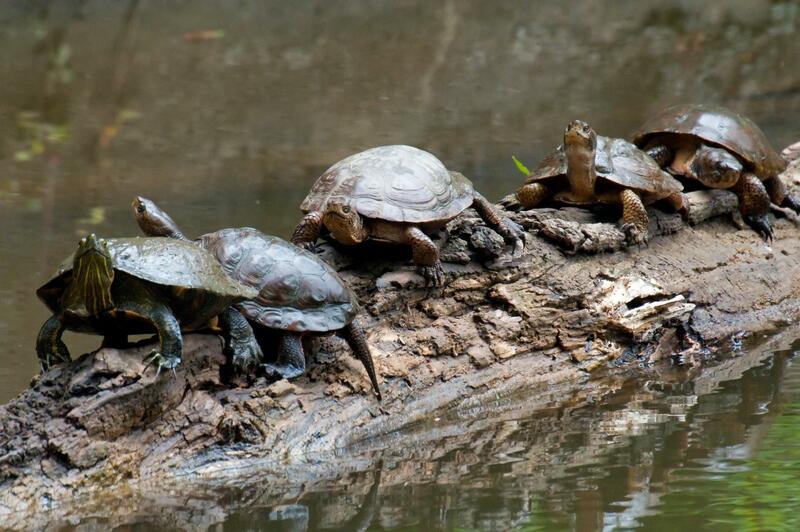 The leading turtle on the log however was a Red Slider. Perhaps a pet released after the owners became bored with it or the turtle became too big to remain cute. Red-eared Sliders are an invasive species native to the Southern US. 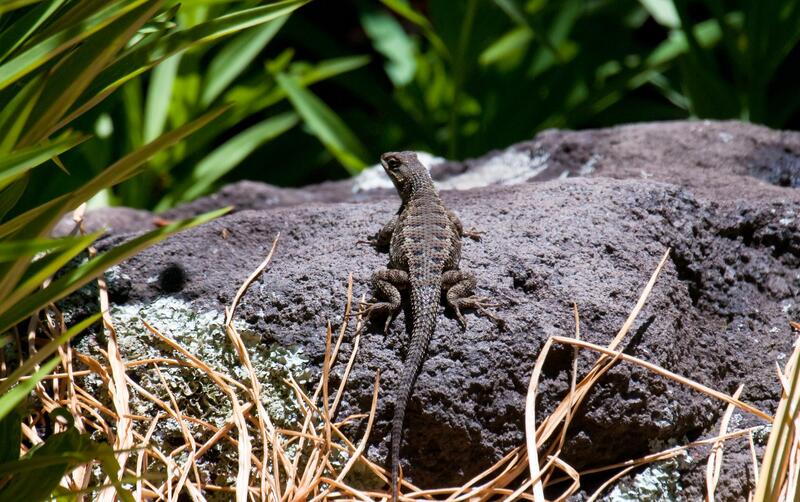 After they became common household pets they started showing up in Western states as well. Released in the wild they were "able to hybridize with native turtles damaging the integrity of the native species and introducing new pathogens to native animals." 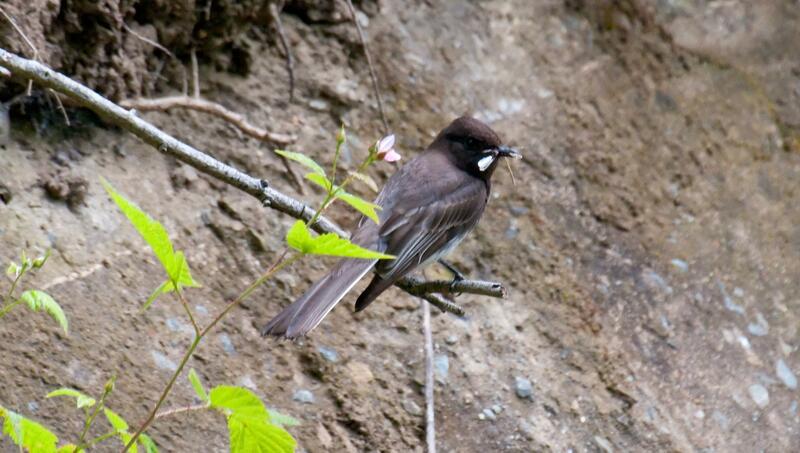 A Black Phoebe about to deliver lunch to it's young. 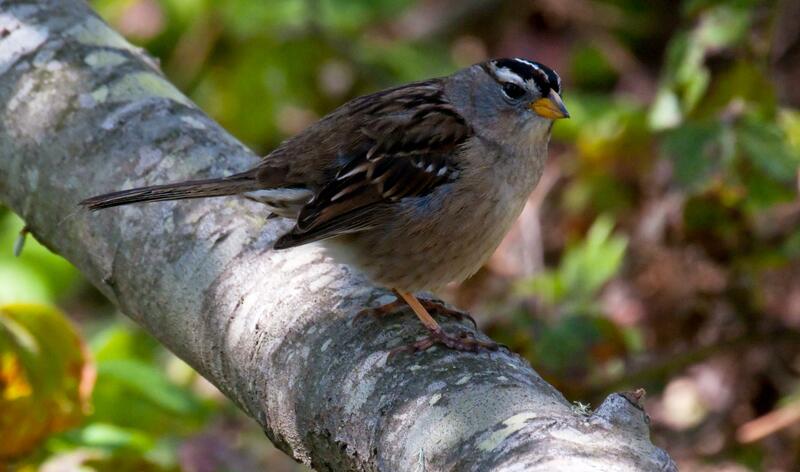 The white markings on the tail of a female Oregon Junco are only visible in flight. Or, in this case, just before take-off. 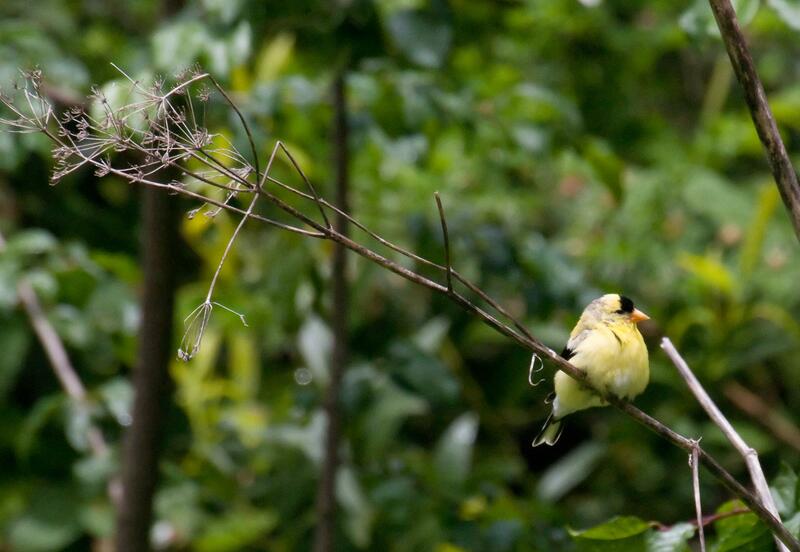 This male goldfinch was in transitional plumage, moving from non-breeding into breeding colors. He also appeared to be molting a bit, as goldfinches do twice a year. 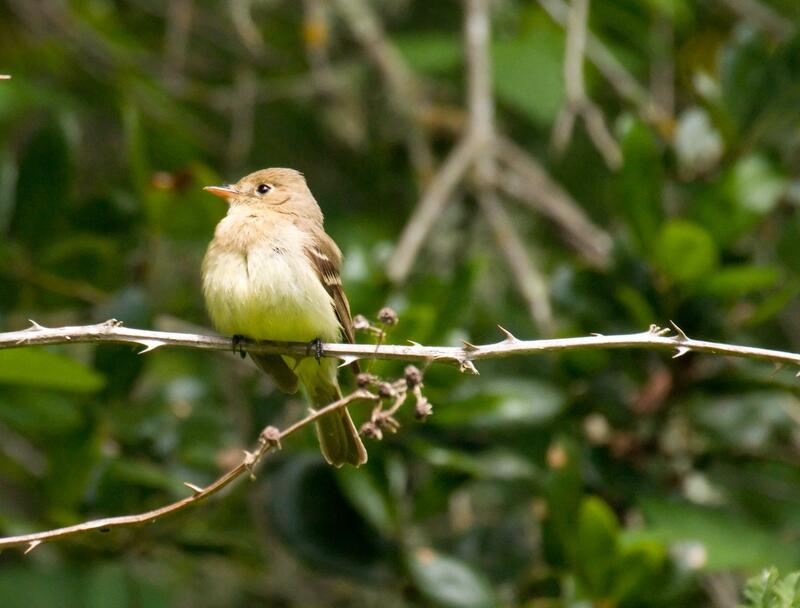 This Pacific-slope Flycatcher sat on its thorny branch and let me approach to within a few feet. 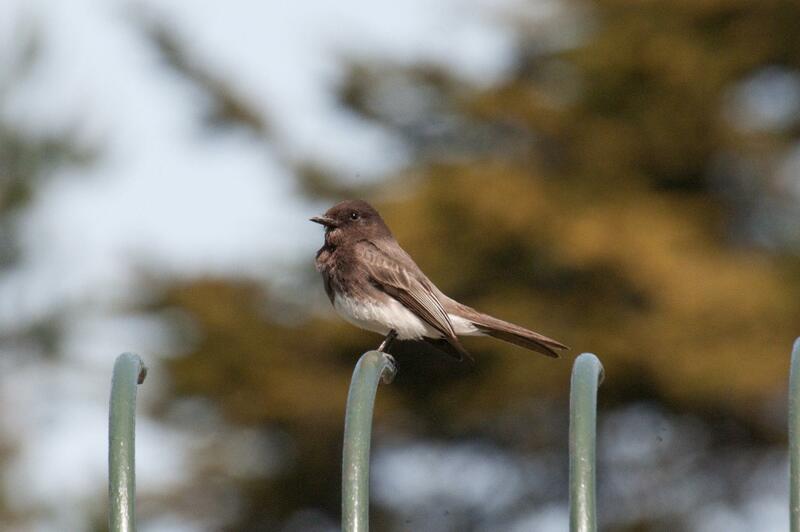 It was perched in the trees surrounding the now closed Pony Rides at Tilden Park. 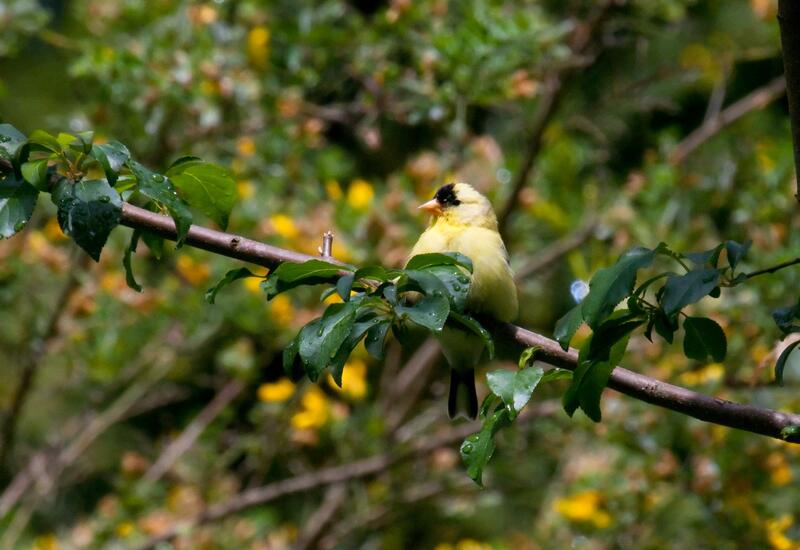 A male American Goldfinch coming into breeding plumage. Usually, a spotted towhee is seen in the underbrush. 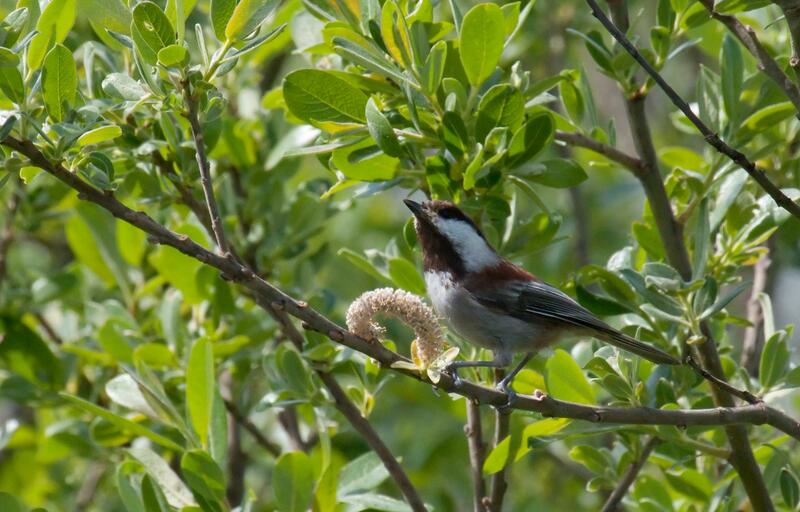 In the spring however, the male spends a great deal of time in the trees singing to attract a mate. 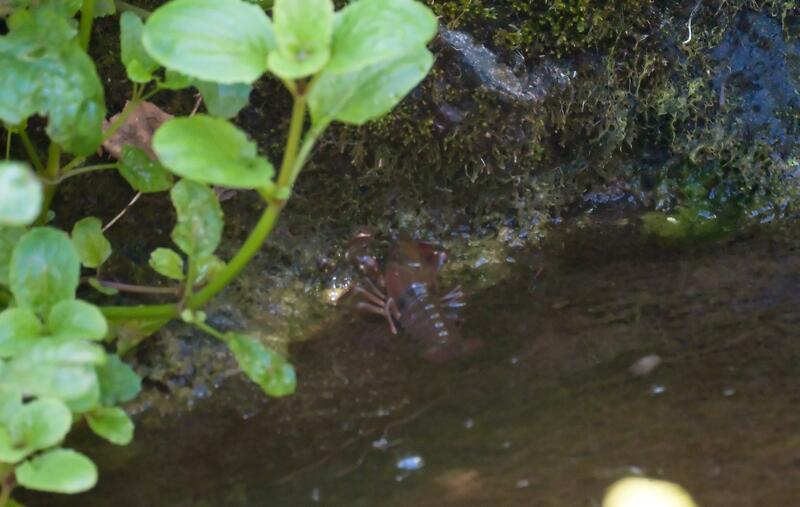 A crayfish was unexpectedly sighted in the Botanical Gardens. When I was a kid we called it a crawdad. 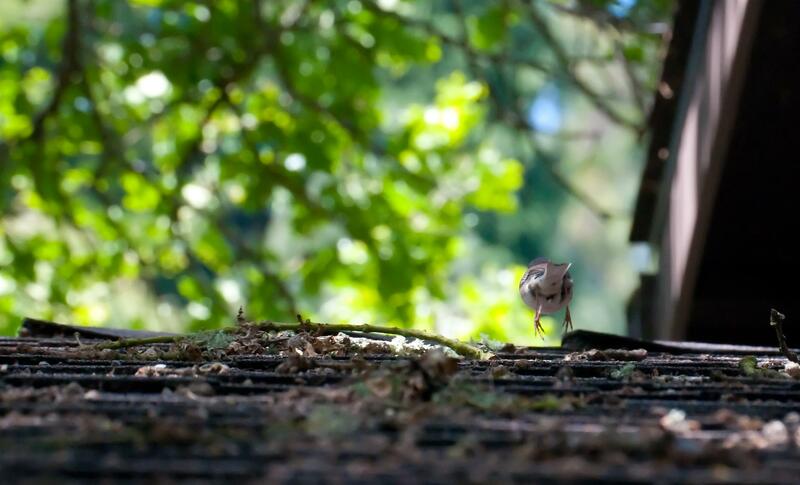 As we headed to the car I captured this last glimpse of an Oregon Junco just before he disappeared over the rooftop. I saw many lizards that day. This one was recharging his "solar batteries". When I was a kid we called this type of lizard a blue-belly. 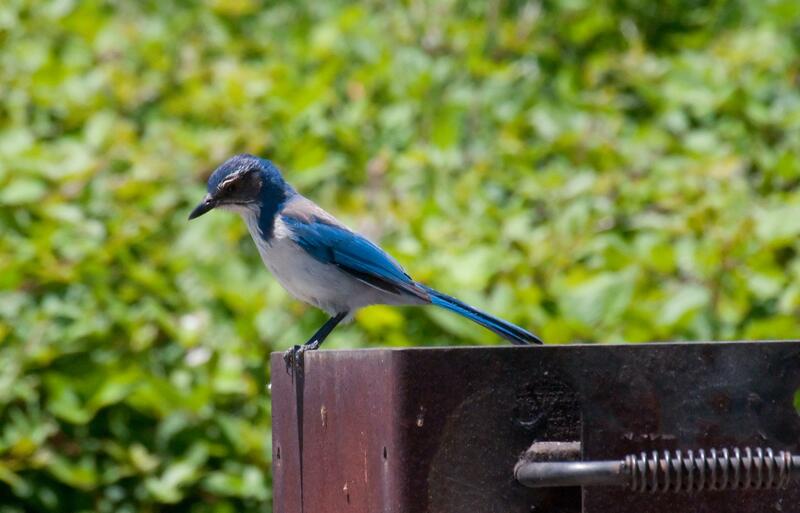 A Scrub Jay on a barbecue searched for food. 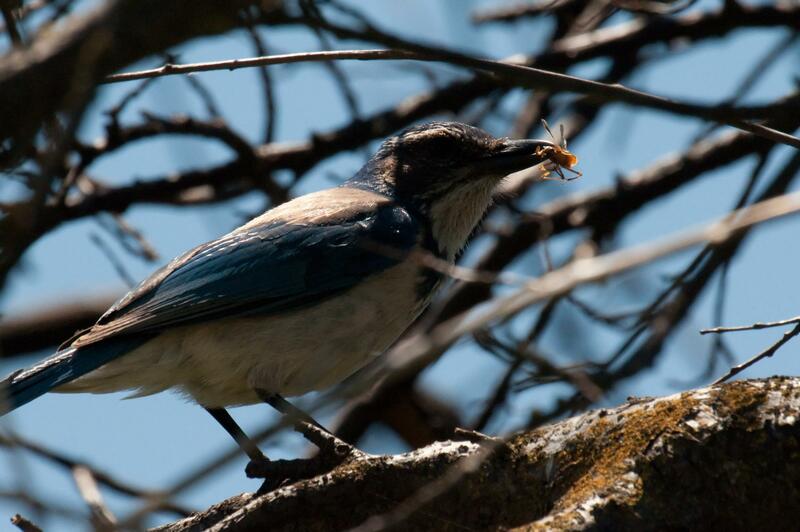 A Scrub Jay in a tree with a very large bug! 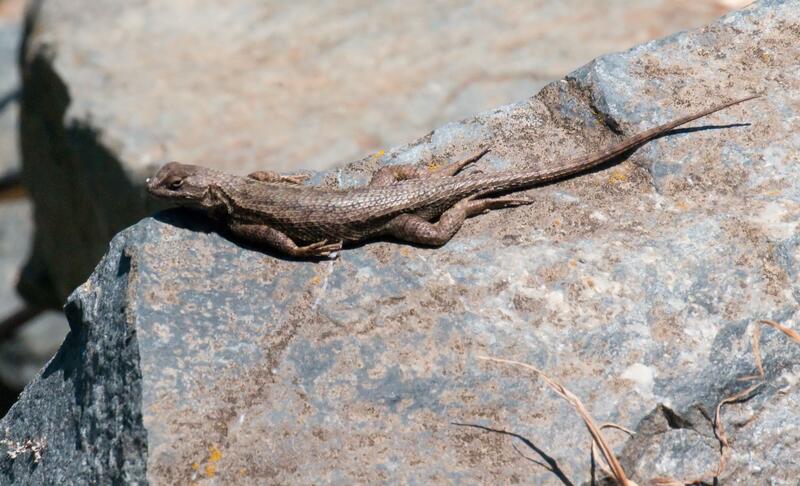 The same type of lizard I saw on Sherman Island was found in Tilden Park. Imagine a charcoal colored bird that landed in a birdbath filled with indigo-blue Easter Egg dye. 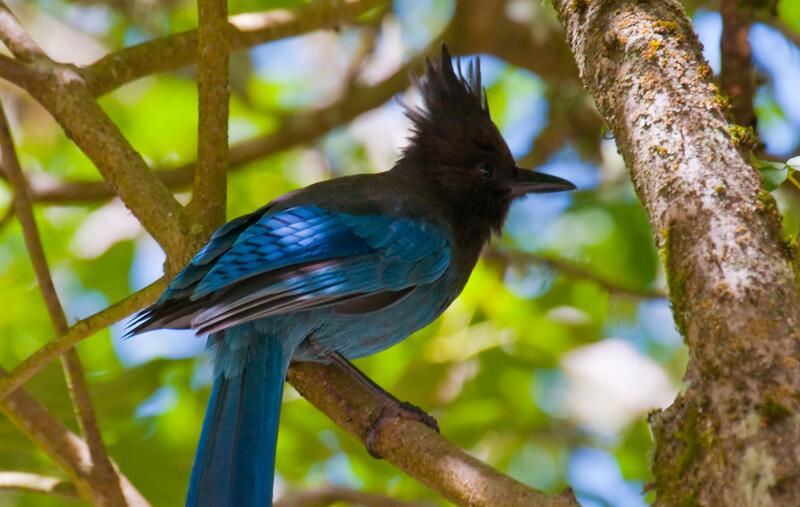 That's the Stellar's Jay. 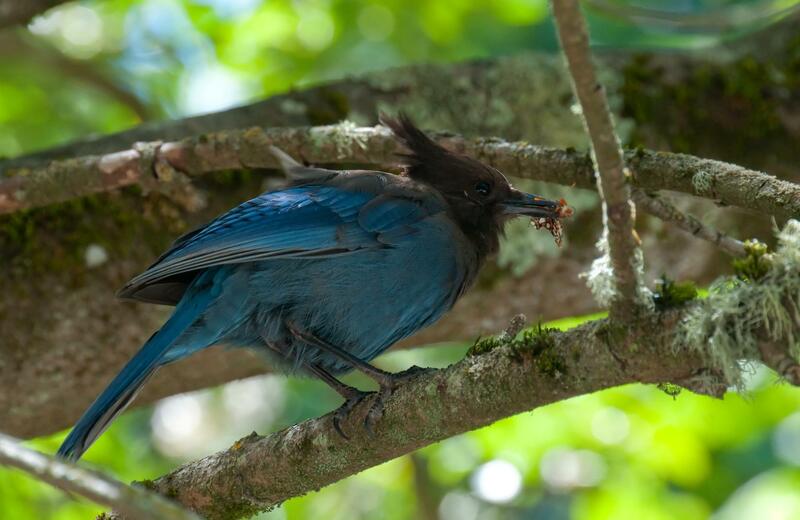 But in bright sunlight, the normally charcoal top of the Stellar's Jay appears brown. 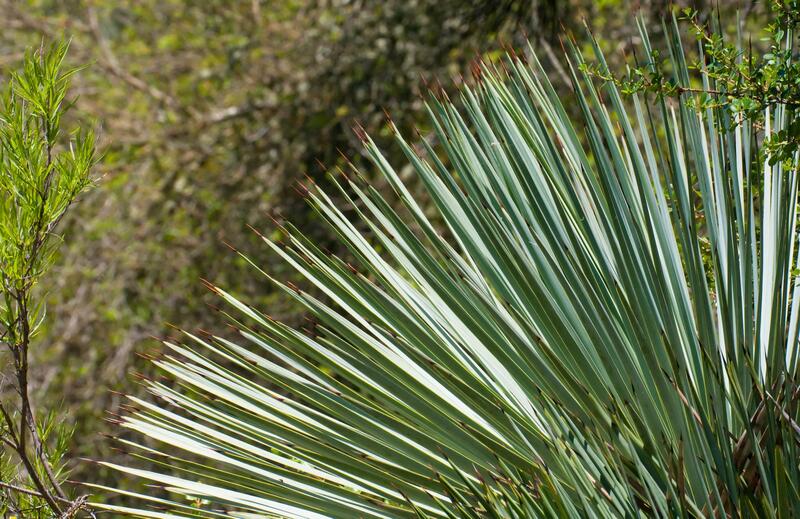 This dramatically spiny yucca plant was found just inside the gate. 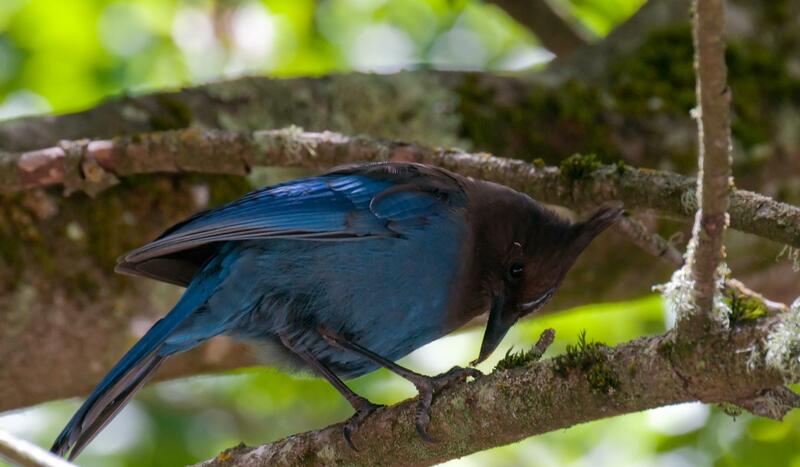 Is the Stellar's Jay a blue bird with a charcoal top or a charcoal bird with a blue bottom? 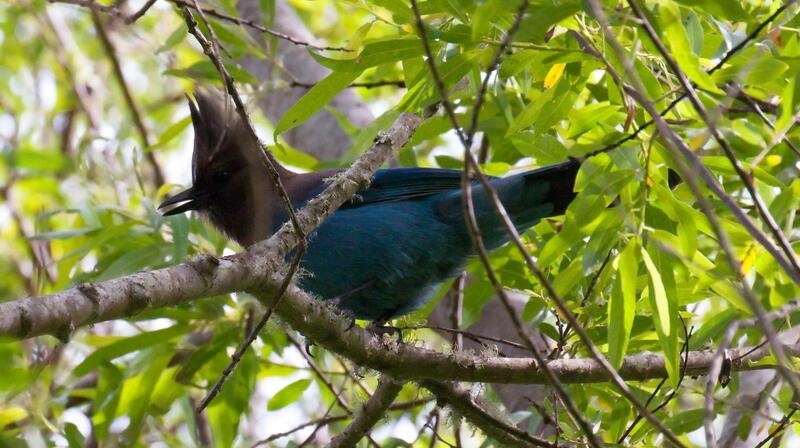 This Stellar's Jay held down a butterfly and pulled off it's wing's. Naughty bird. Pretty butterflies are often the food for pretty birds. A female Anna's Hummingbird sat quite still on a dried twig. For a moment. 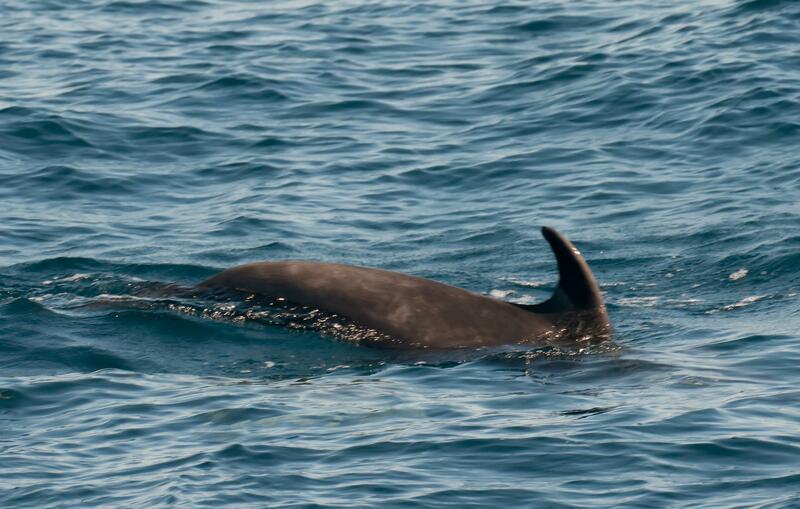 We encountered a pod of Bottlenose Dolphins on our return from a cruise around part of Anacapa Island in the Santa Barbara Channel . Some were leaping ahead and to the side of us while others raced with us. Seeing the dolphins was an unforgettable experience. 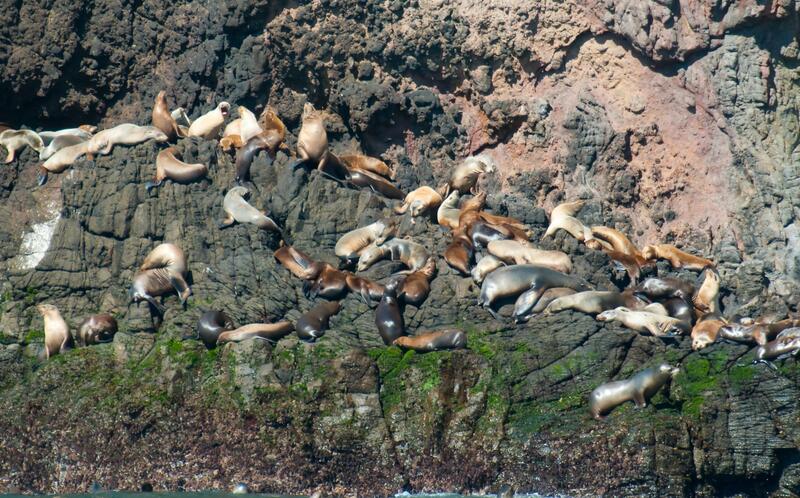 There are hundreds of sea lions on Anacapa Island. This group was on the side of the island that faced the mainland, but the majority of them were on the other side facing the sea, which we did see a few minutes later. 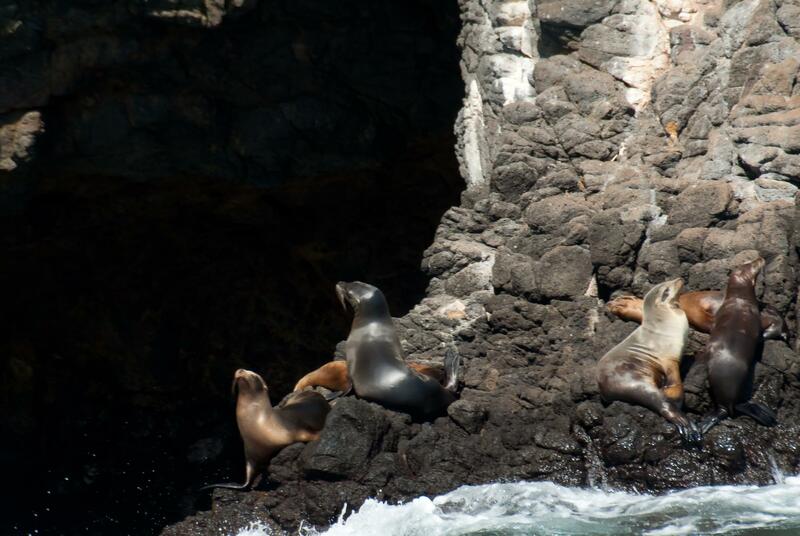 These sea lions looked great on the rocks next to the opening of a sea cave. 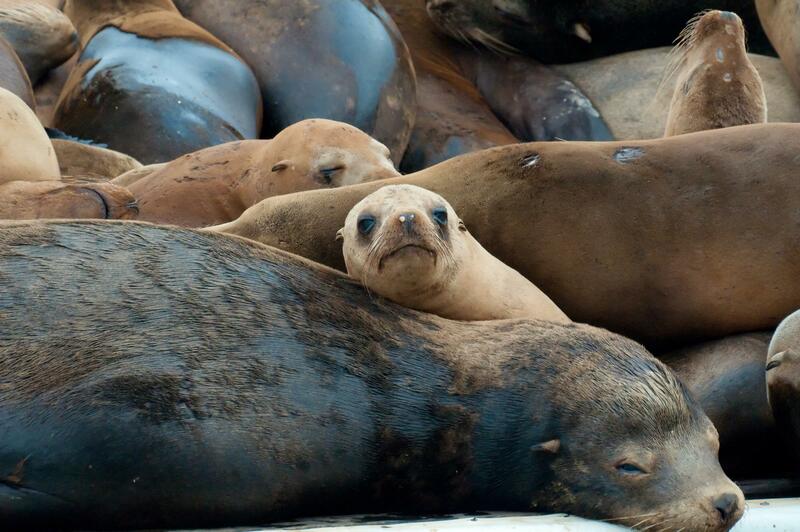 Seeing a large colony of sea lions in the wild is very different than seeing them in a manmade setting like Pier 39. 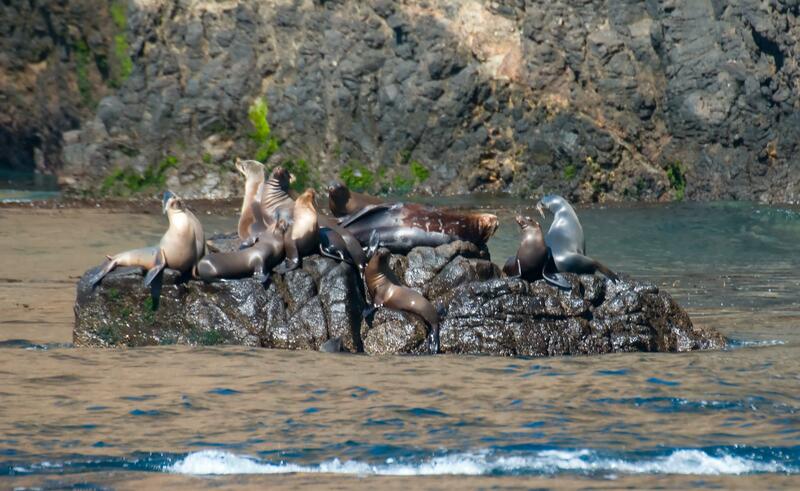 A small harem of sea lions on their private island. 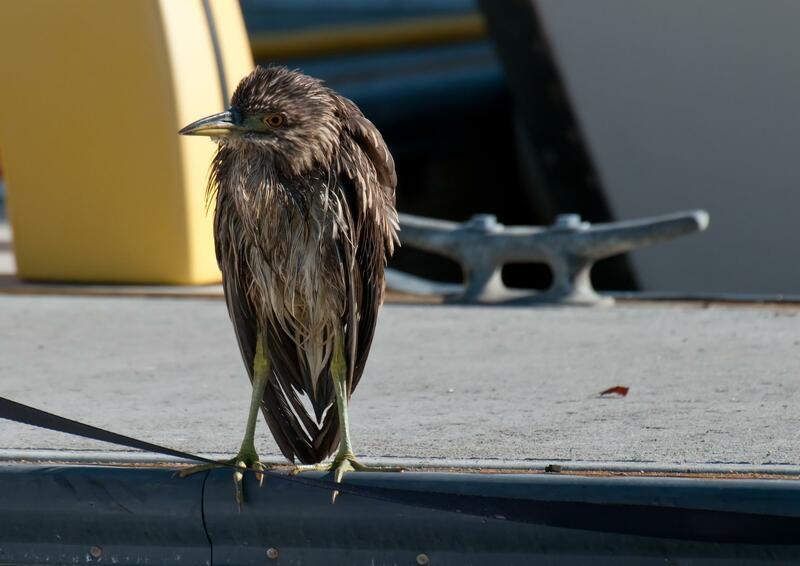 This bedraggled juvenile black-crowned night heron was perched on the dock near the boat we were going to use. I hoped it wasn't a harbinger of how our trip would turn out. A flock of pelicans flying in typical formation with Anacapa island in the background. 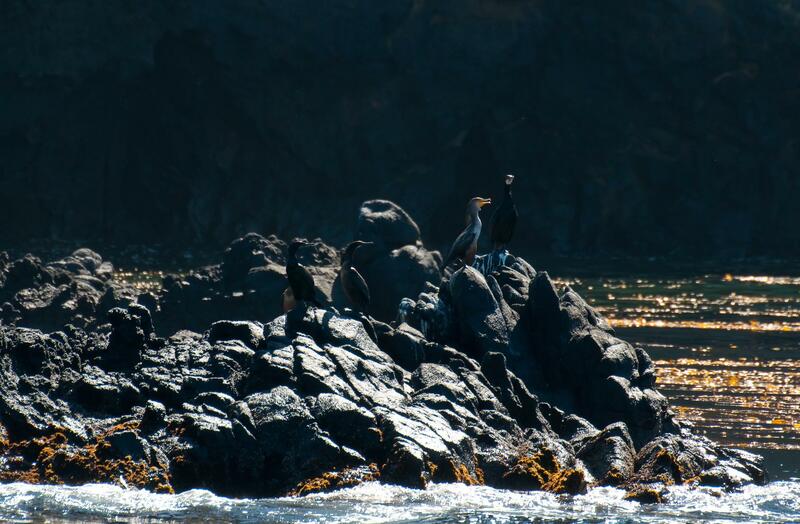 Close to Anacapa there were scores of seabirds and the light was lovely. 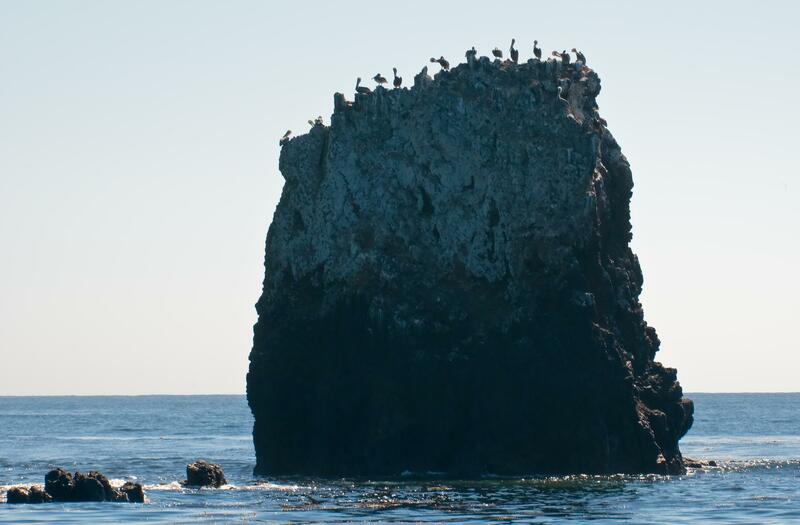 The rocks surrounding Anacapa Island are dramatic and favored by pelicans. 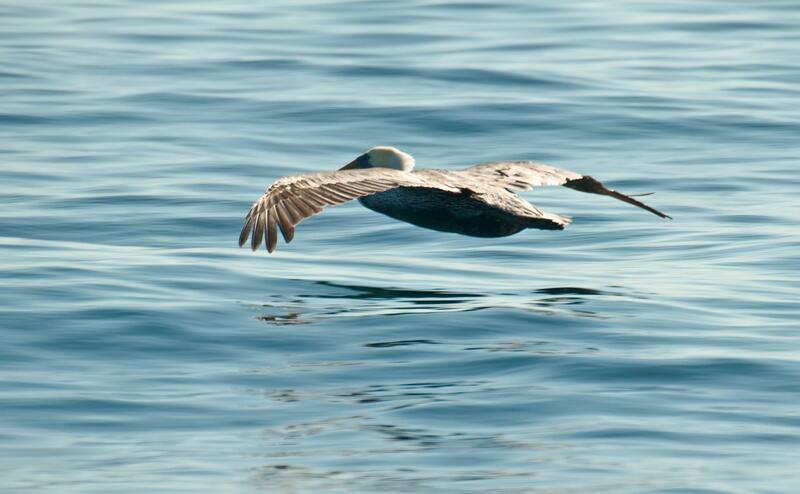 The pelican glides effortlessly over the surface of the sea. 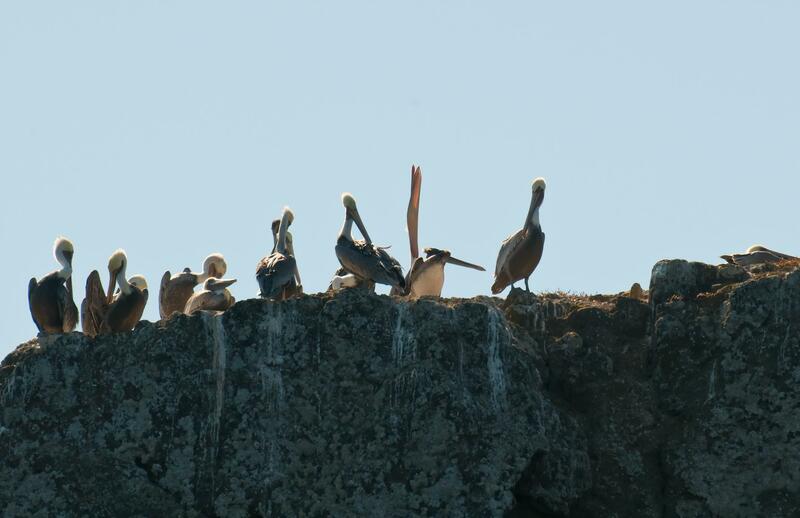 This wall of pelicans was only a small sampling of the hundreds on the island. 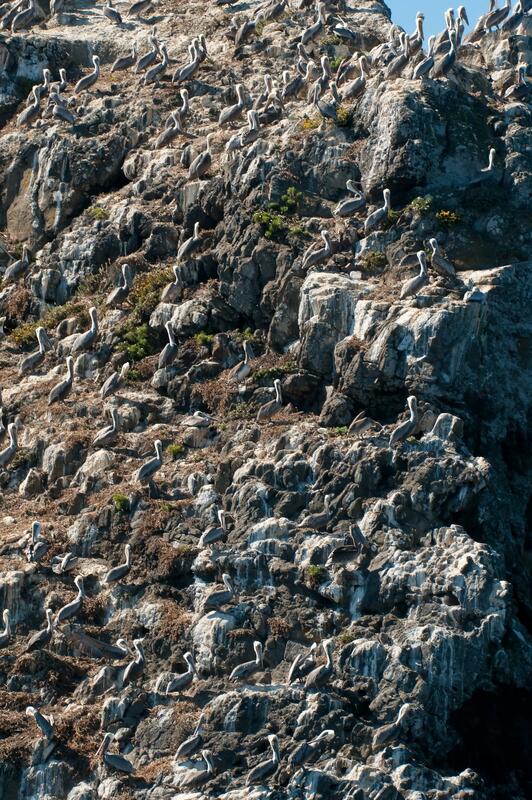 Pelicans sunned themselves high atop a large rock cliff. 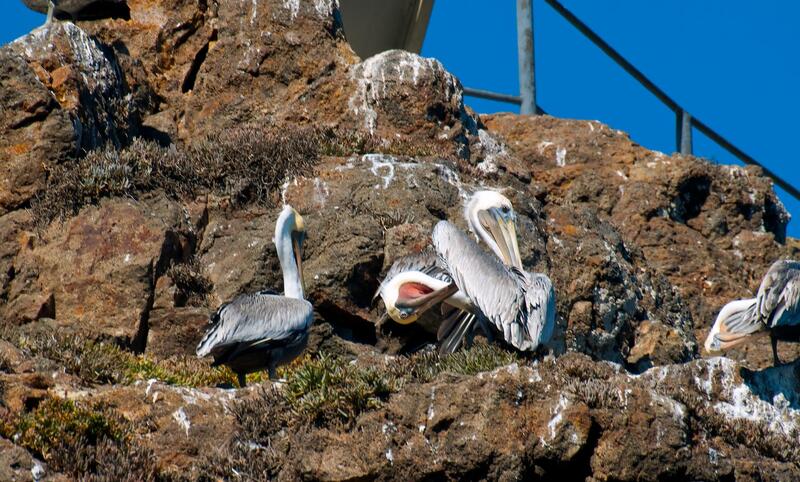 A closer look at pelicans on the cliff face. 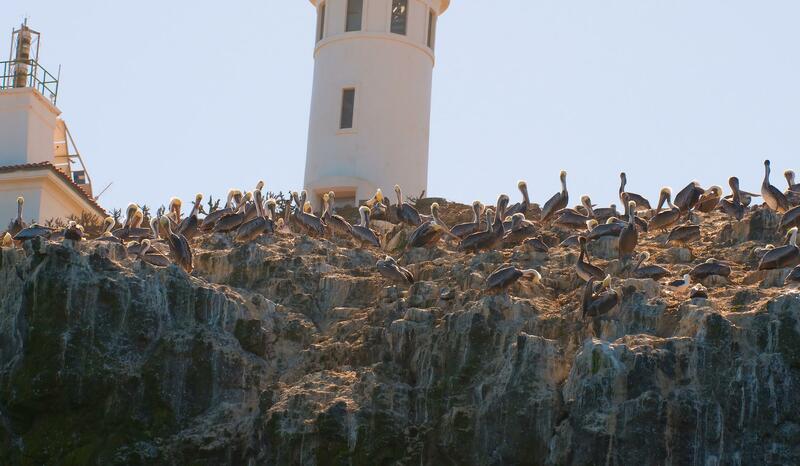 Pelicans roosting near the Anacapa lighthouse. 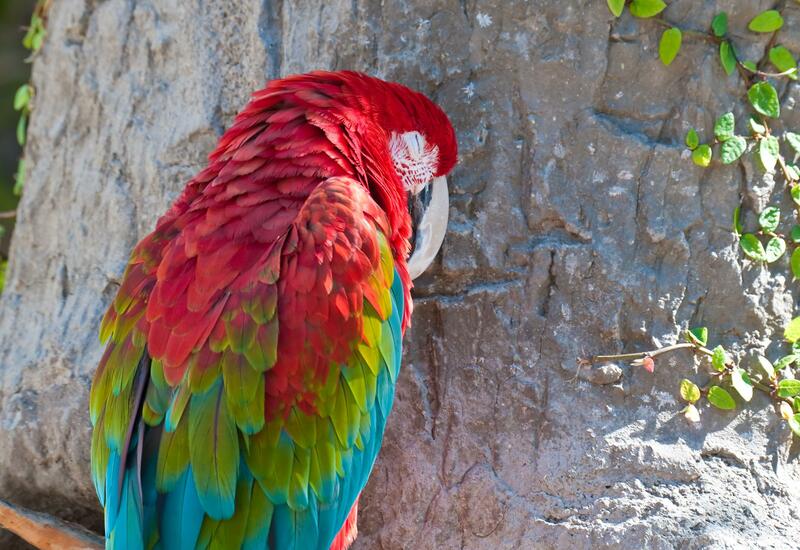 The Green-winged Macaw goes by many names: Greenwing Macaw, Red and Green Macaw and Green Wing Macaw. 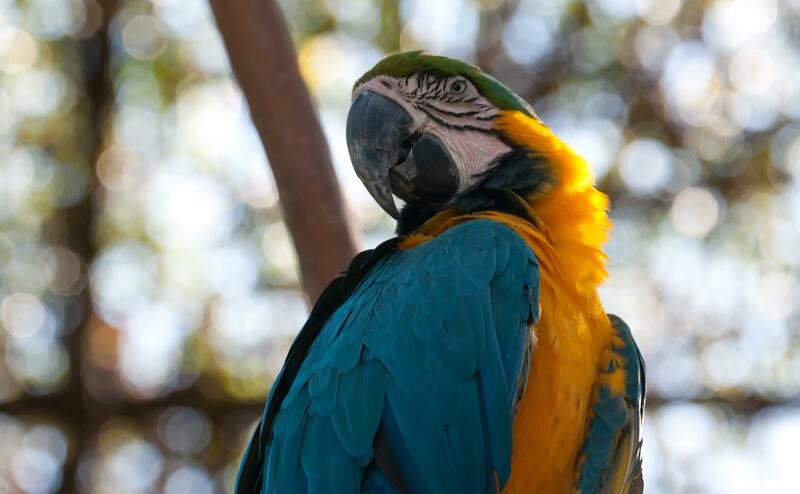 They are one of the largest and gentlest of all the Macaws. 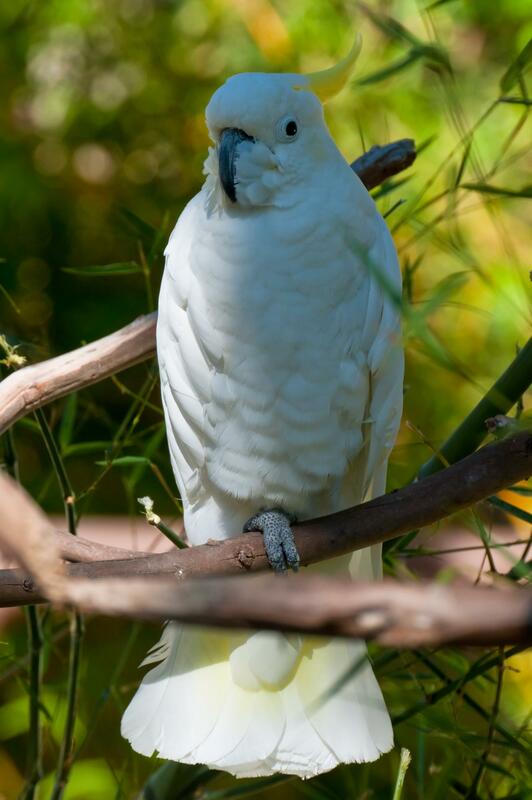 This cockatoo seemed healthy and alert but very quiet. A loud, large, parrot looking quite handsome. No, that's not its trunk. 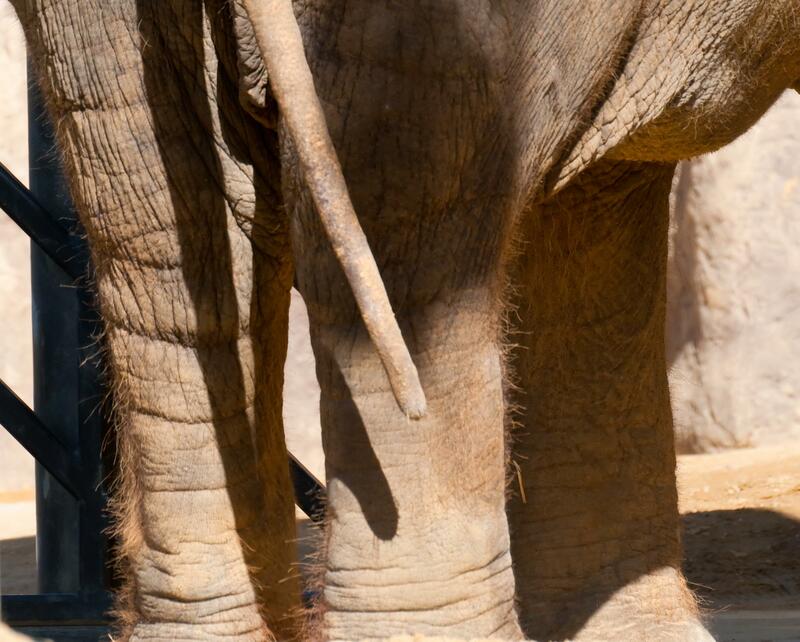 It's the tail of an Asian Elephant. 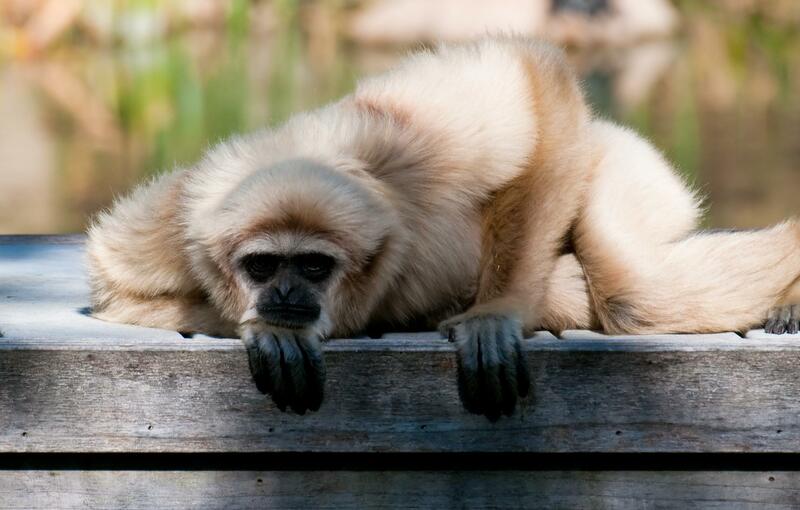 Also known as the white-handed gibbon, this Lar Gibbon lazed in the afternoon sun. These gibbons have colorings that range from black to white with all shades of brown in between. The improbable flamingo pondering its place in natural history. 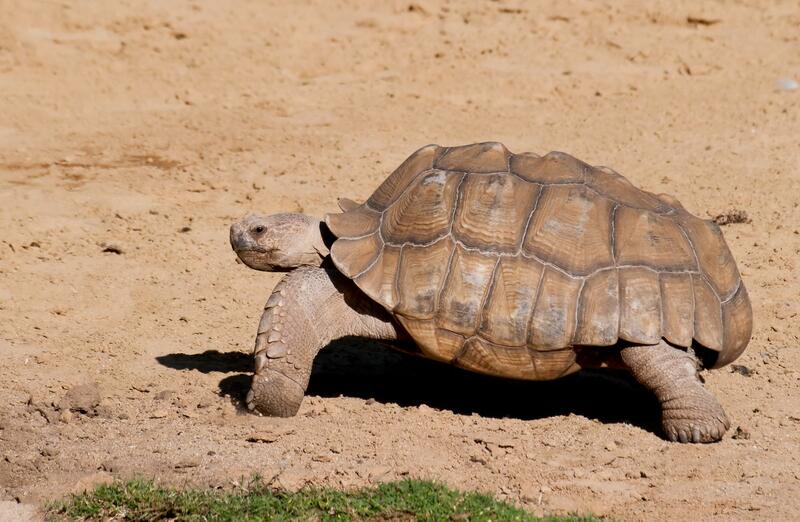 A very large, old Leopard Tortoise sunned itself that afternoon. 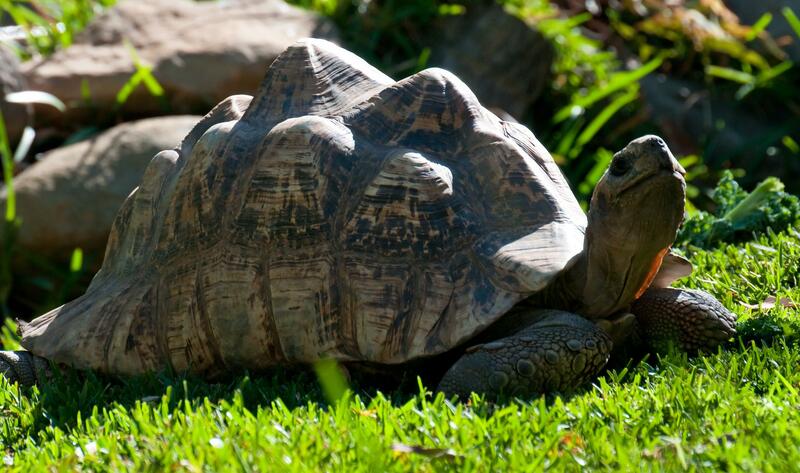 A very large tortoise with an imposing look. 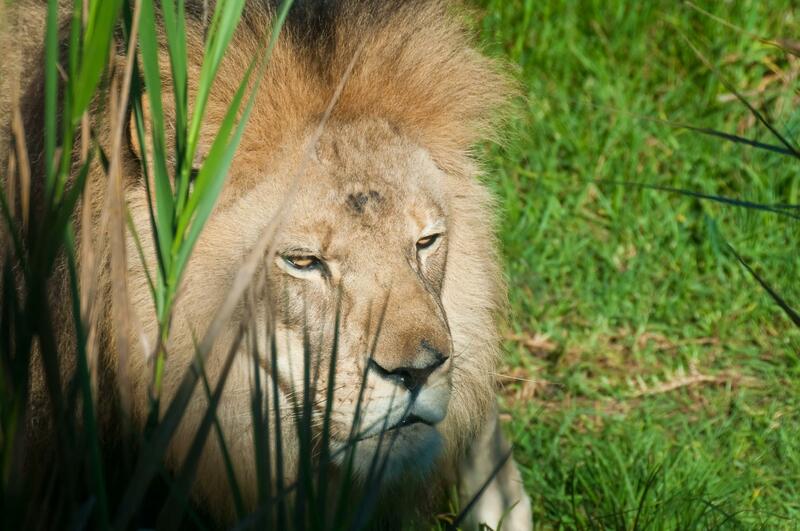 Catching the afternoon sun, the master of the grasses rests in its domain. 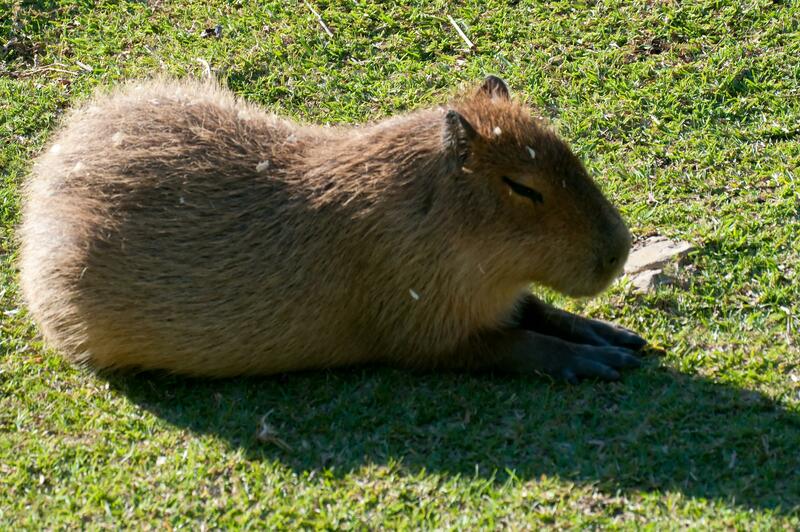 This Capybara needs a good brushing. 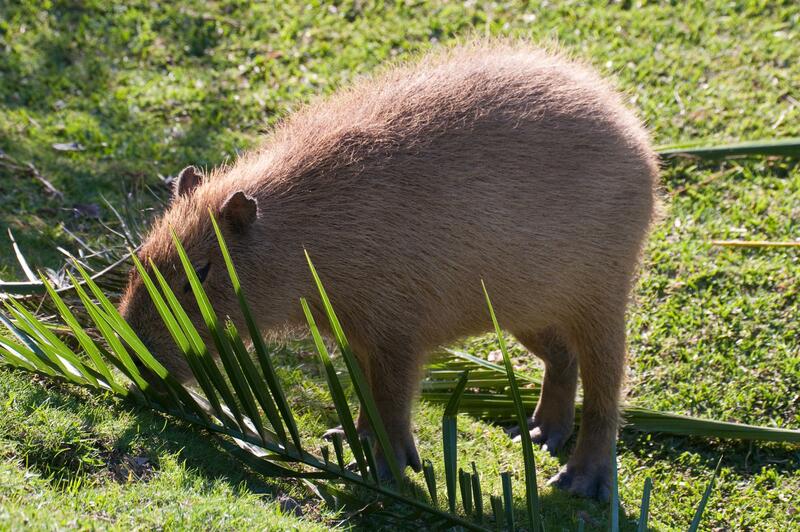 A capybara peeking coyly from behind its giant palm frond. 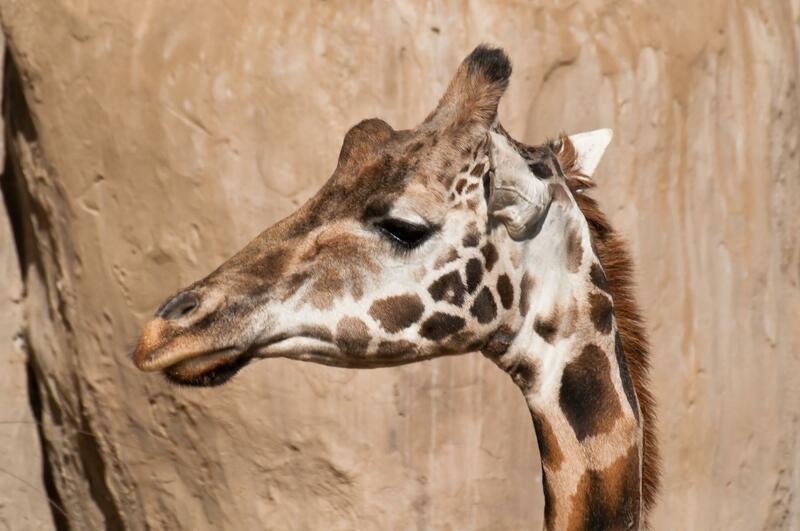 The Santa Barbara zoo called this giraffe a Baringo giraffe. It was originally named the Rothschild giraffe and now sometimes called the Ugandan giraffe. No matter its name, it is a threatened species of giraffe. 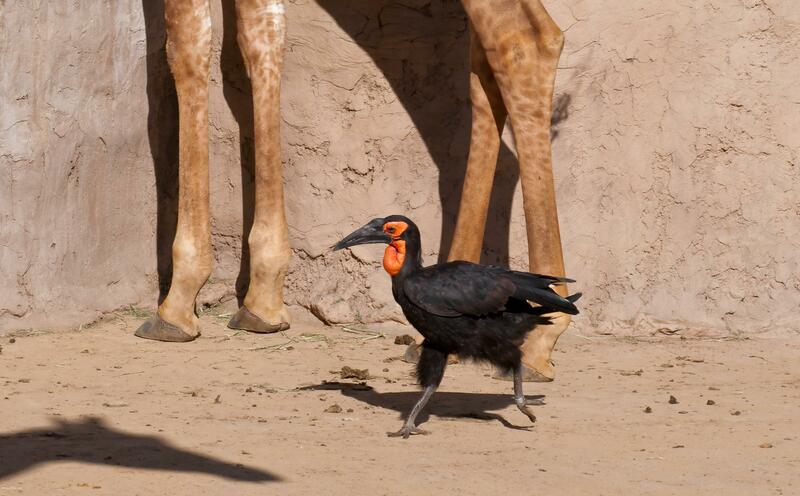 Several energetic hornbills rarely stopped their rapid walk around the giraffe enclosure. 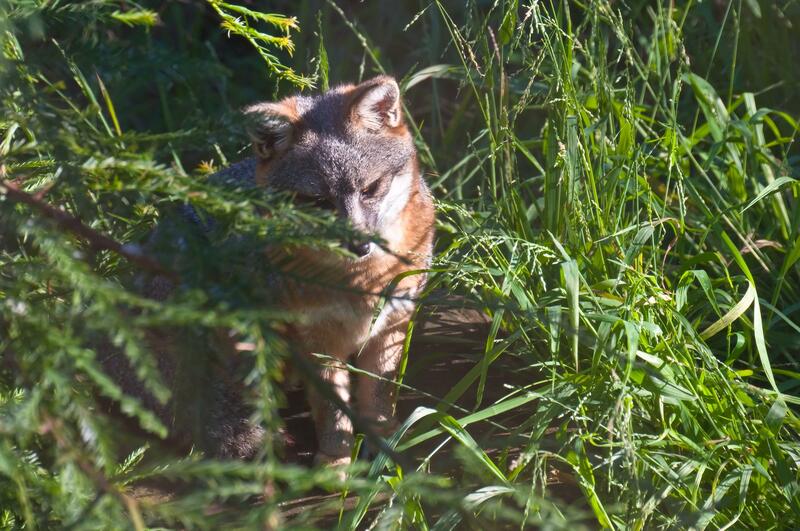 The Island Fox is only found on the Santa Barbara Channel Islands. Each of those six islands has its own subspecies of this little fox. Very Galapagos of them. 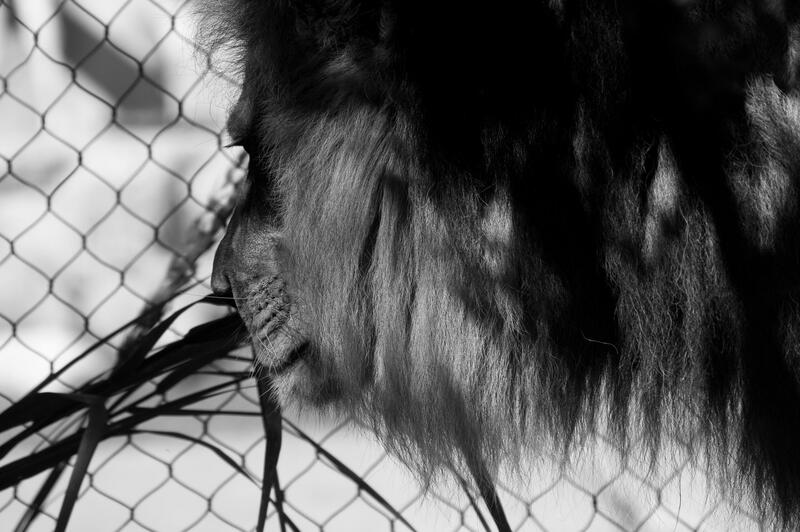 The King of the Jungle appeared regal that day. 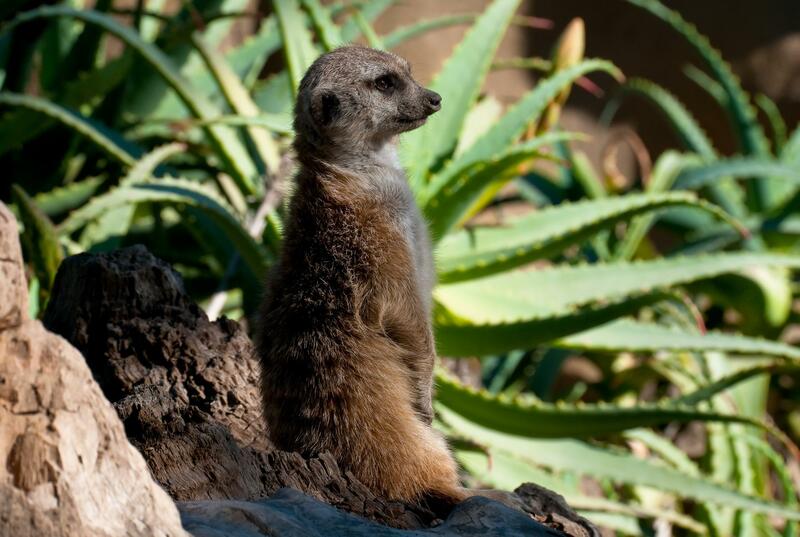 A meerkat taking his turn as sentry. 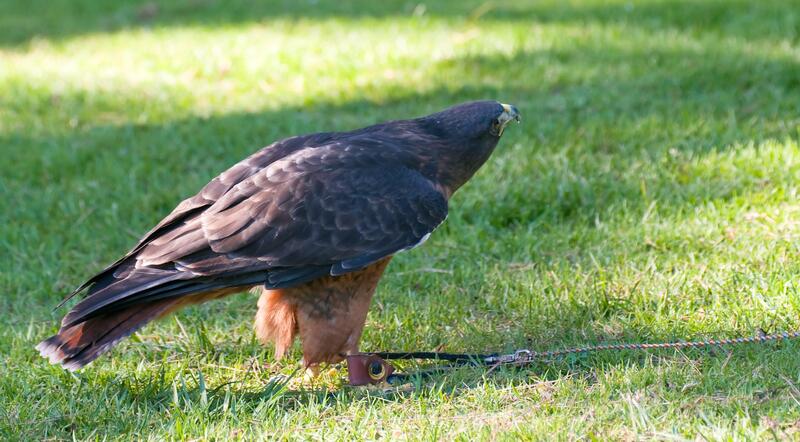 This Red-tailed hawk was being trained that afternoon. He flew down to gobble a tossed tidbit and then contemplated his flight back up to the keepers arm. 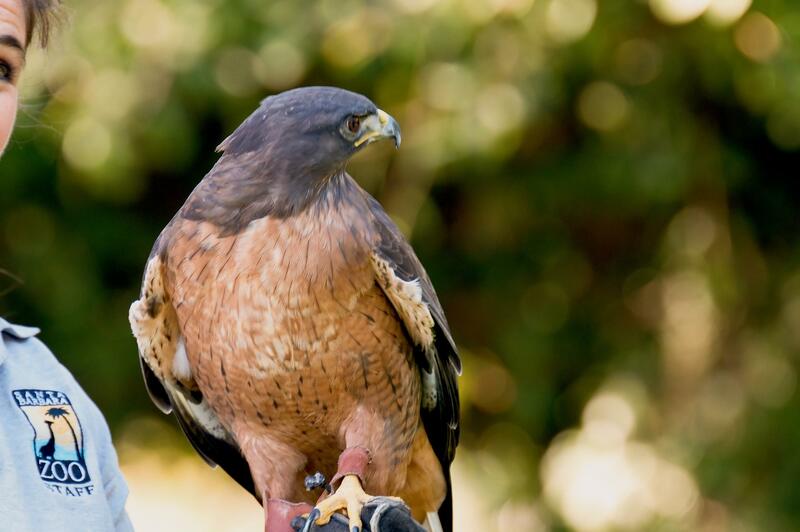 A Red-tailed hawk perched on the keeper's arm.